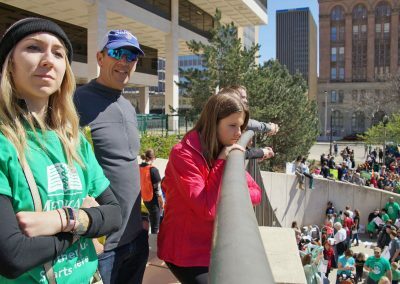 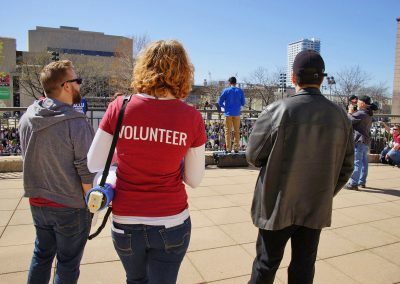 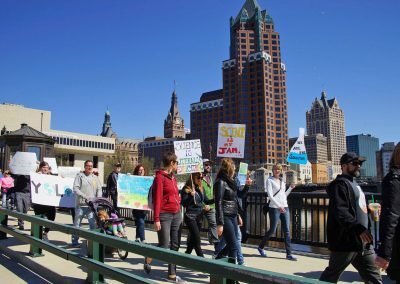 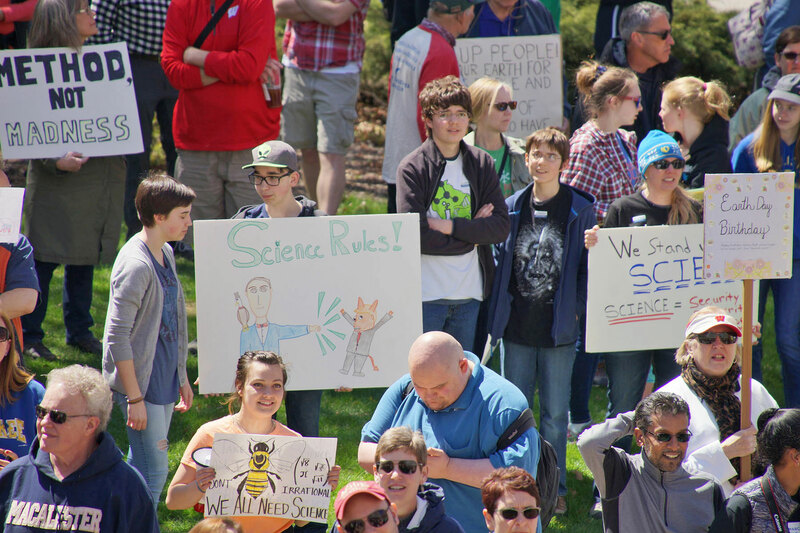 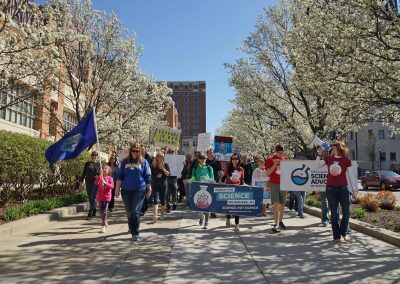 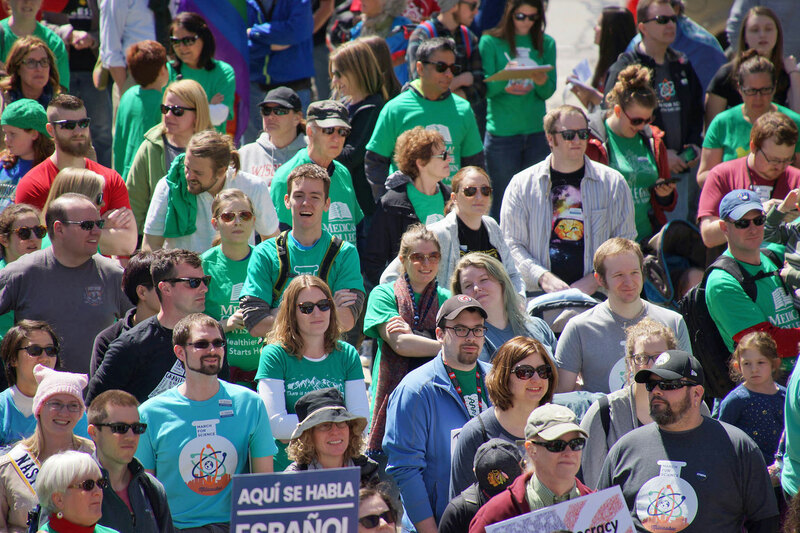 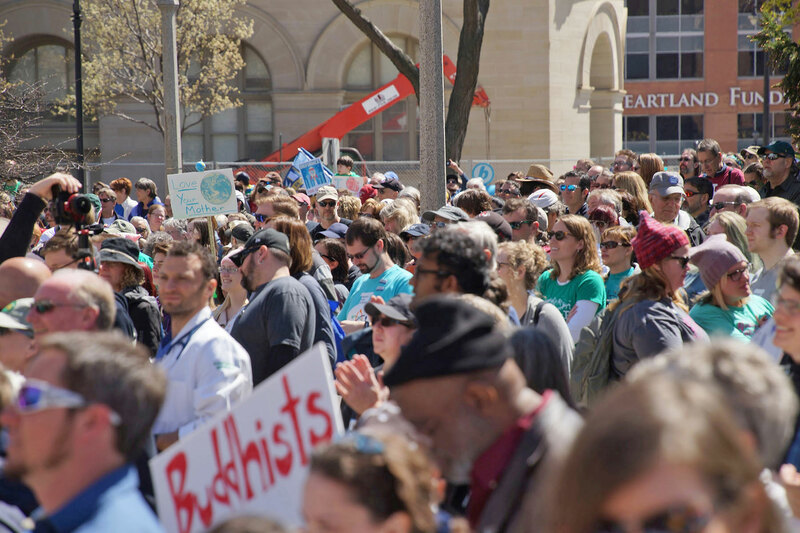 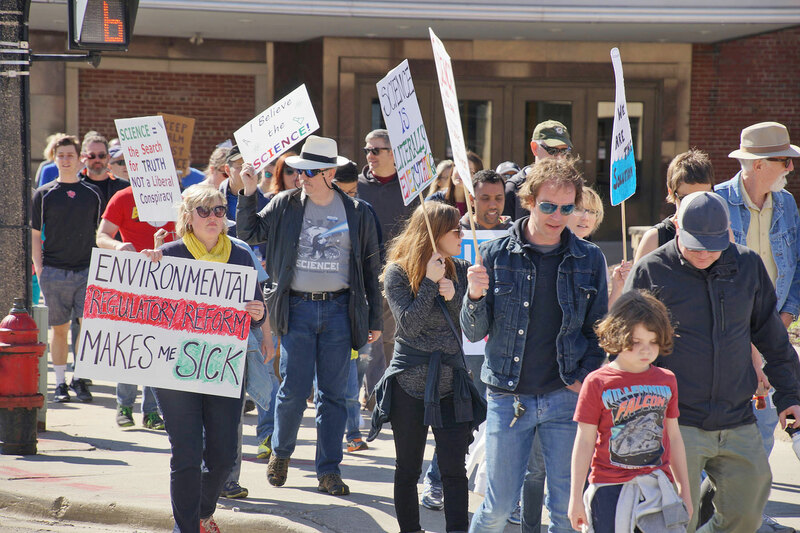 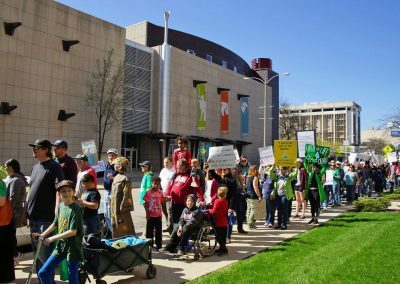 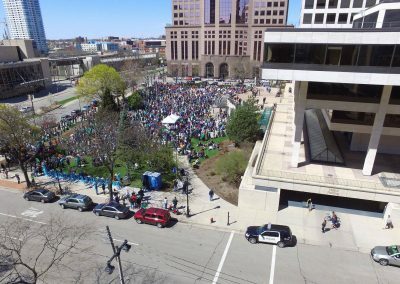 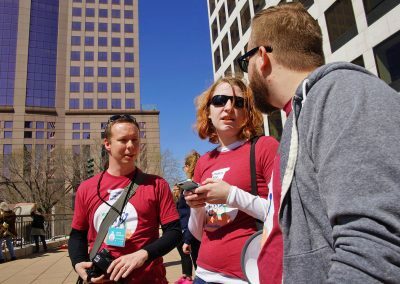 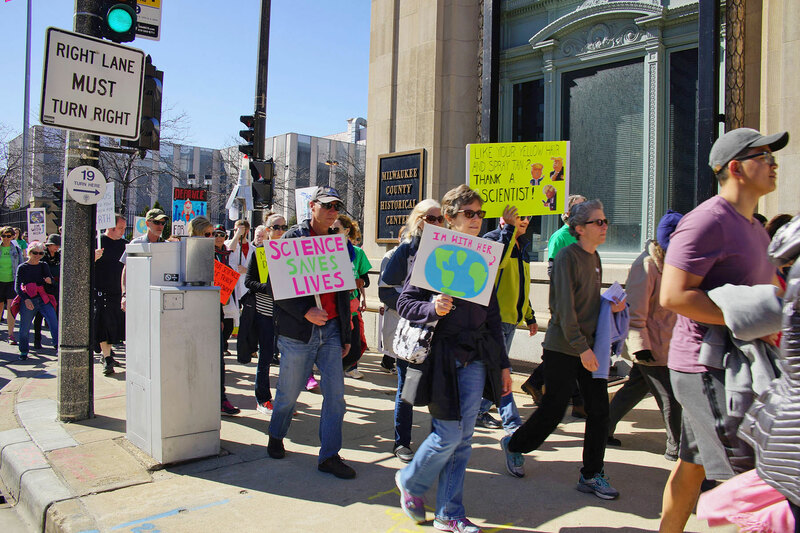 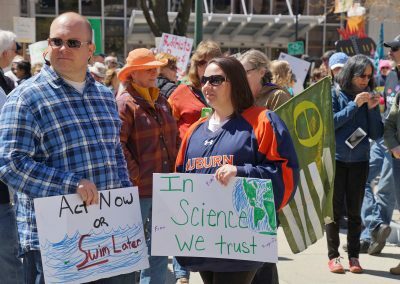 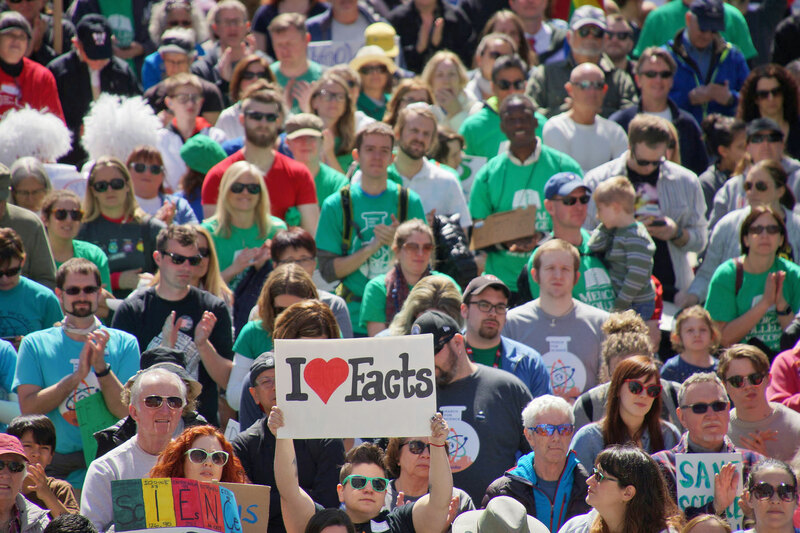 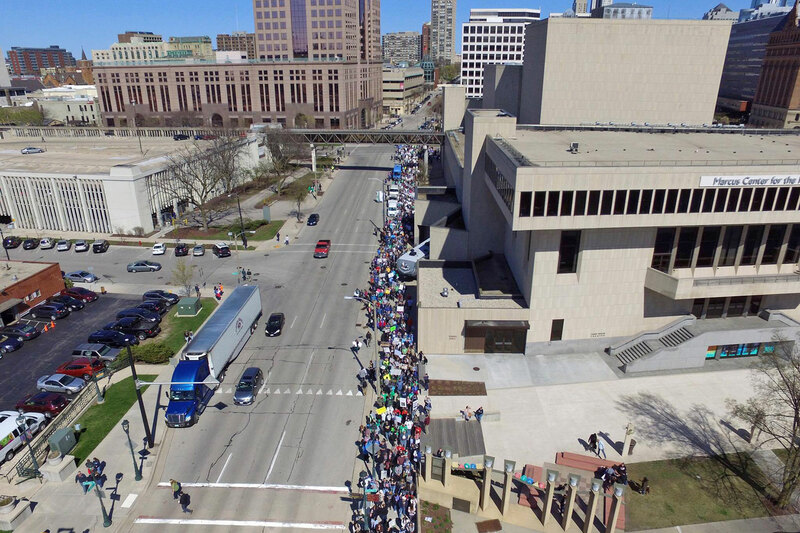 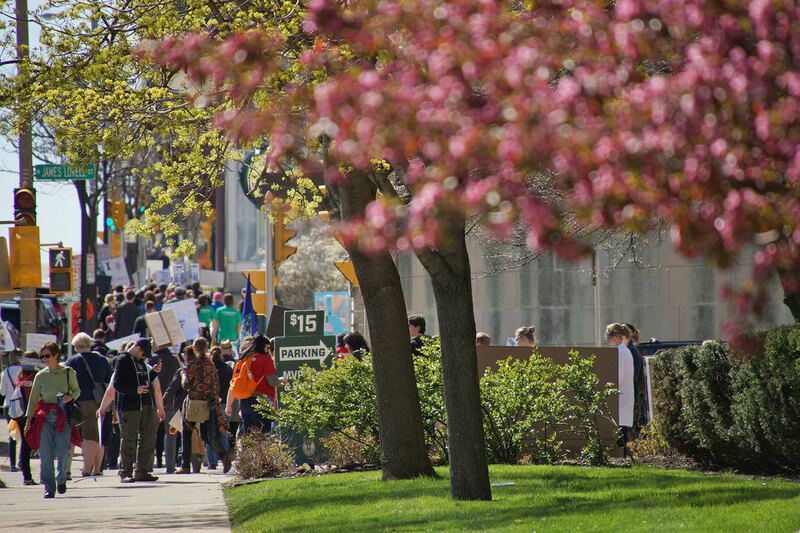 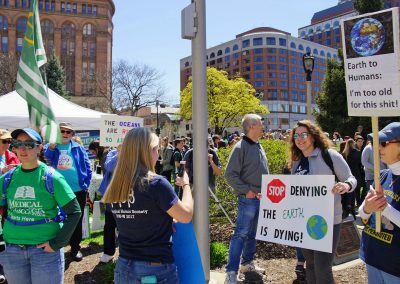 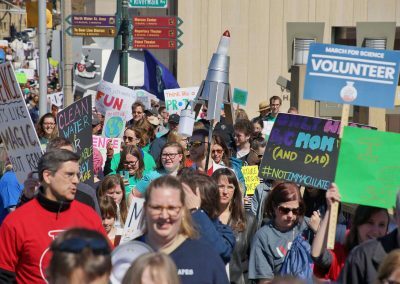 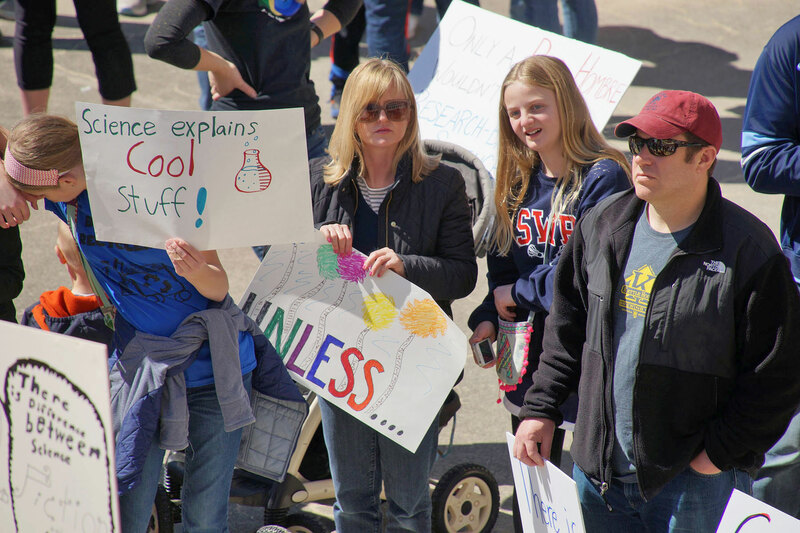 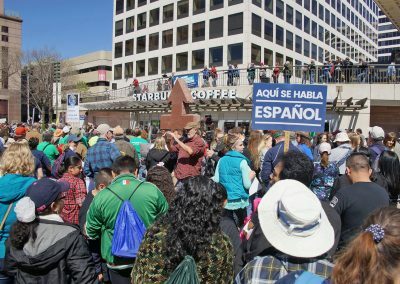 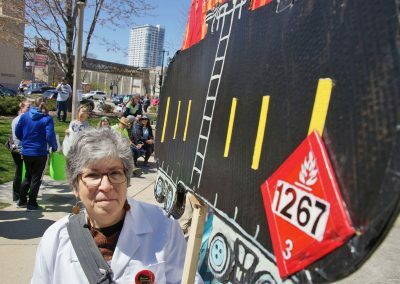 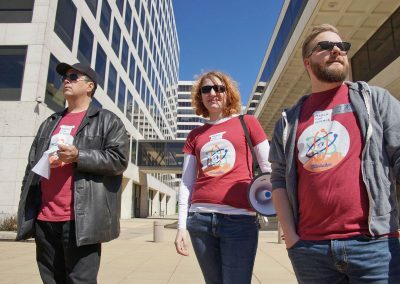 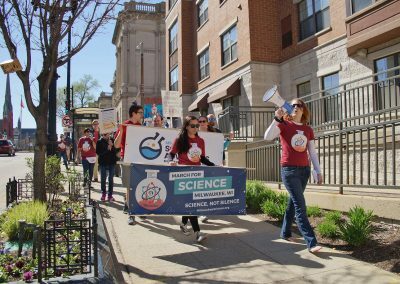 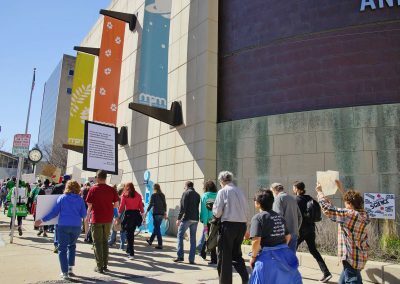 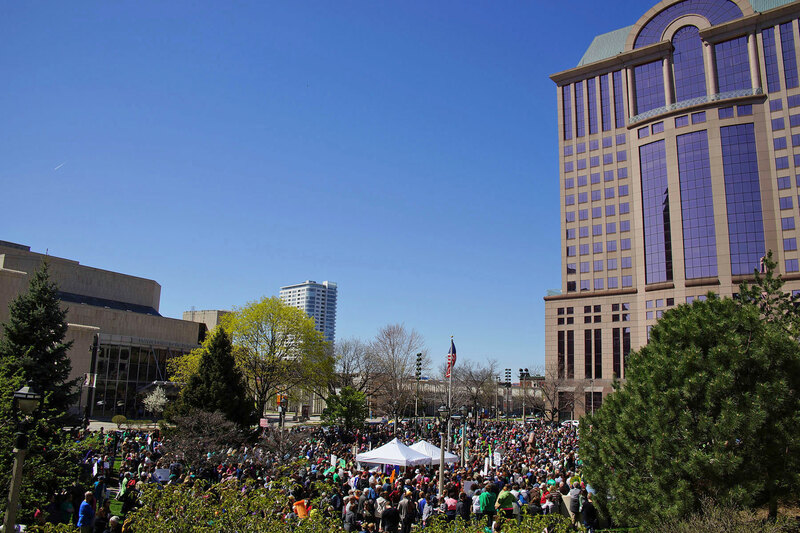 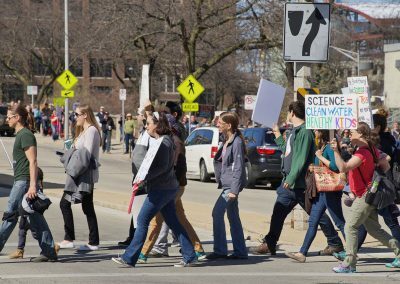 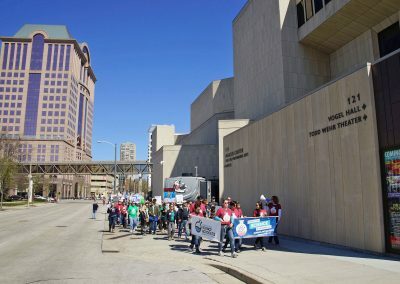 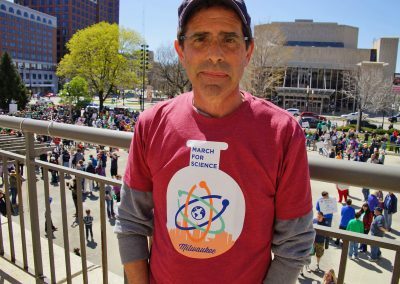 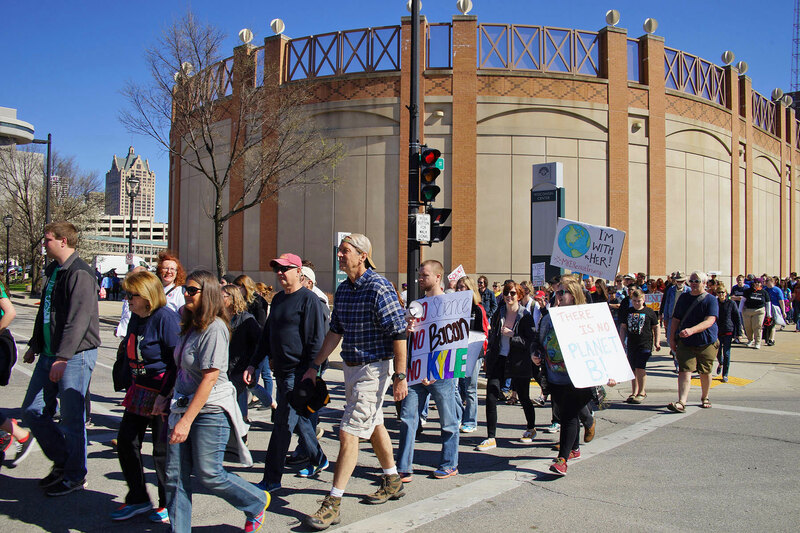 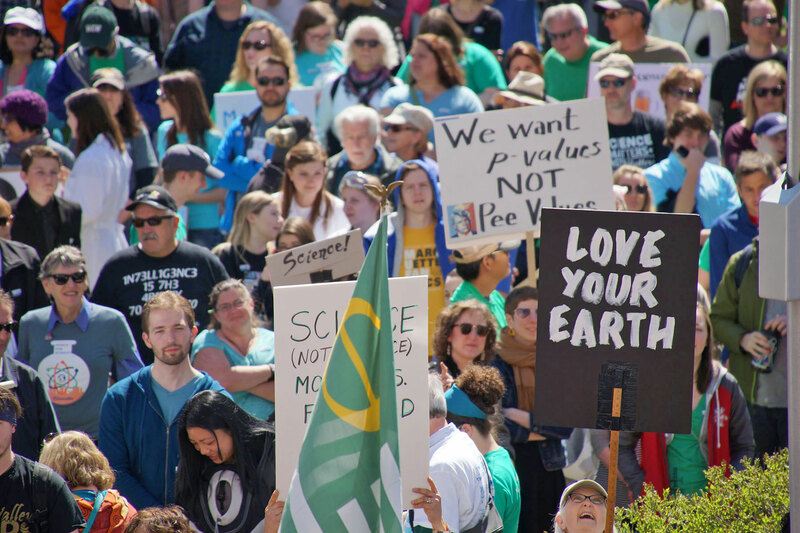 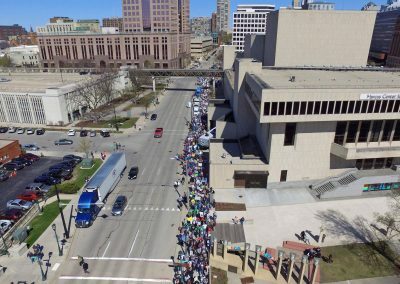 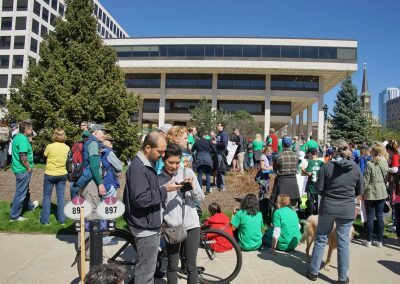 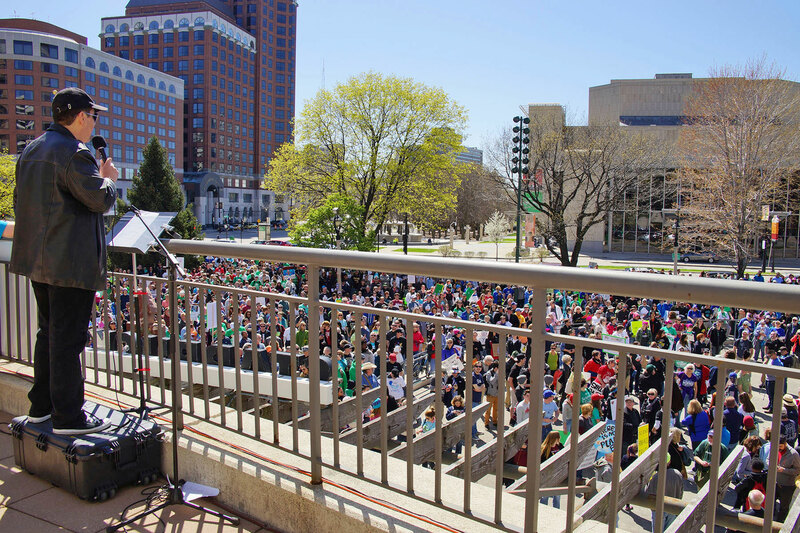 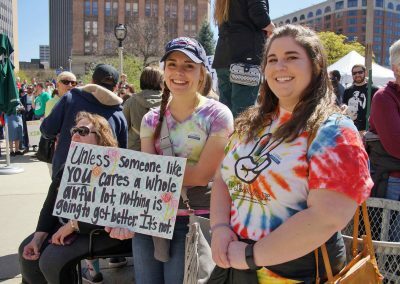 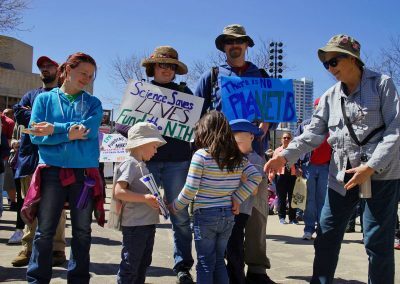 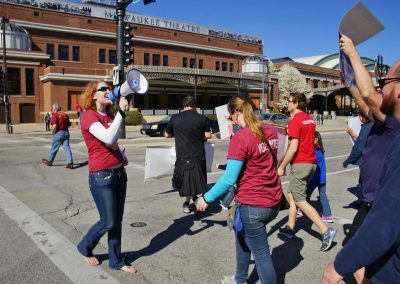 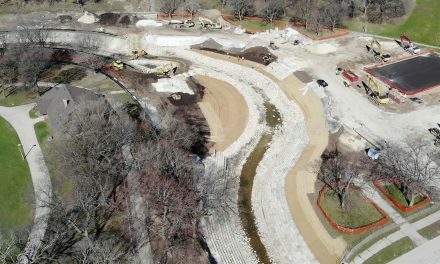 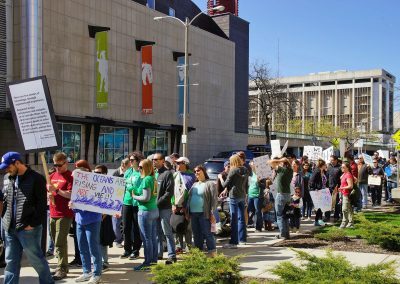 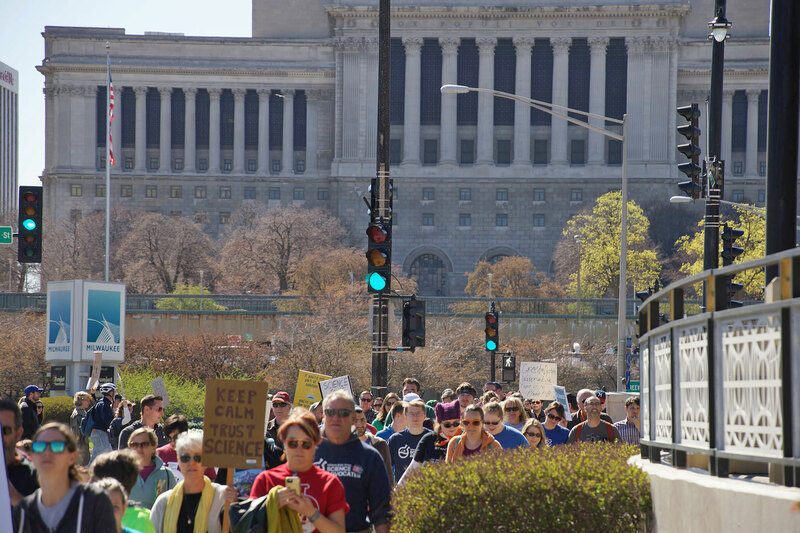 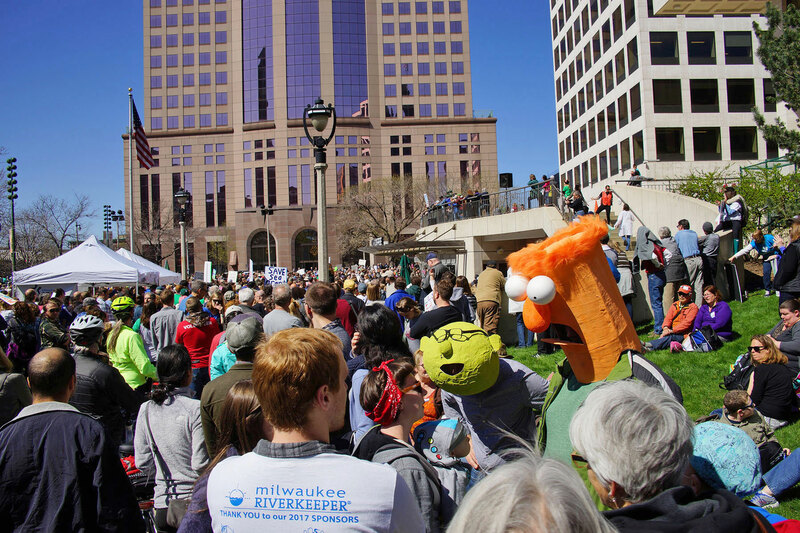 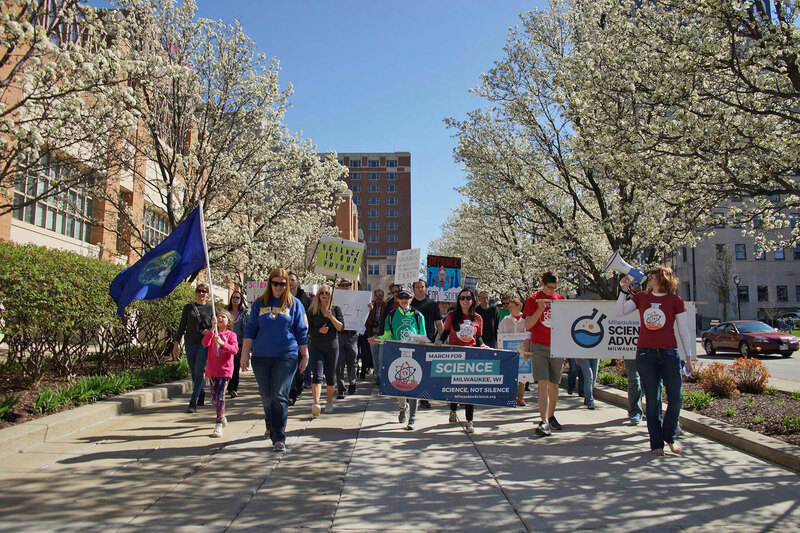 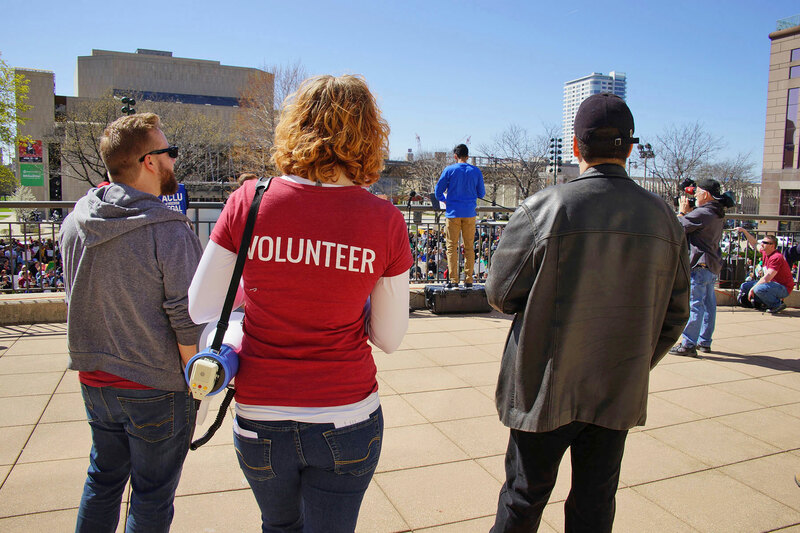 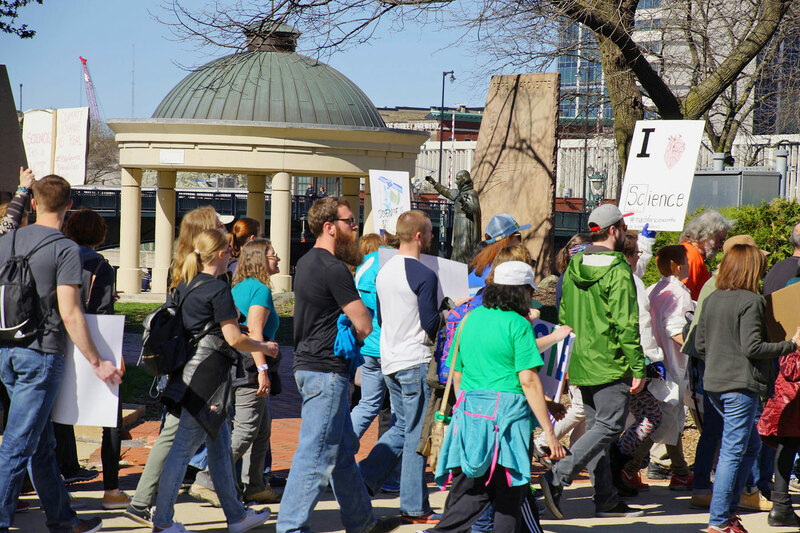 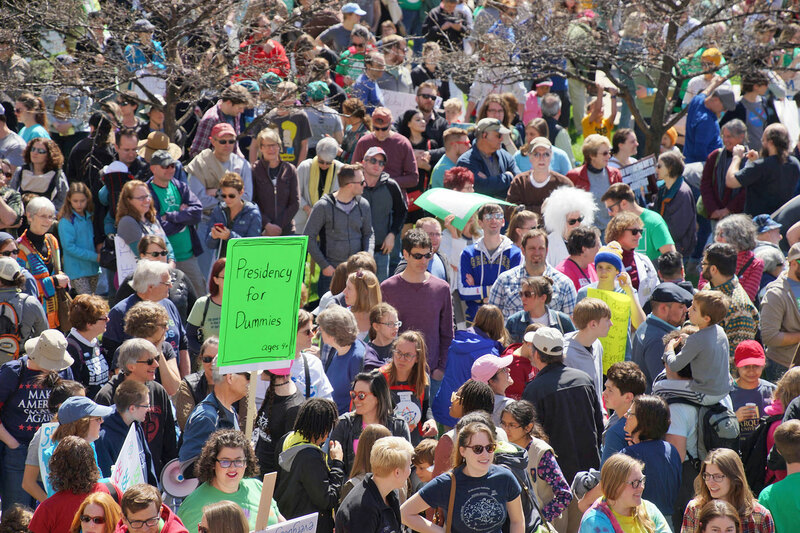 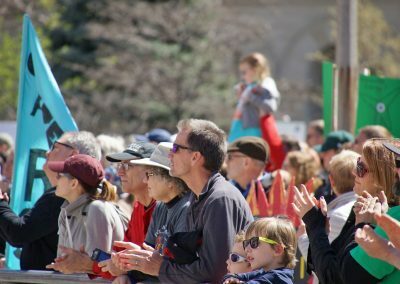 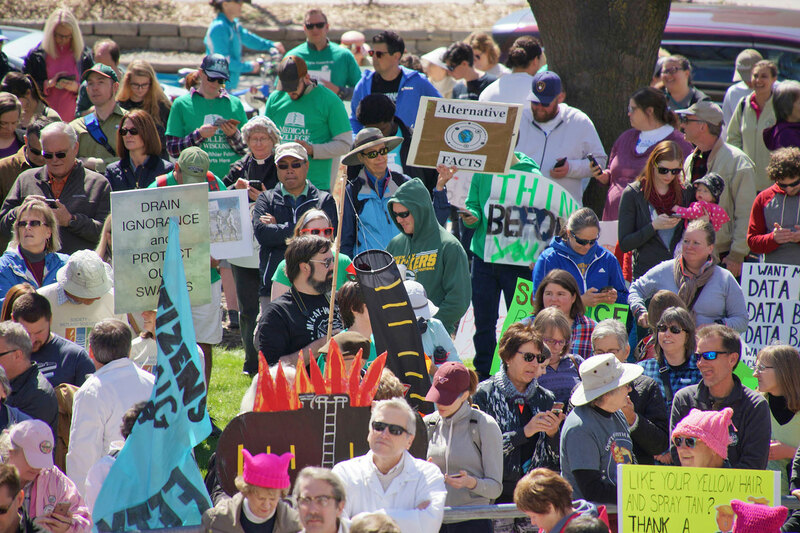 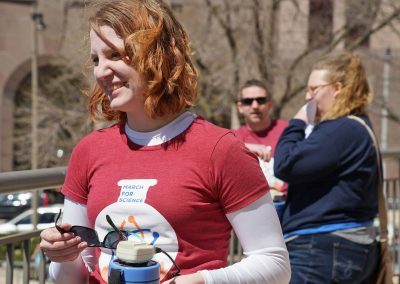 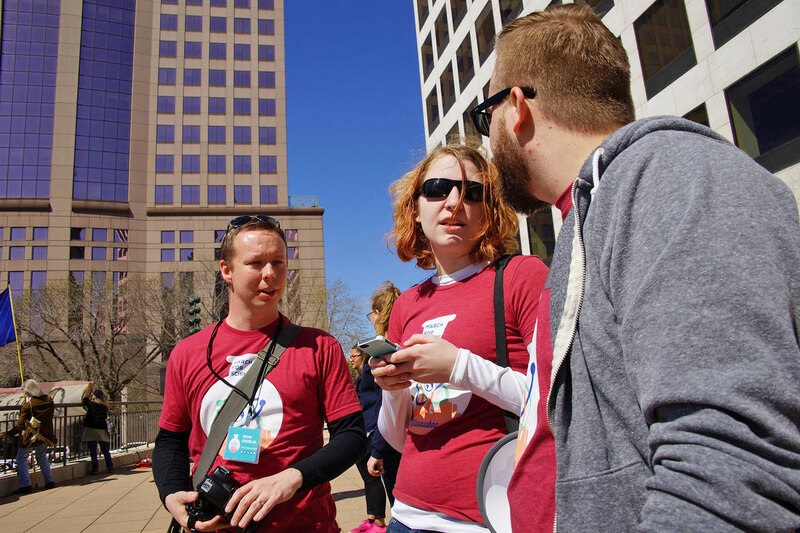 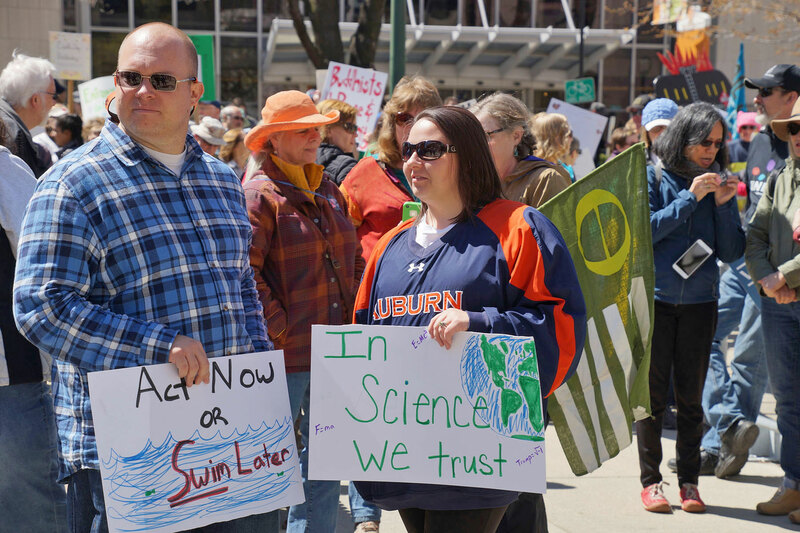 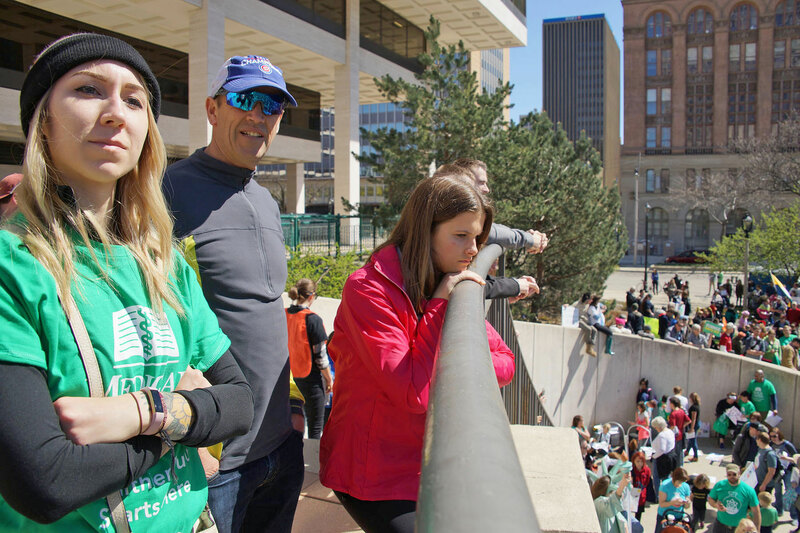 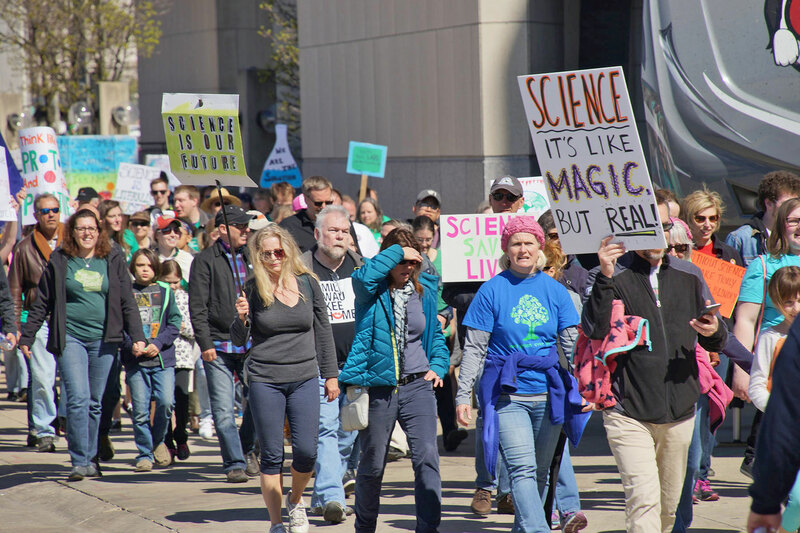 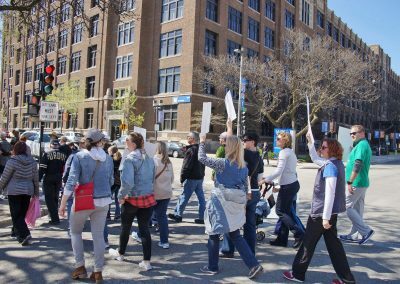 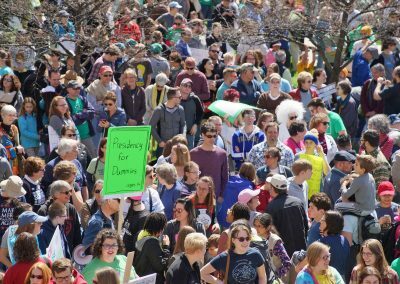 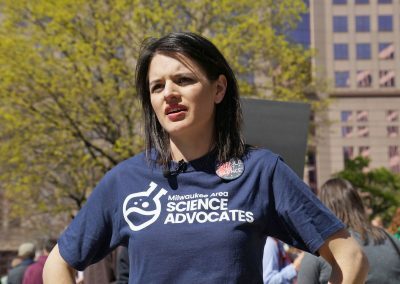 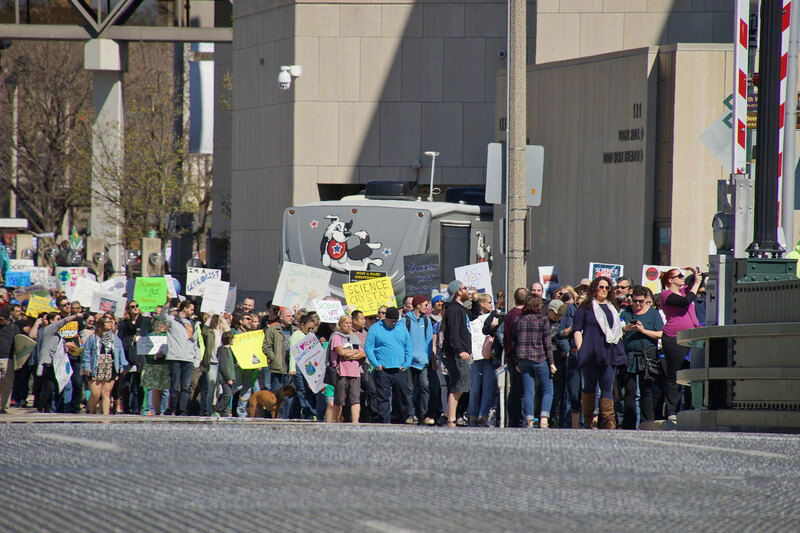 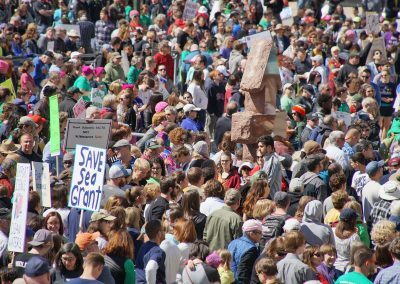 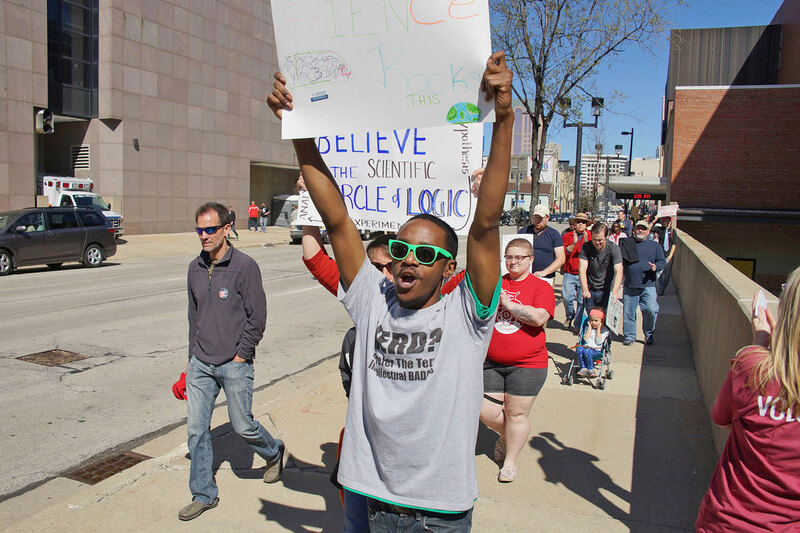 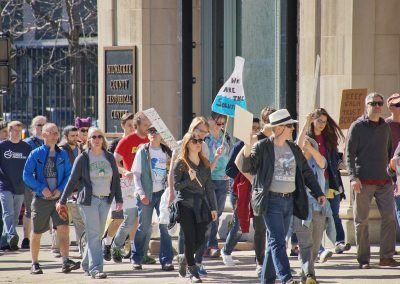 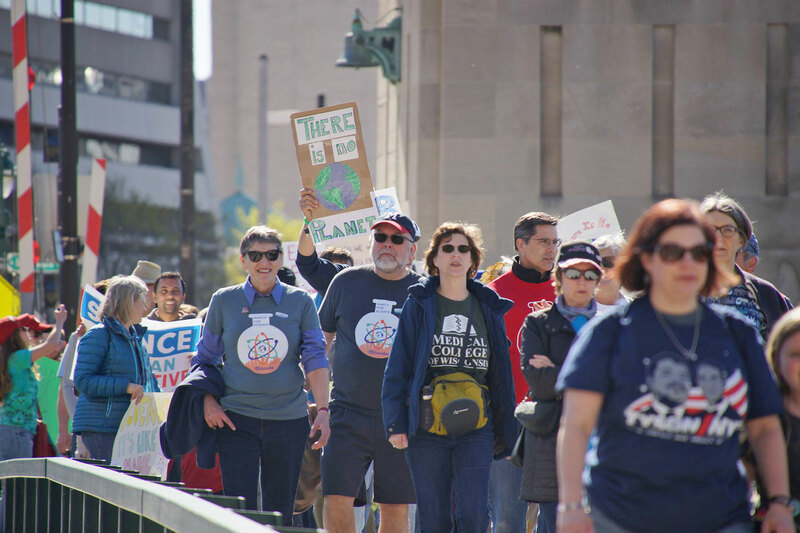 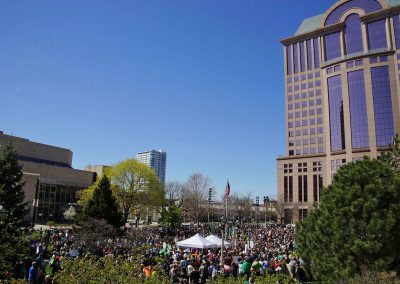 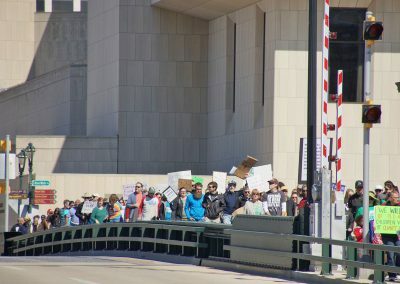 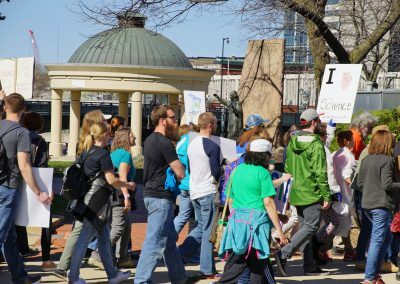 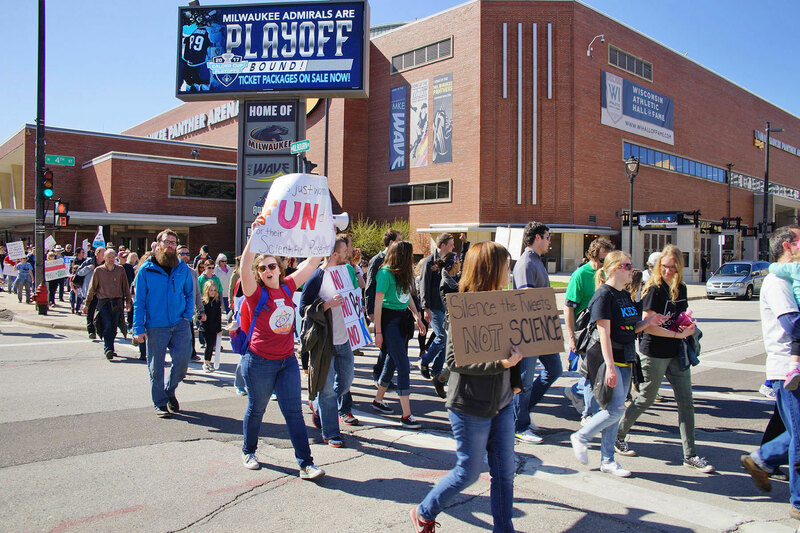 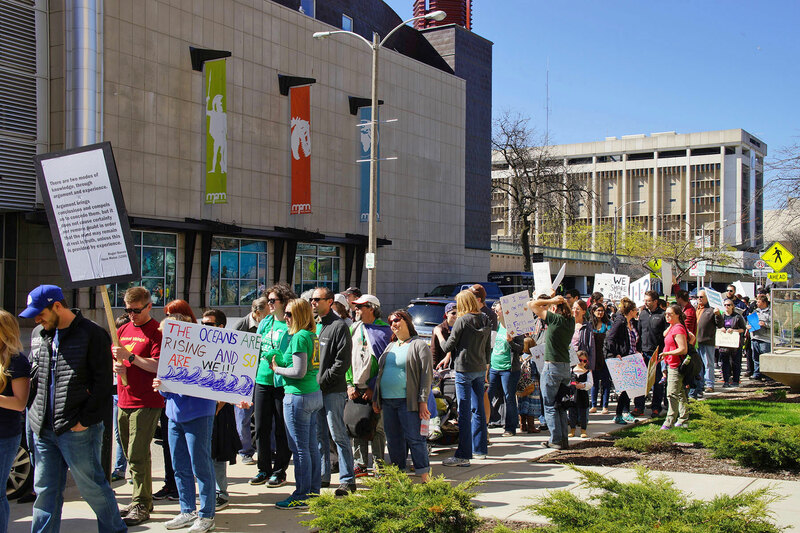 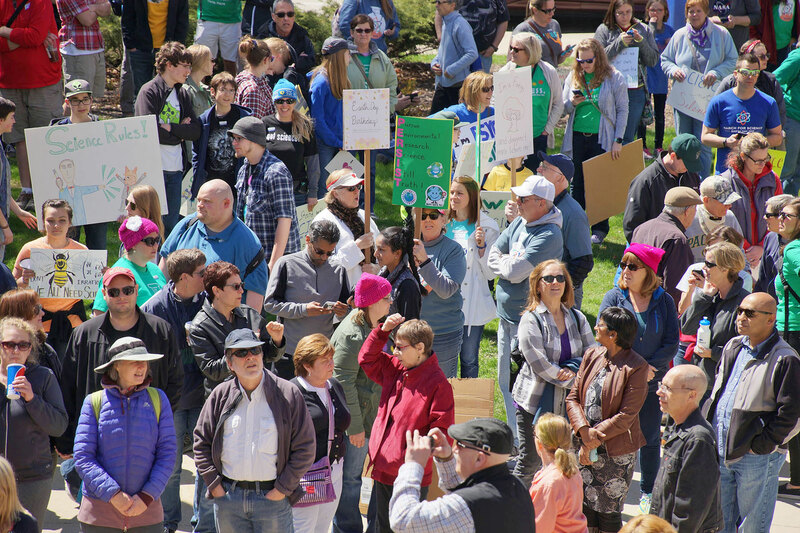 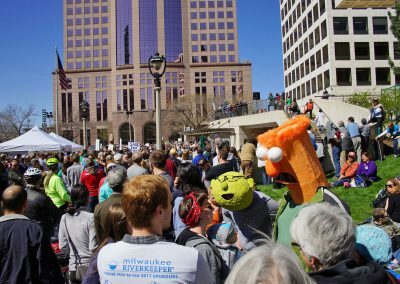 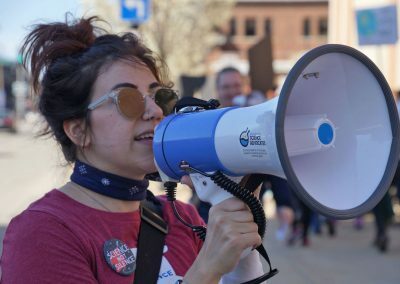 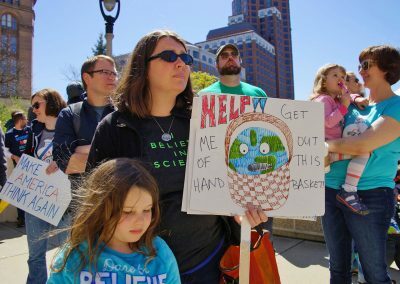 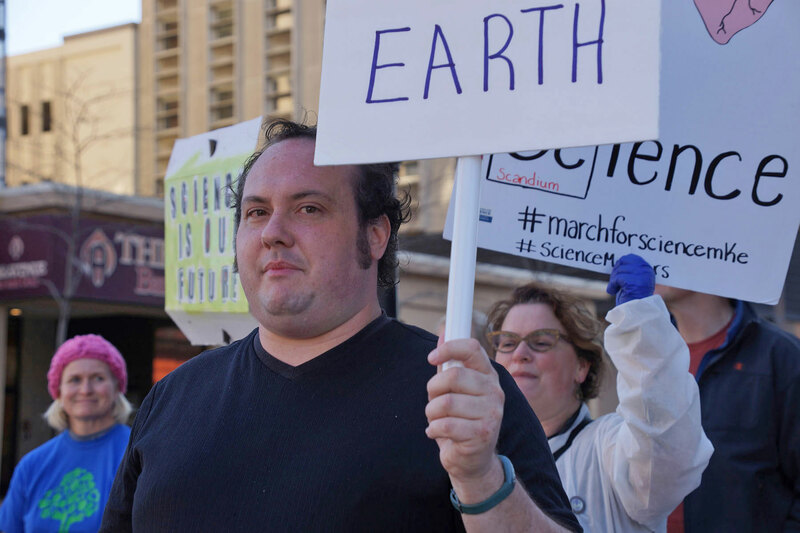 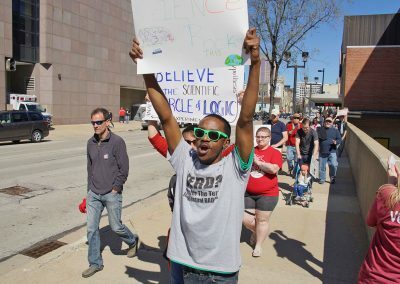 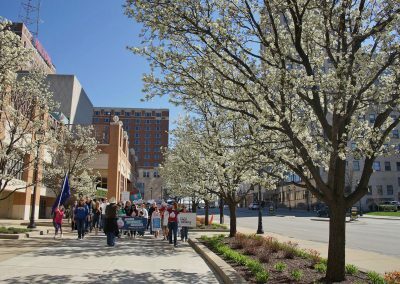 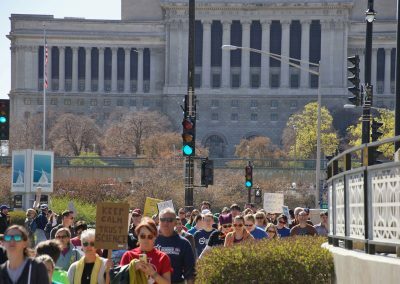 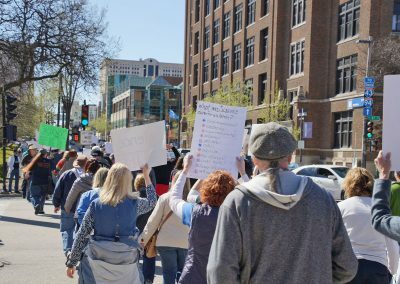 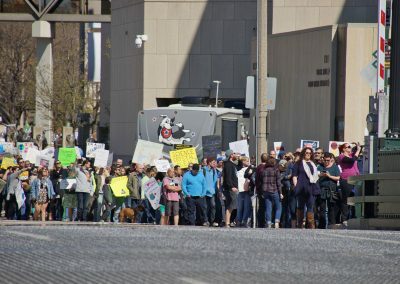 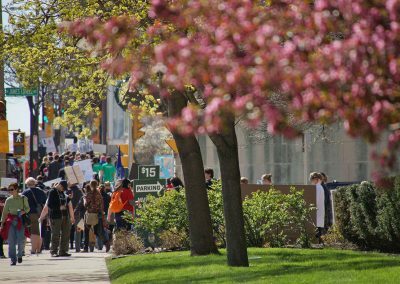 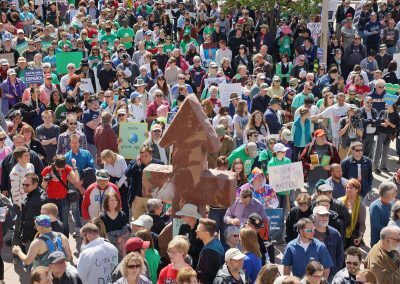 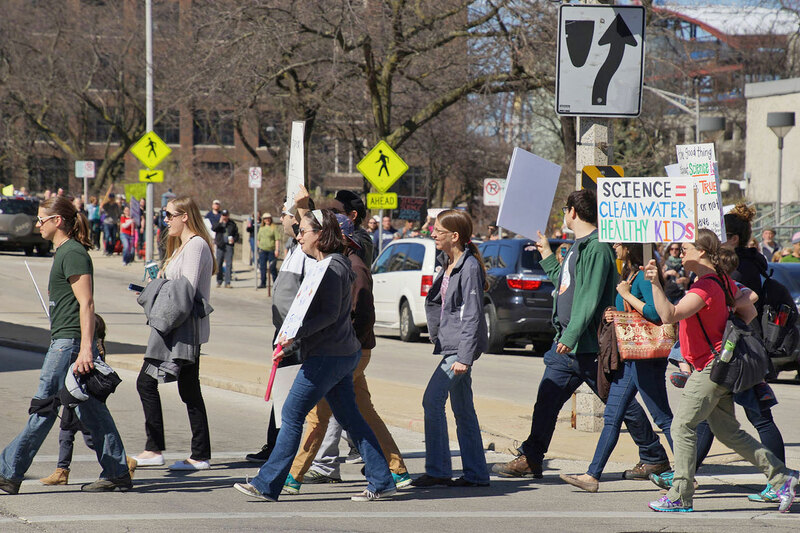 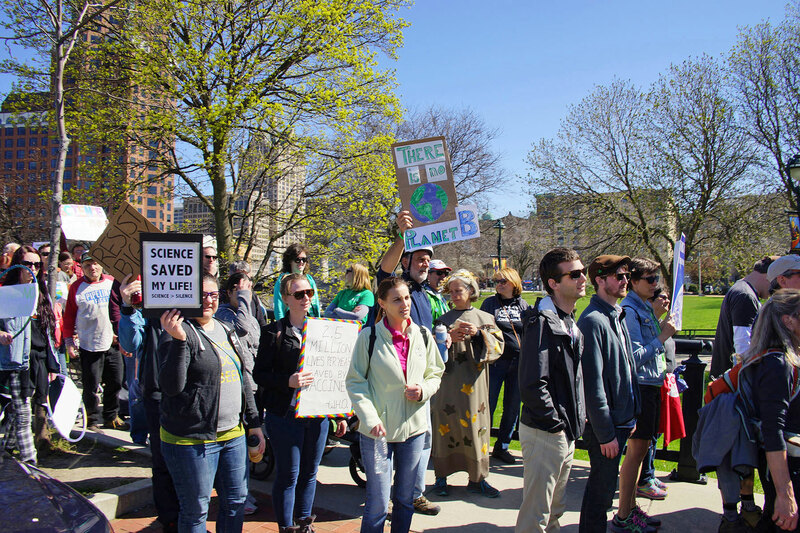 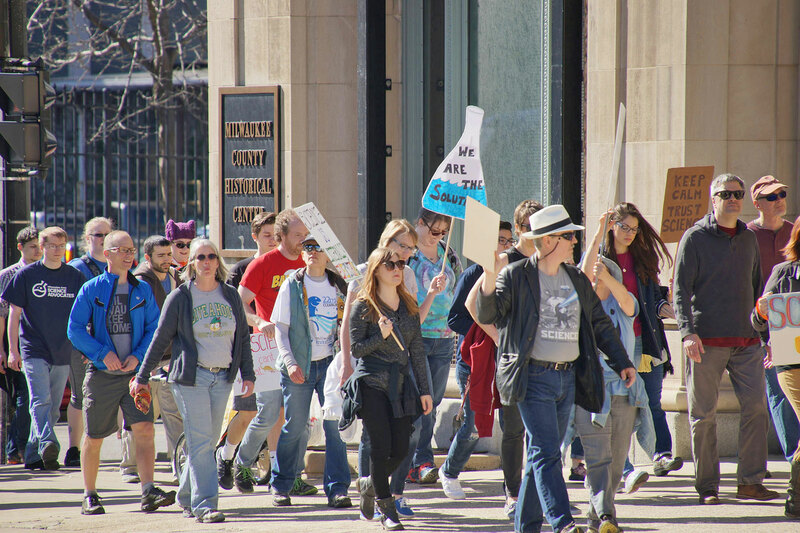 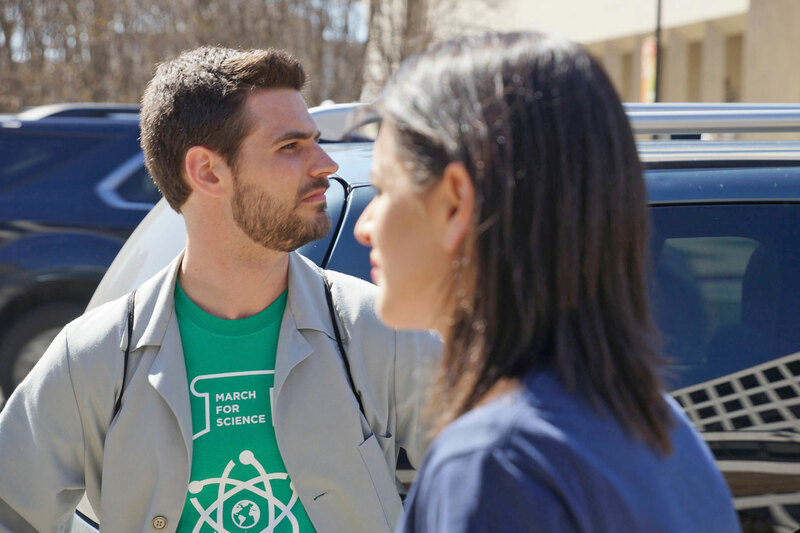 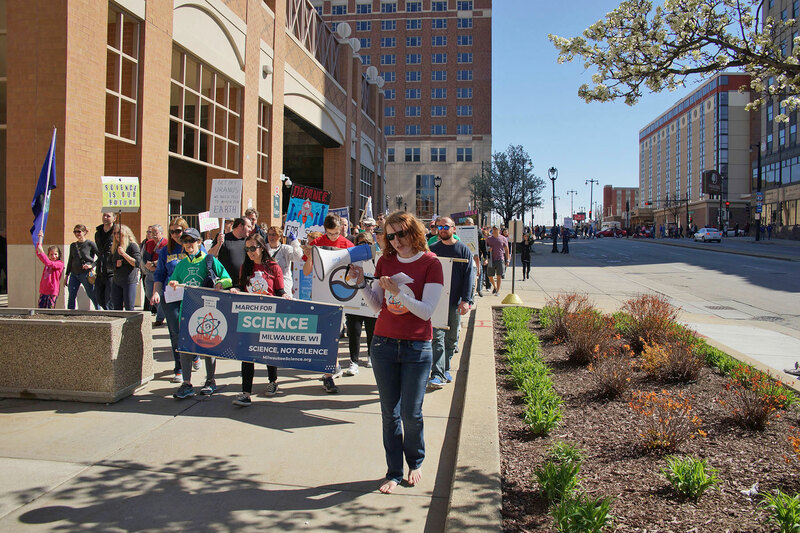 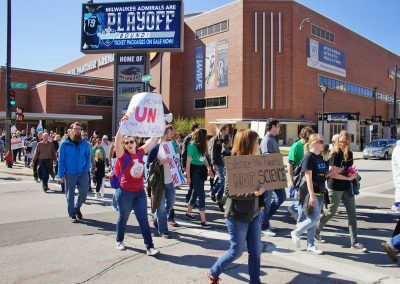 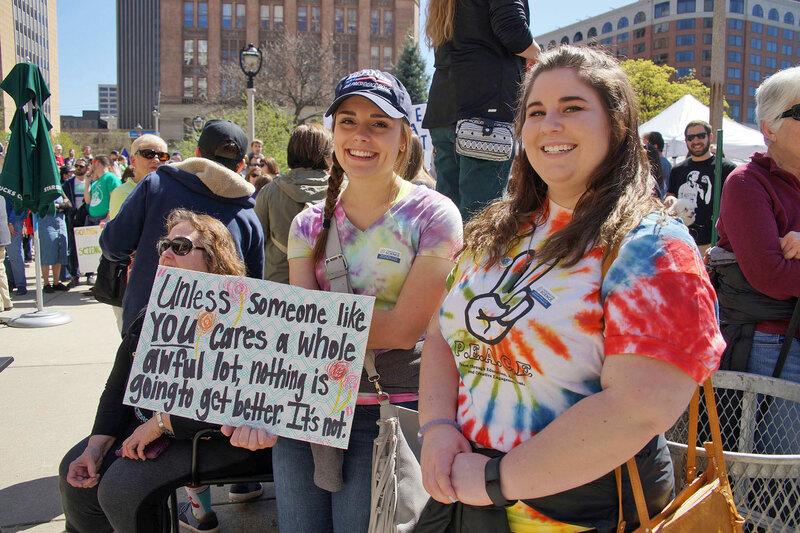 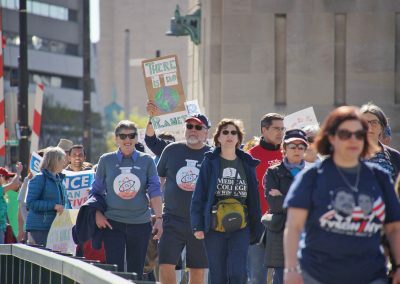 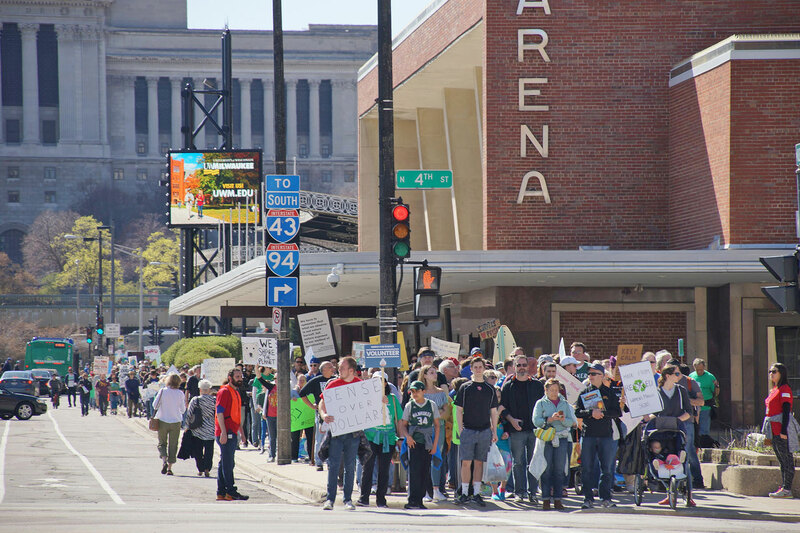 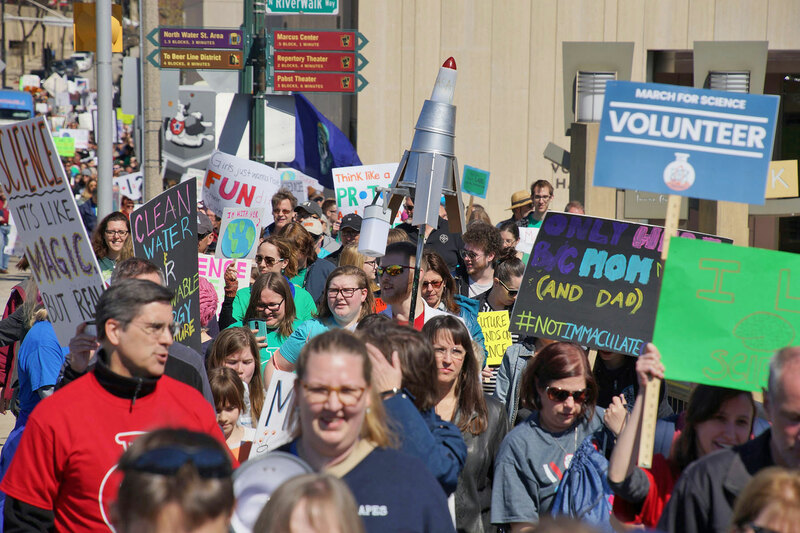 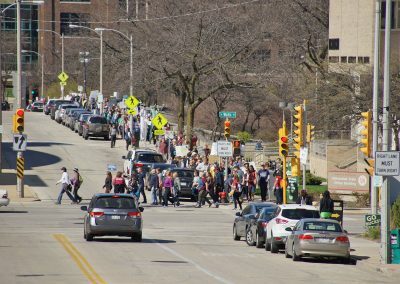 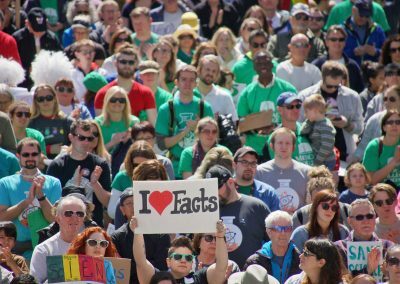 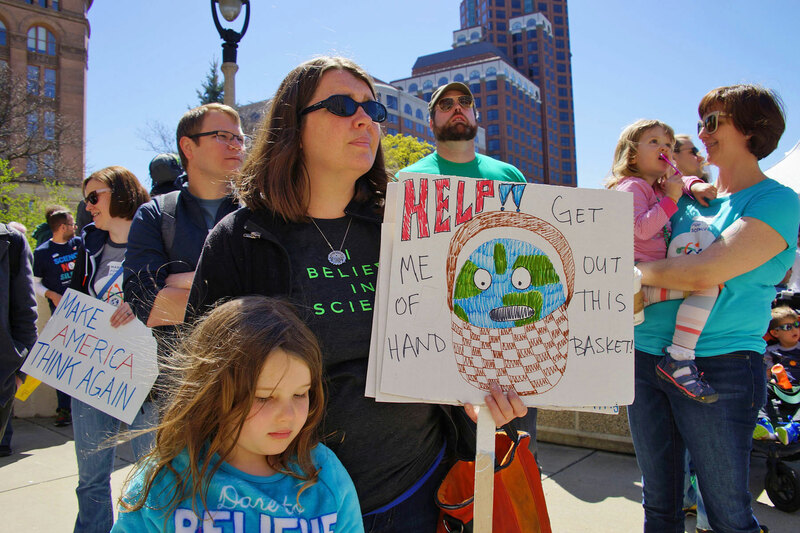 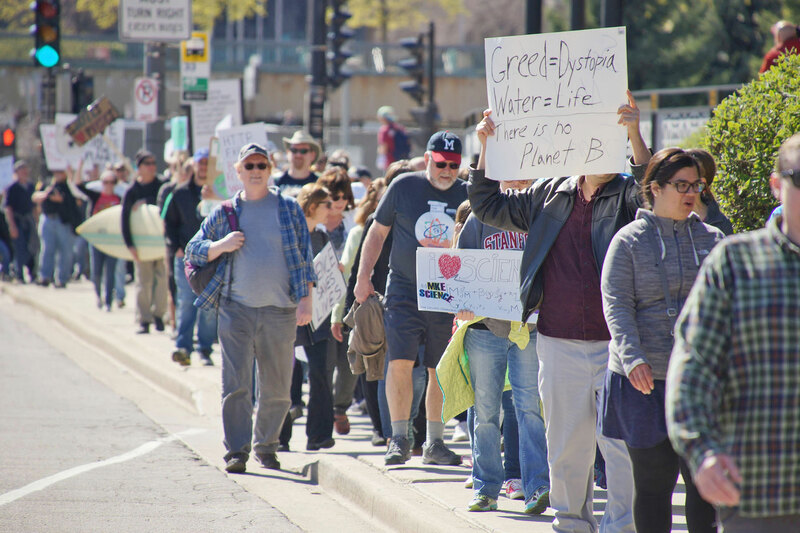 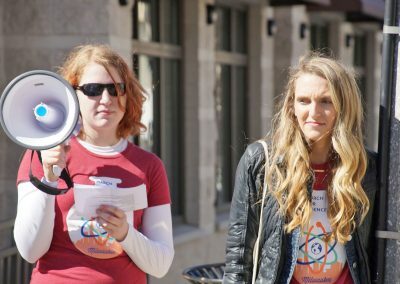 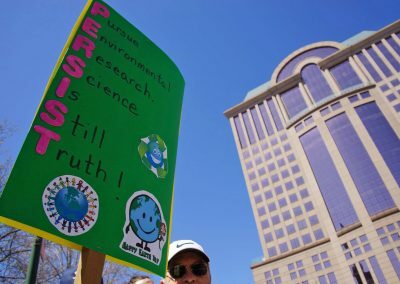 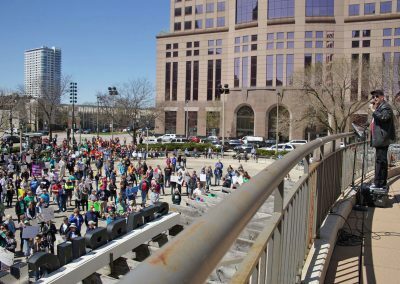 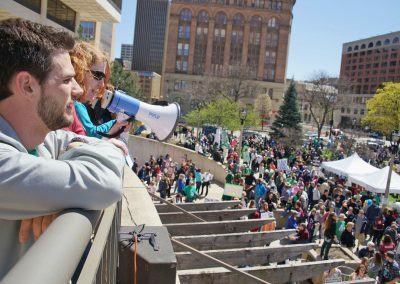 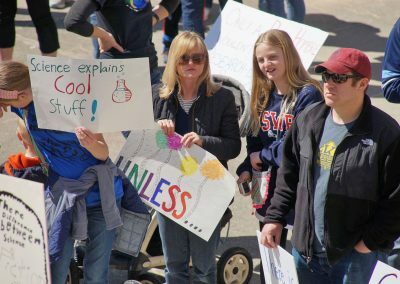 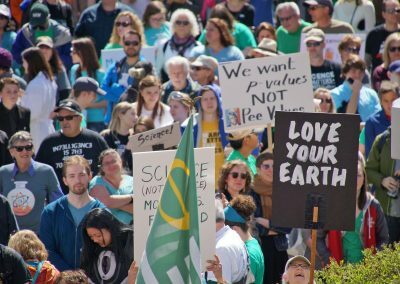 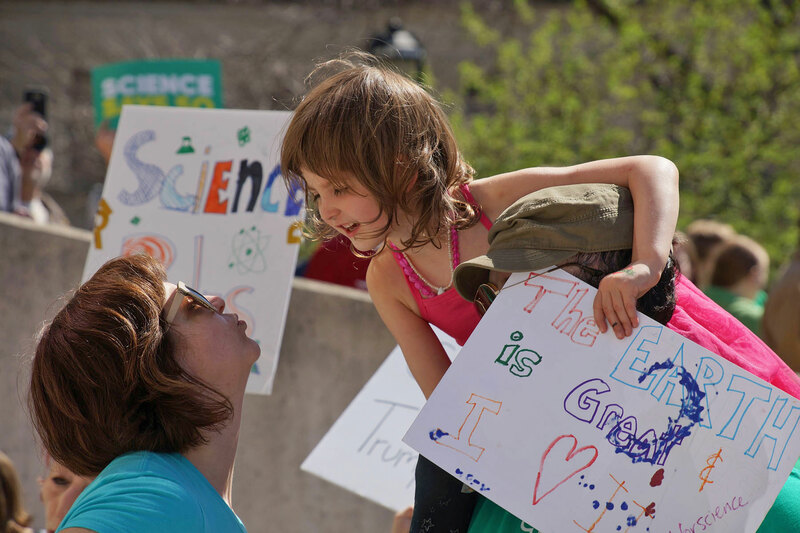 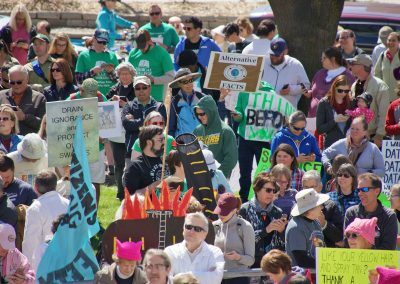 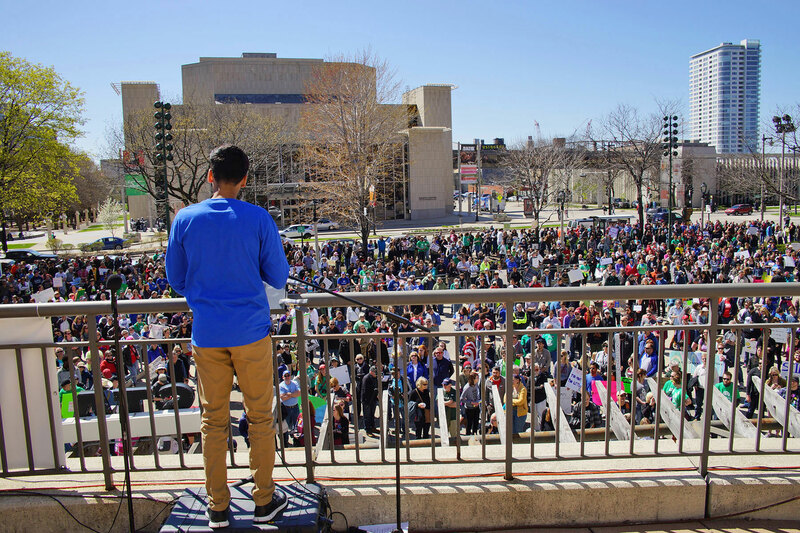 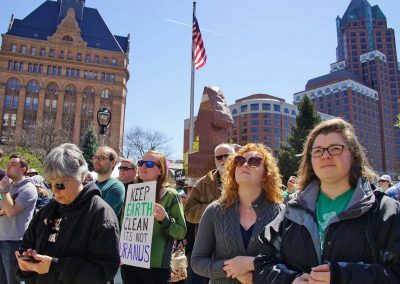 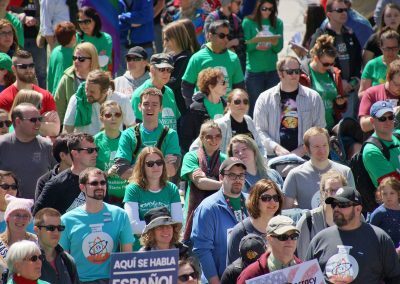 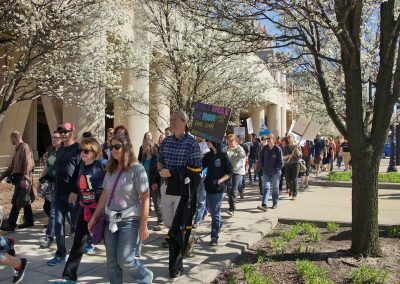 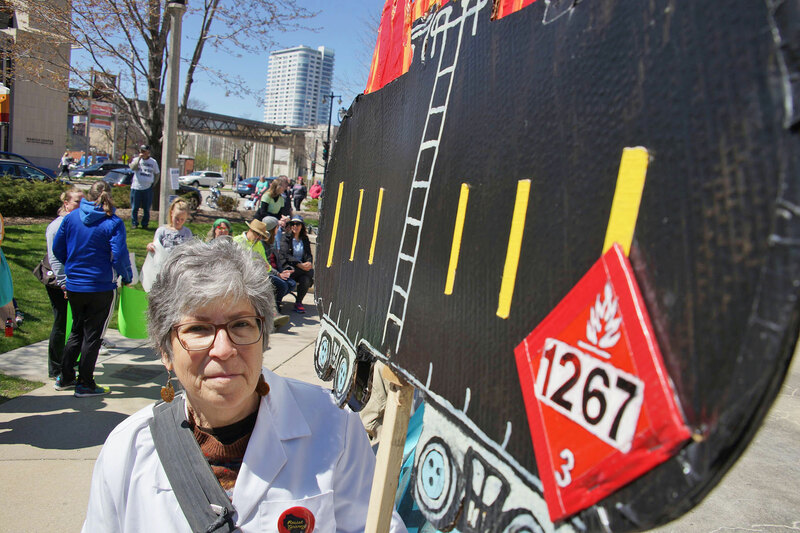 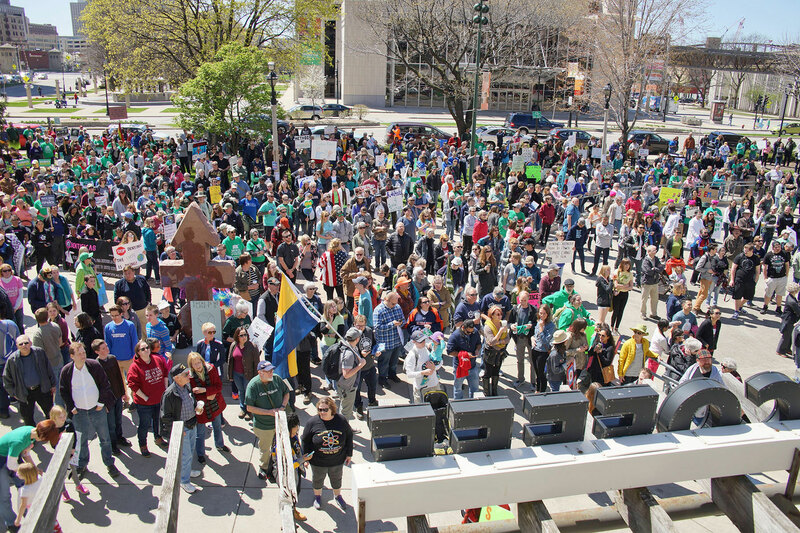 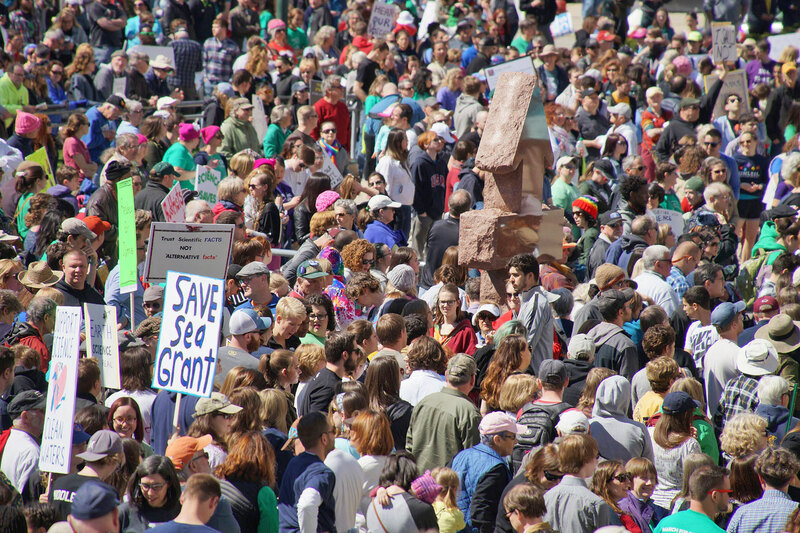 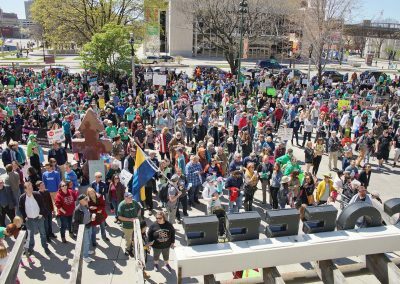 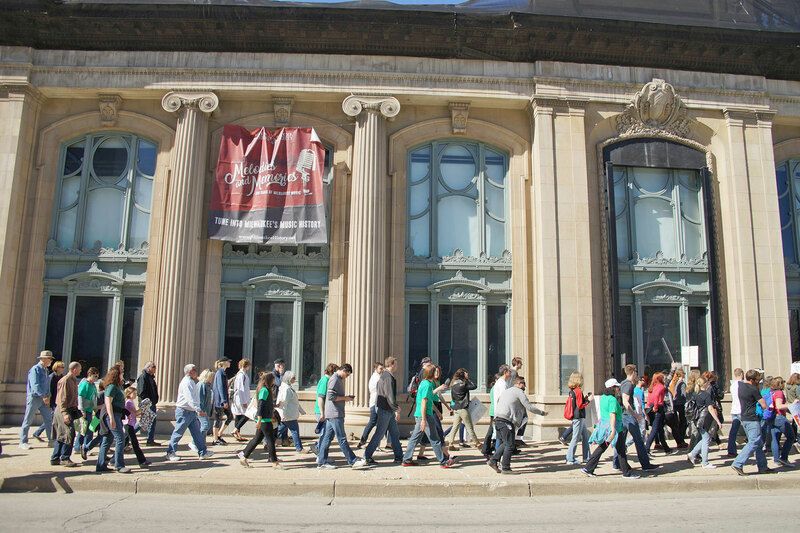 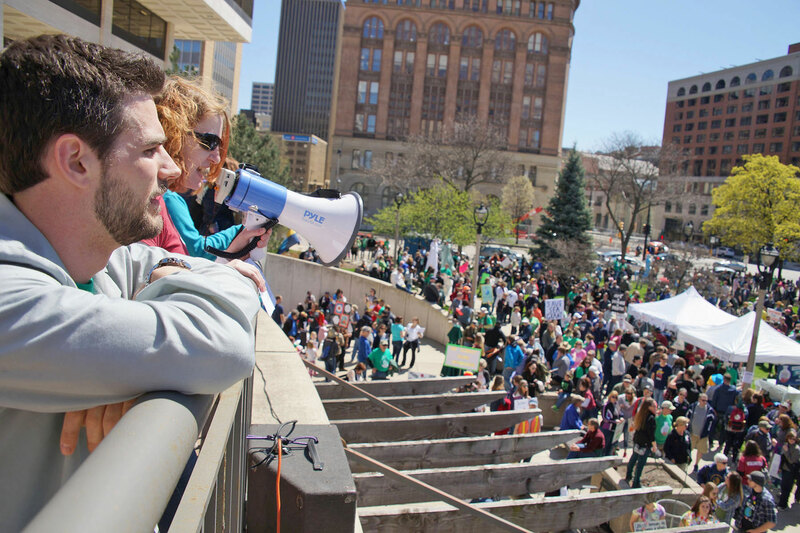 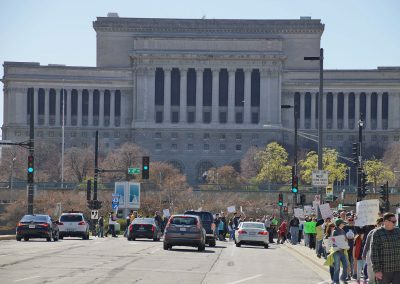 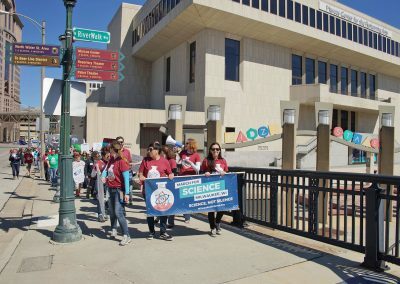 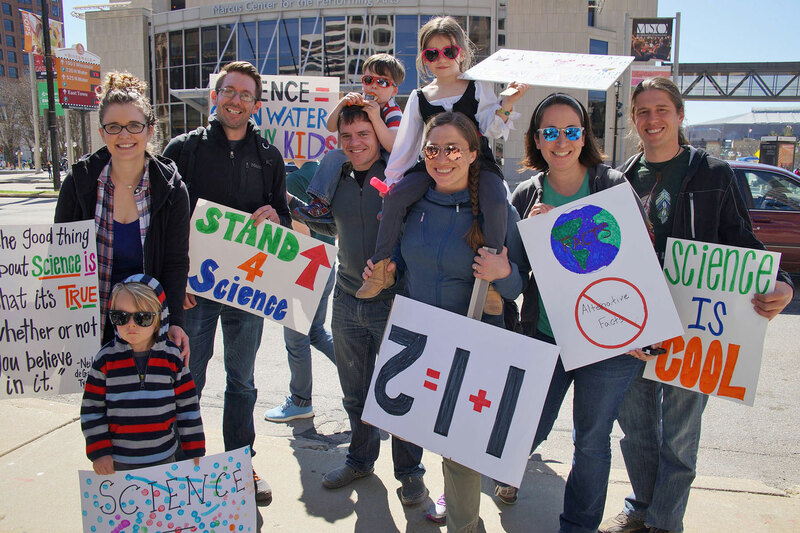 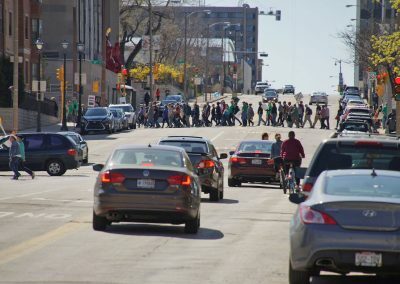 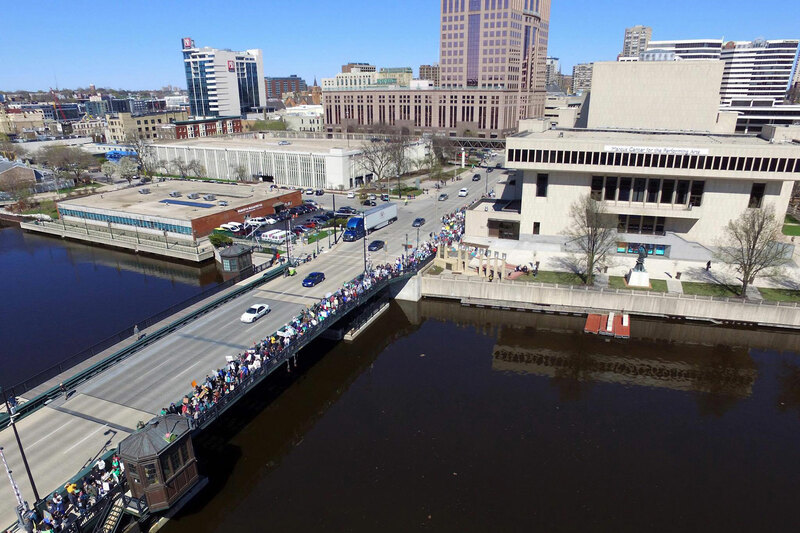 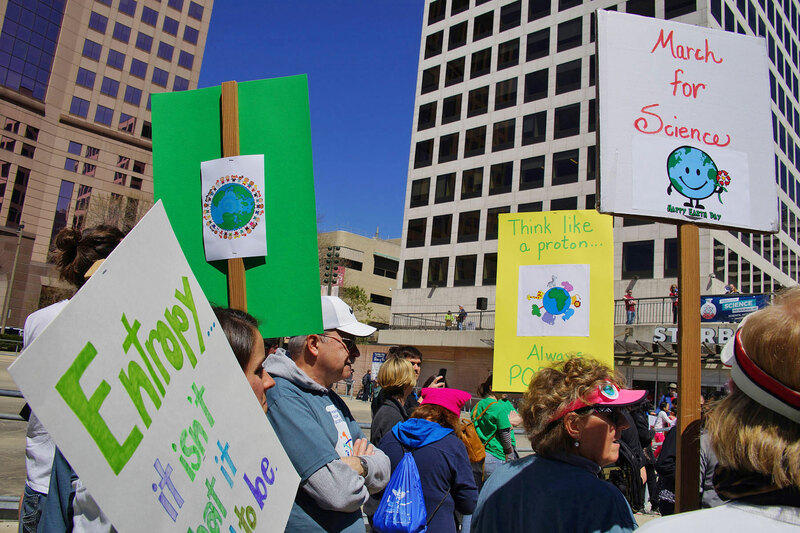 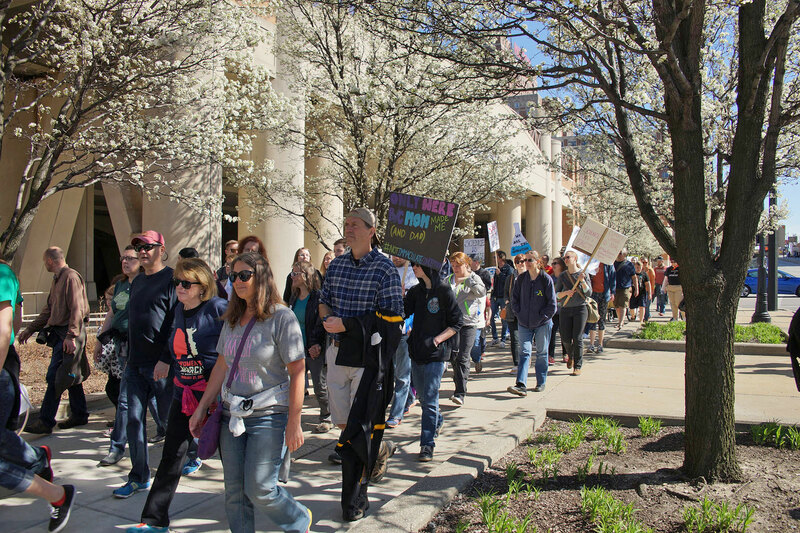 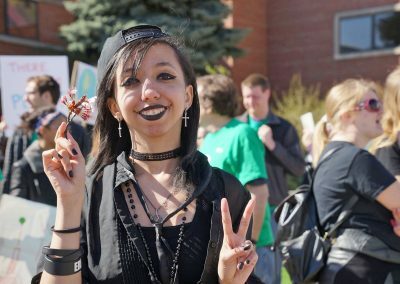 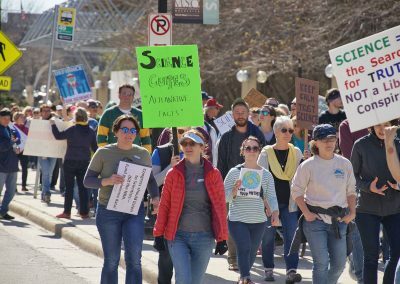 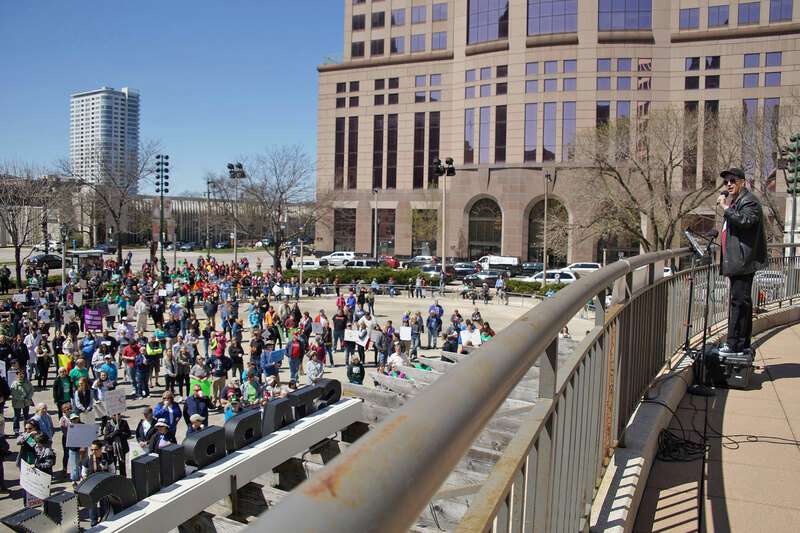 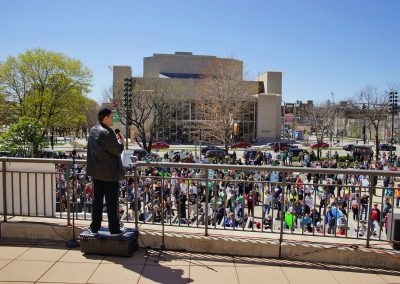 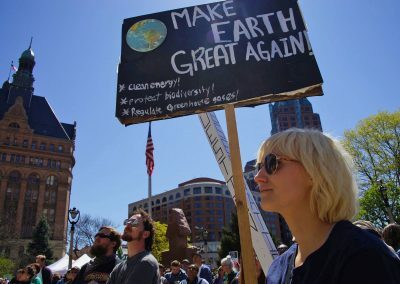 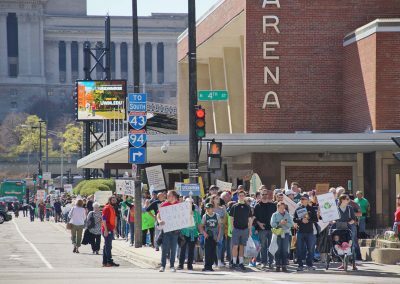 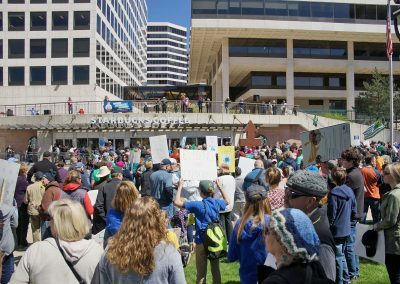 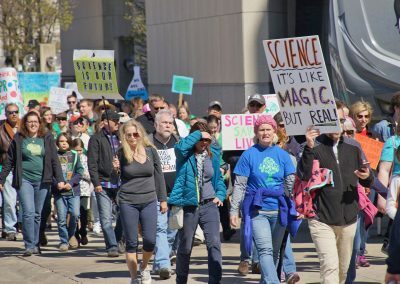 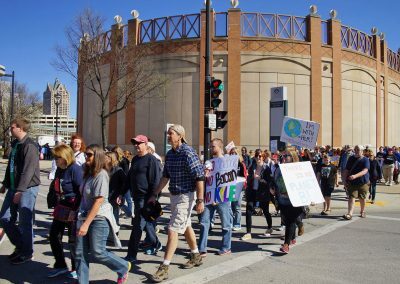 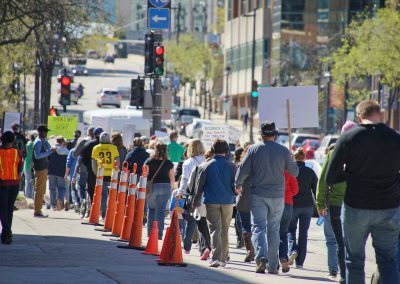 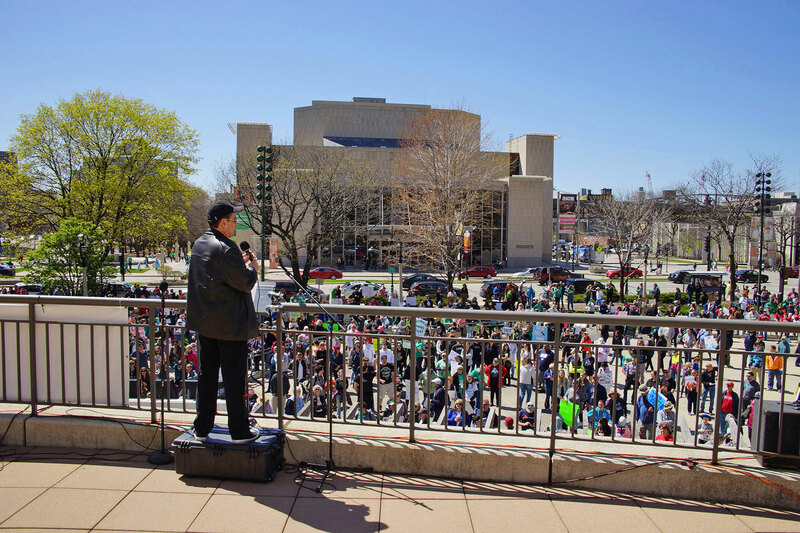 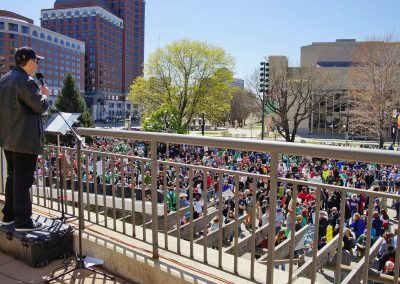 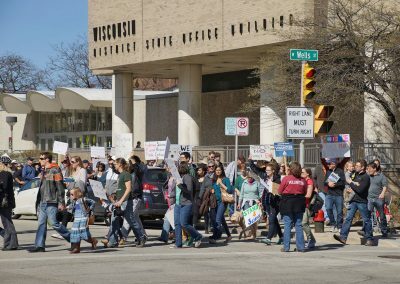 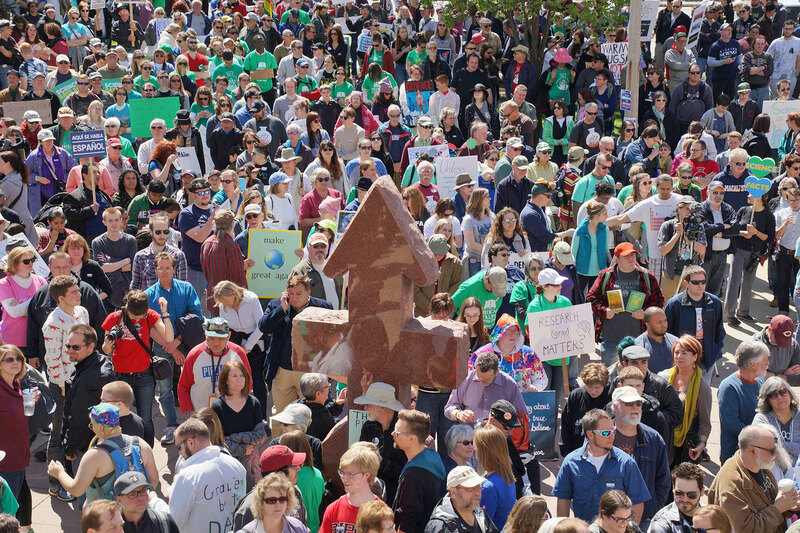 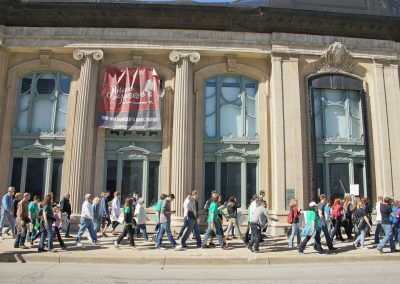 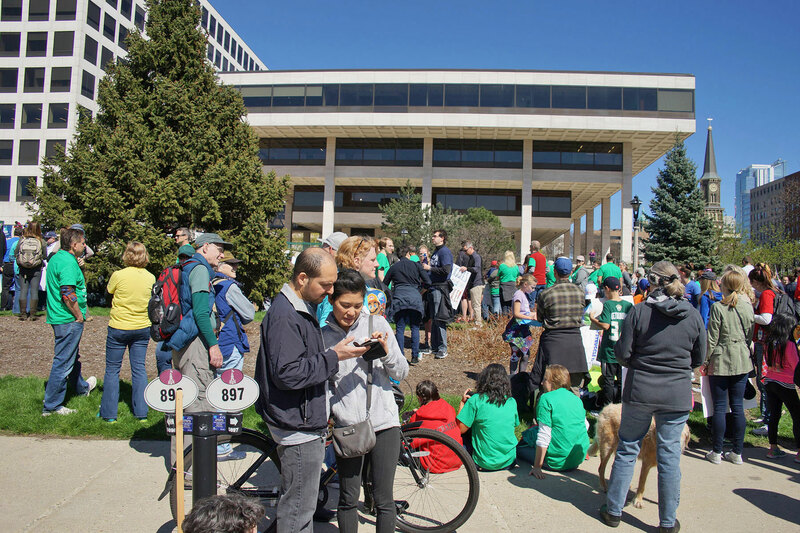 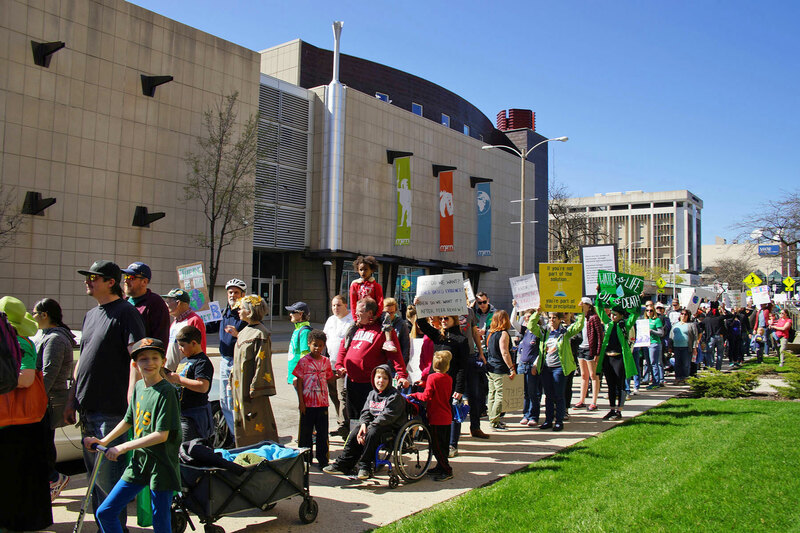 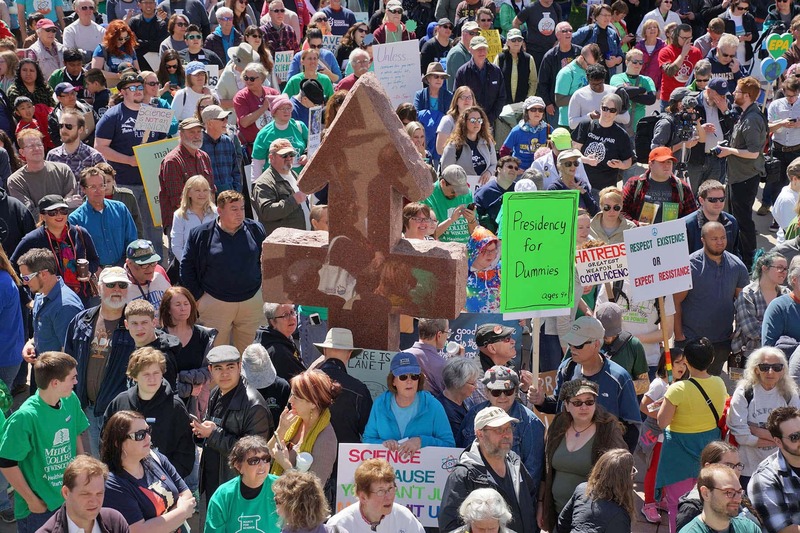 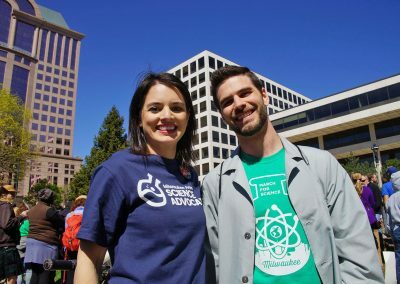 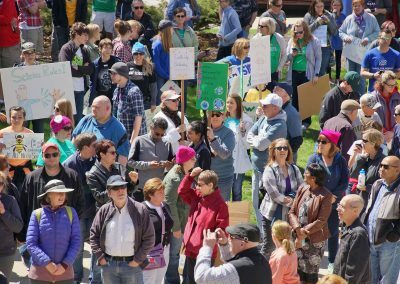 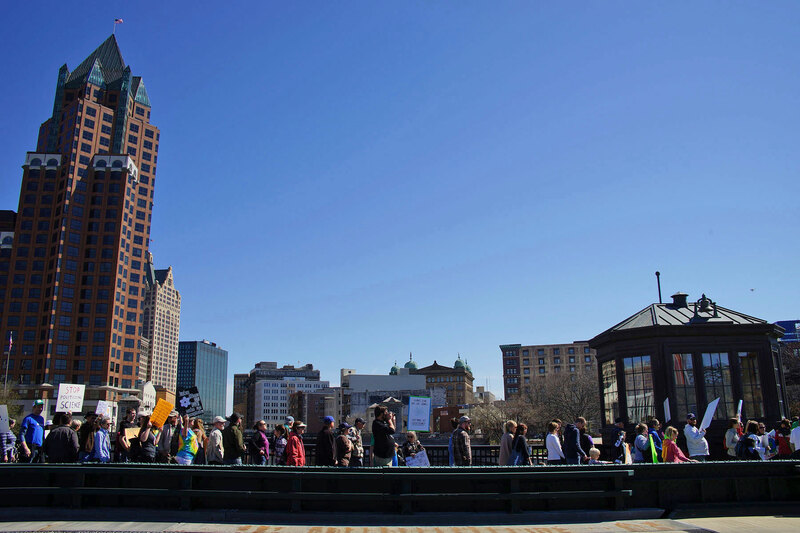 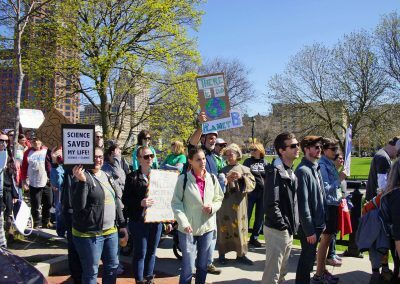 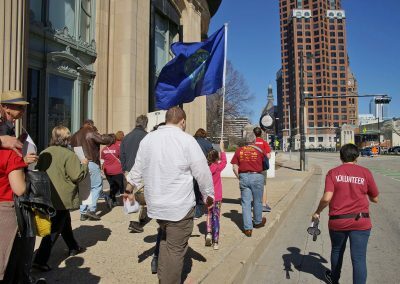 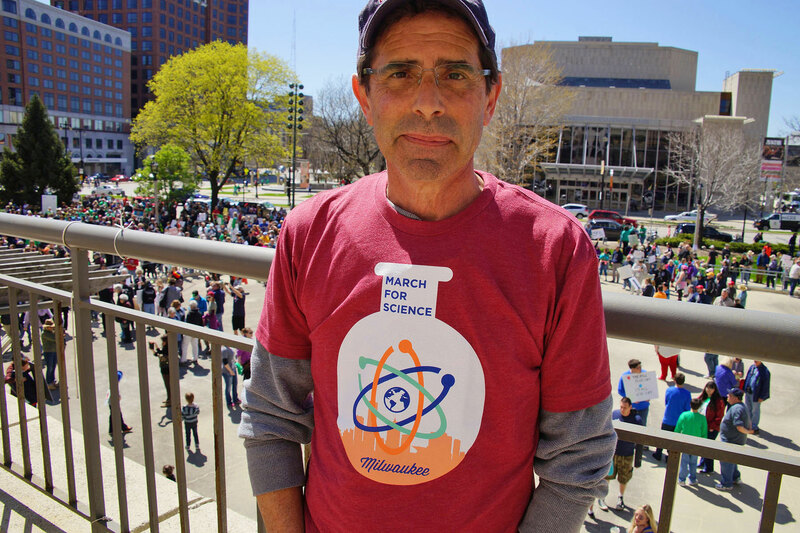 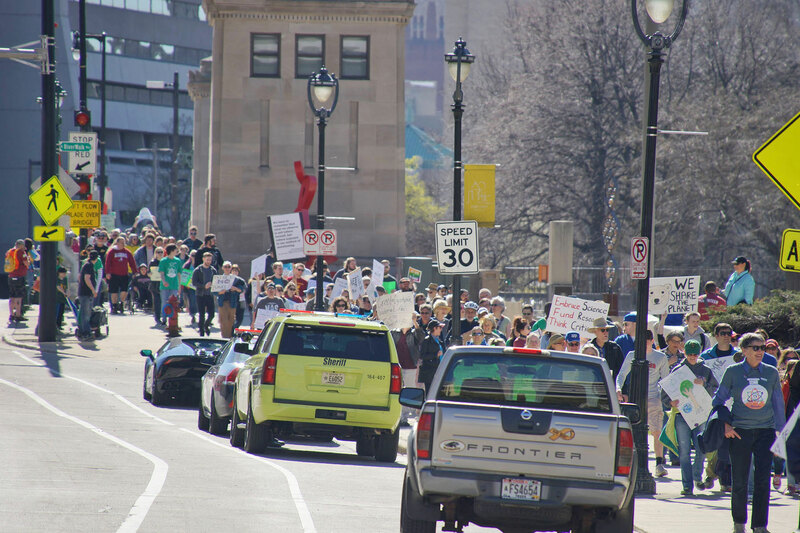 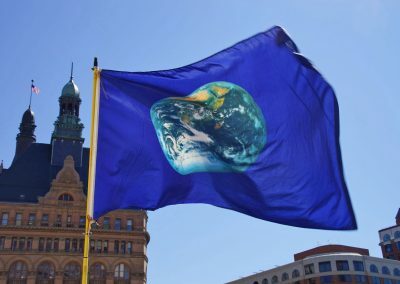 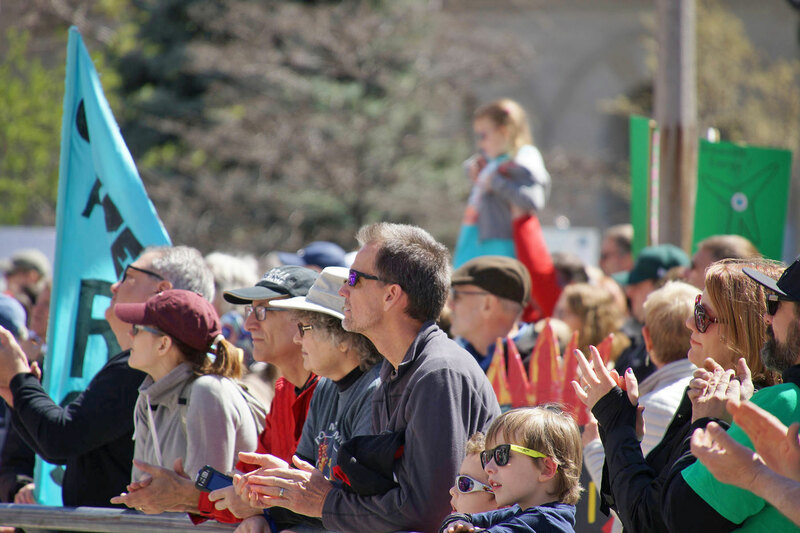 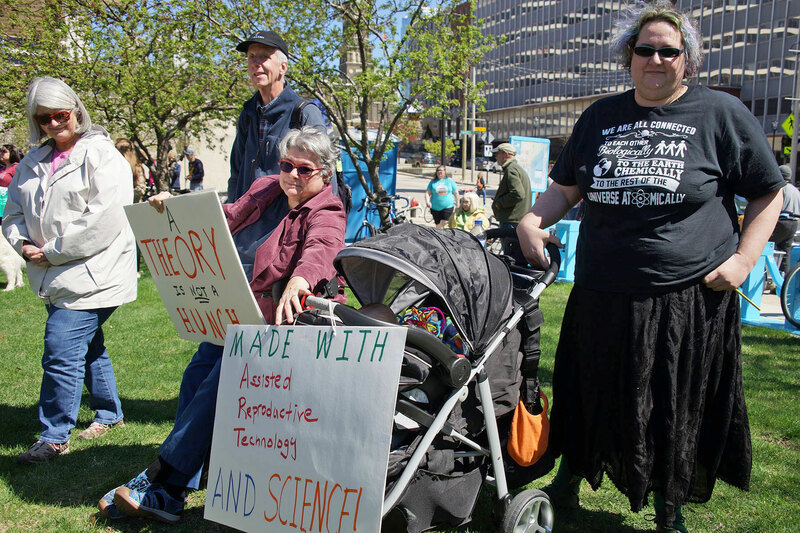 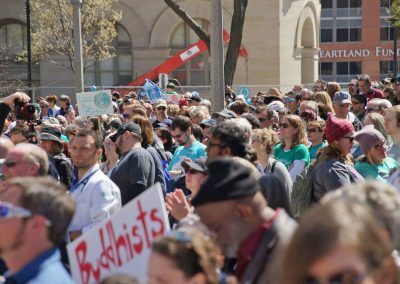 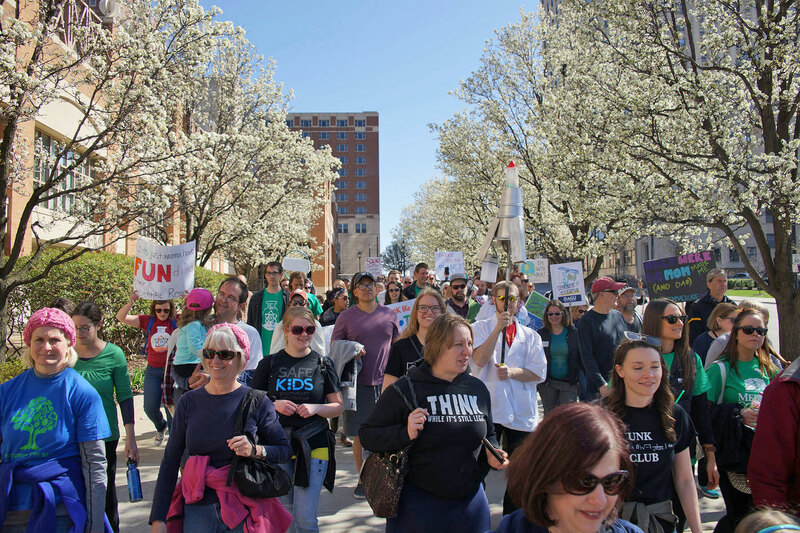 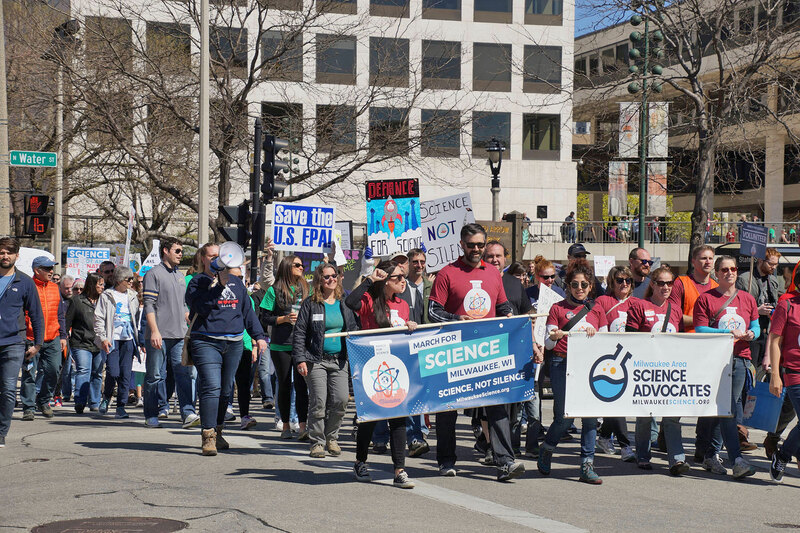 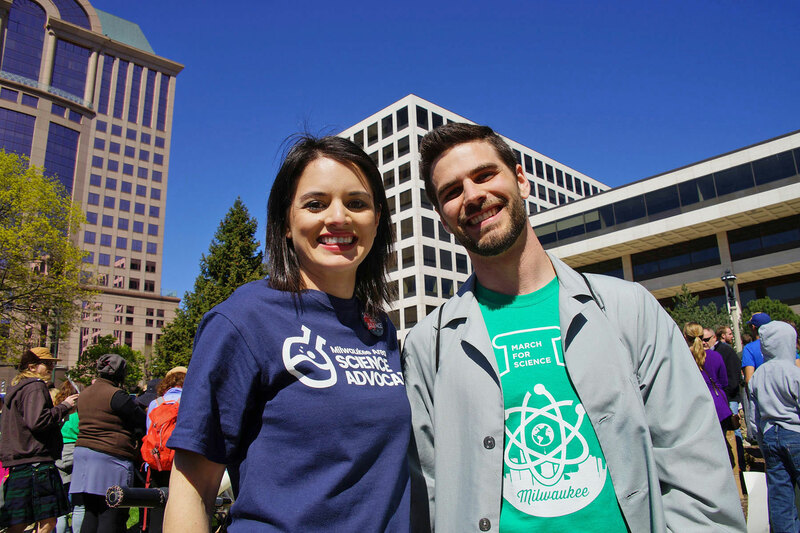 More than 3,000 Milwaukee area science supporters added their voices to the unprecedented numbers of people marching worldwide for science on Earth Day in downtown Milwaukee on April 22. 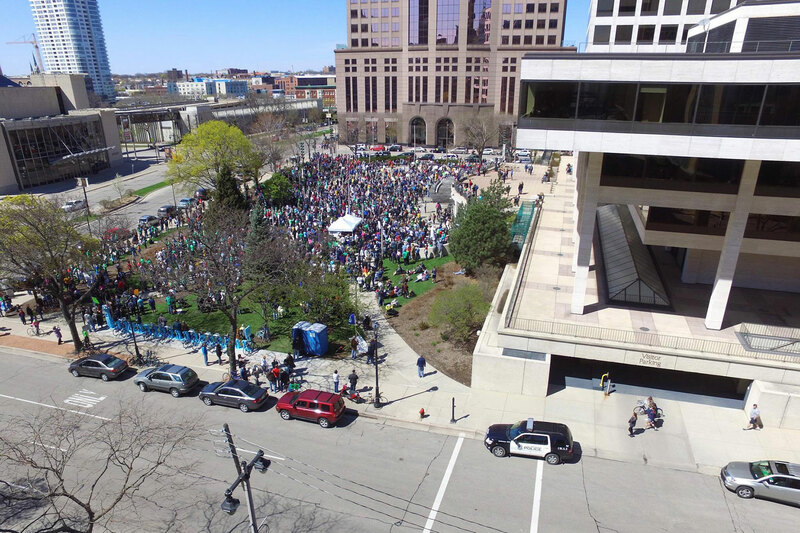 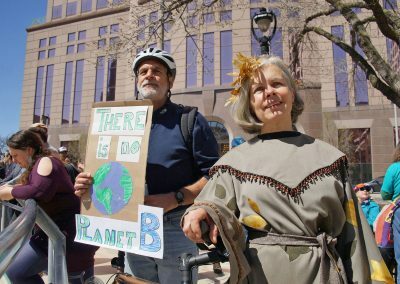 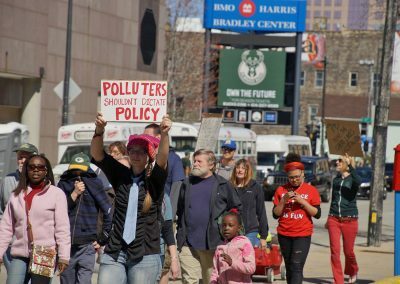 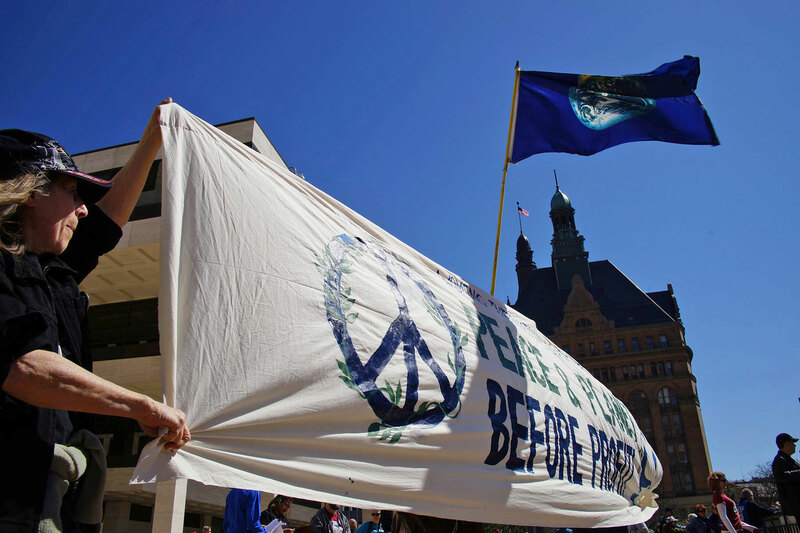 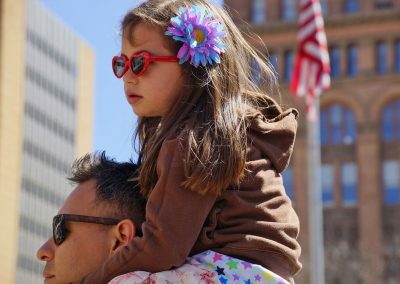 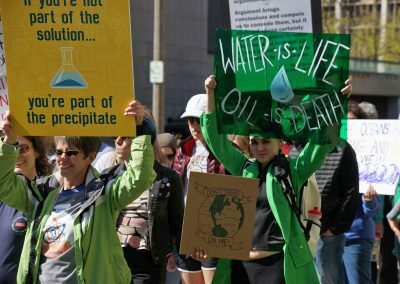 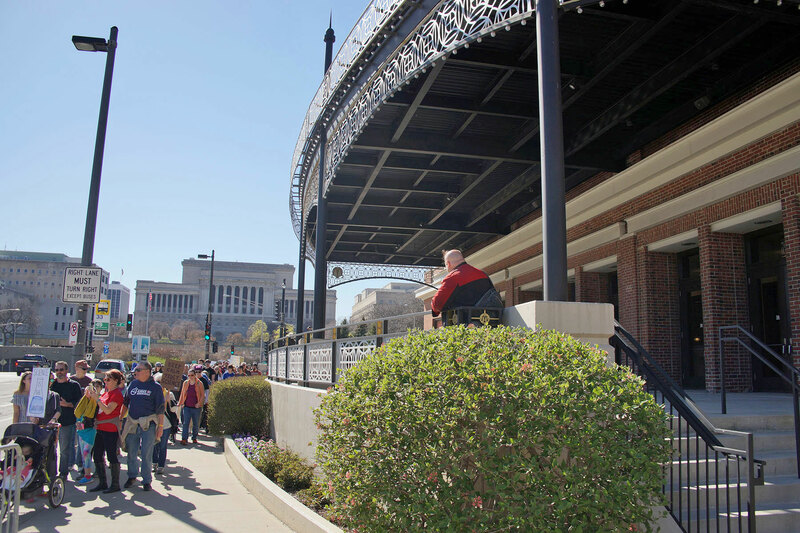 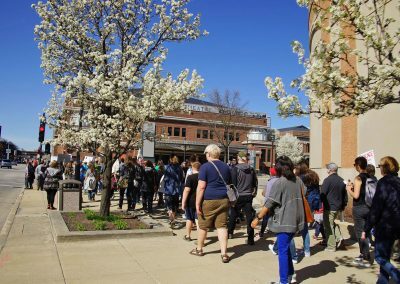 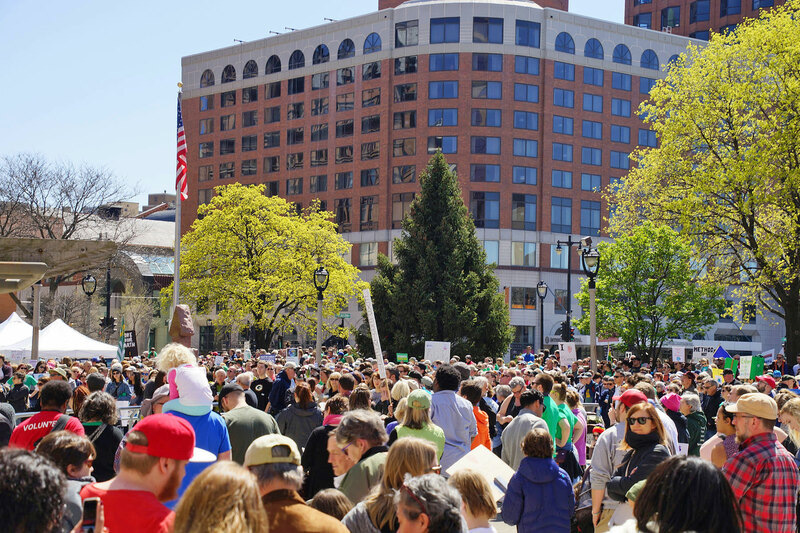 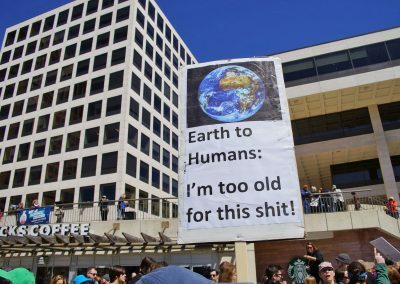 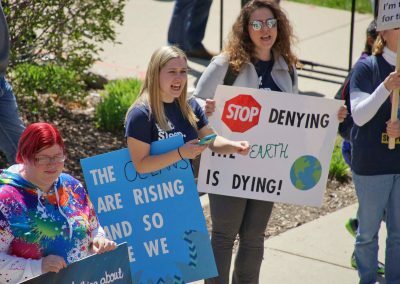 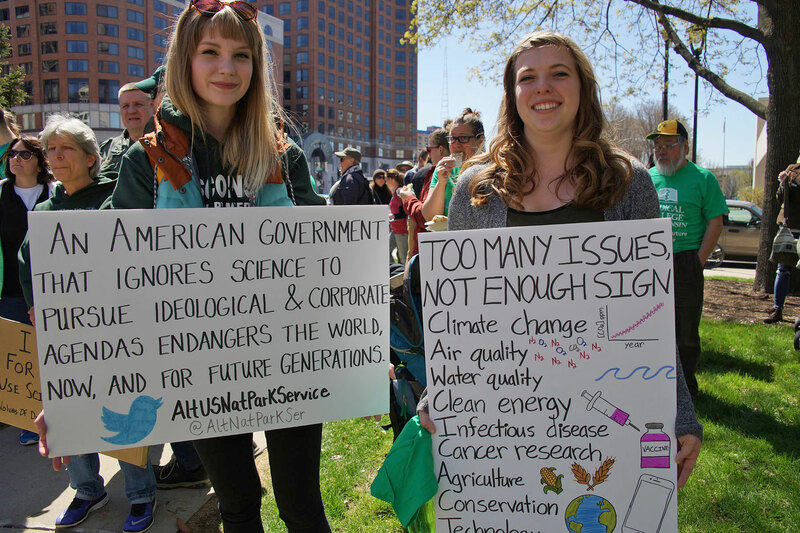 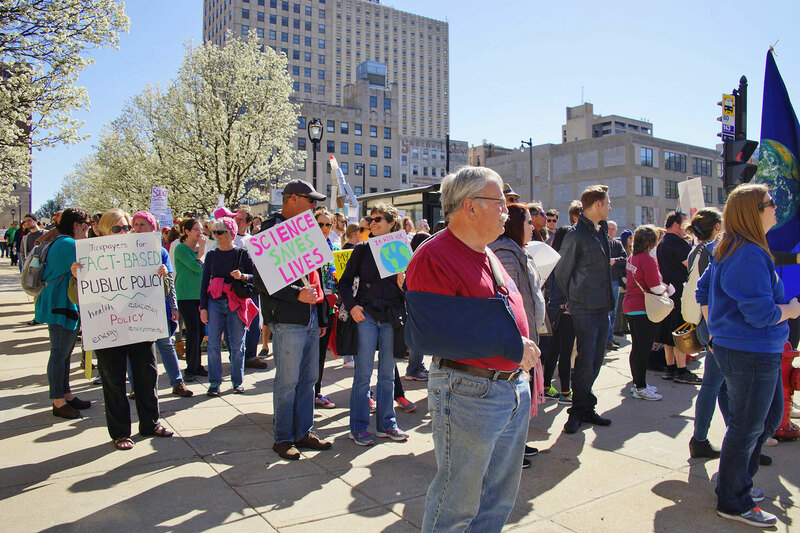 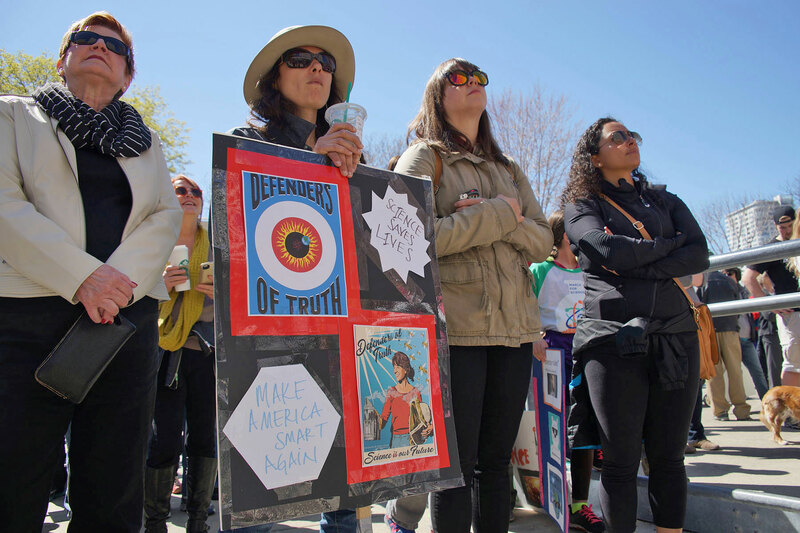 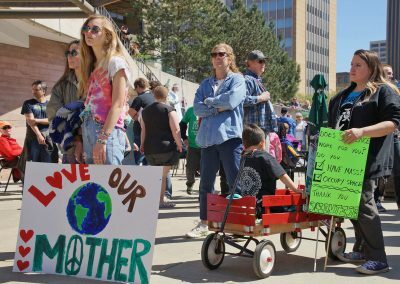 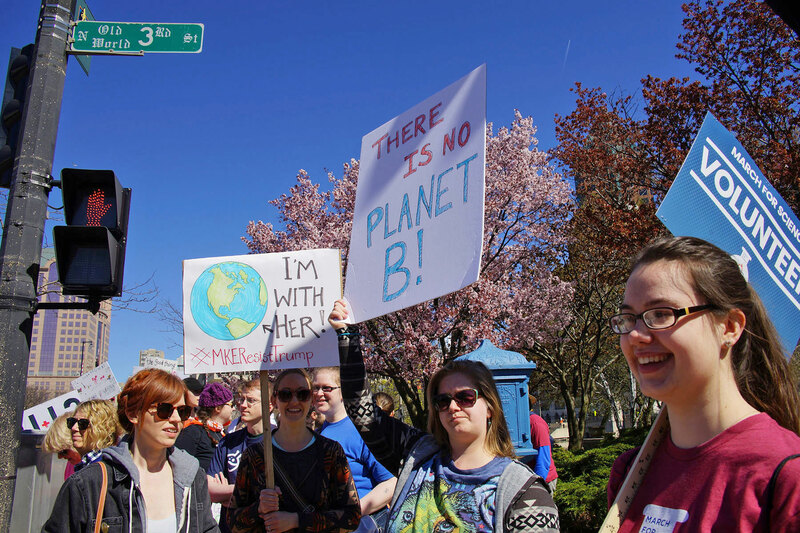 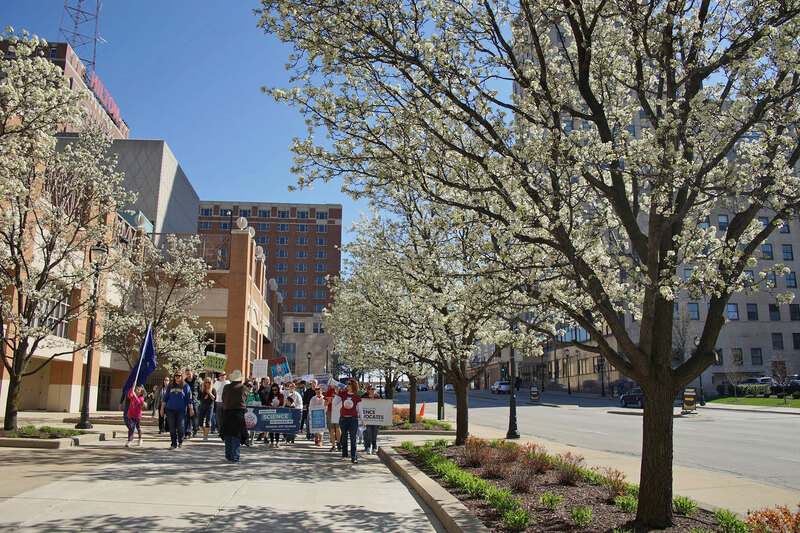 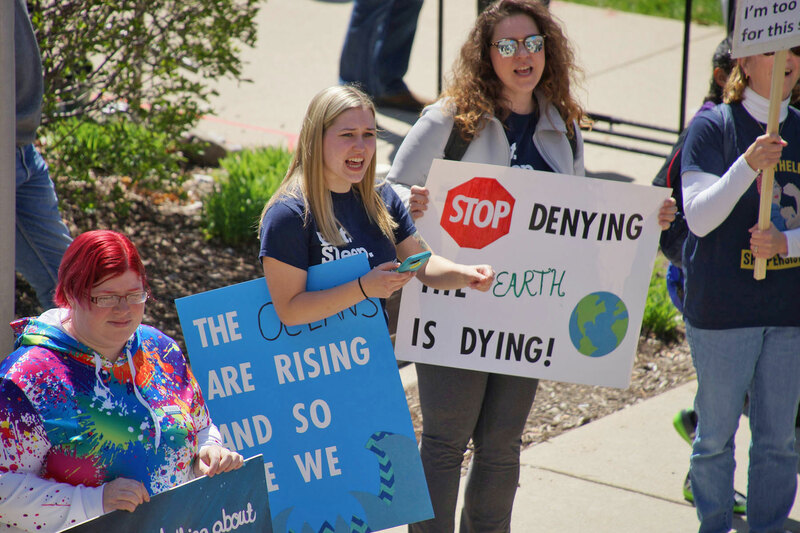 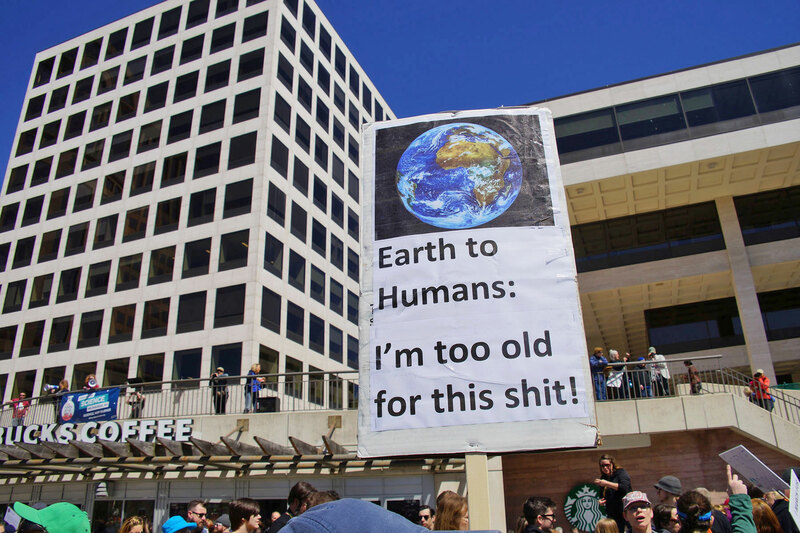 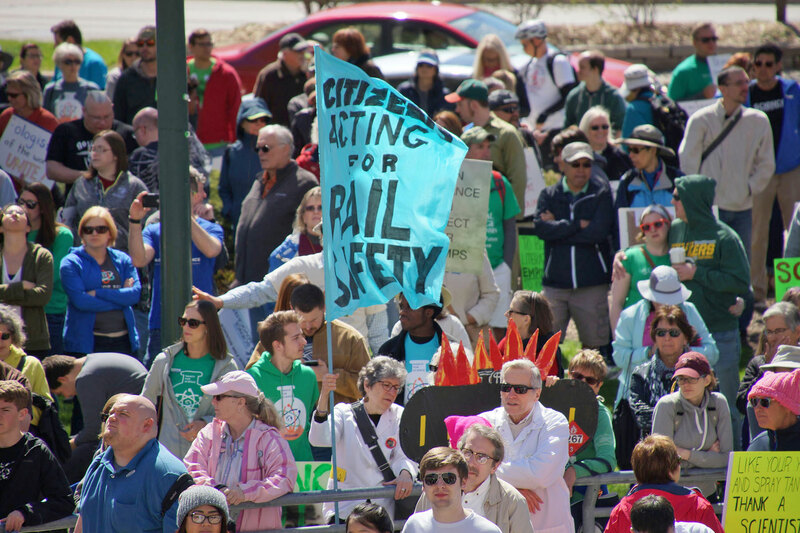 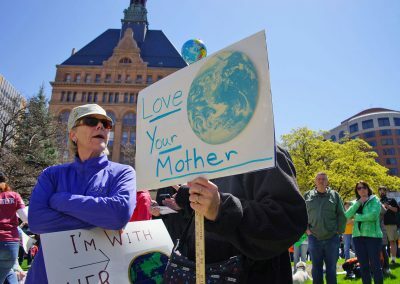 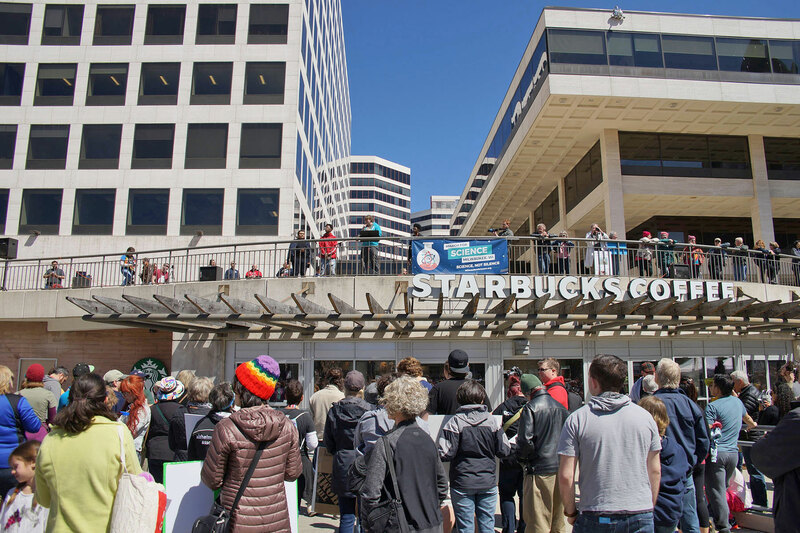 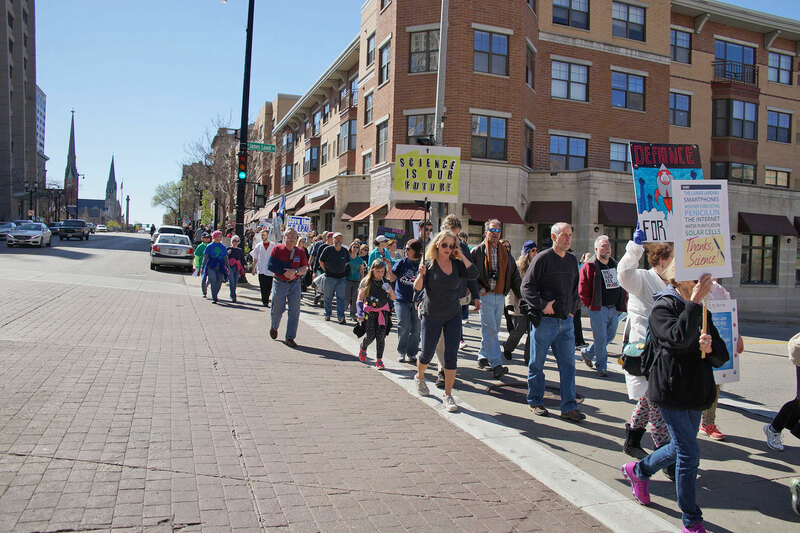 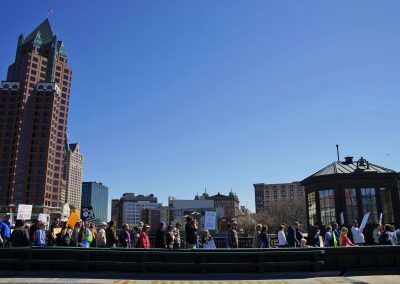 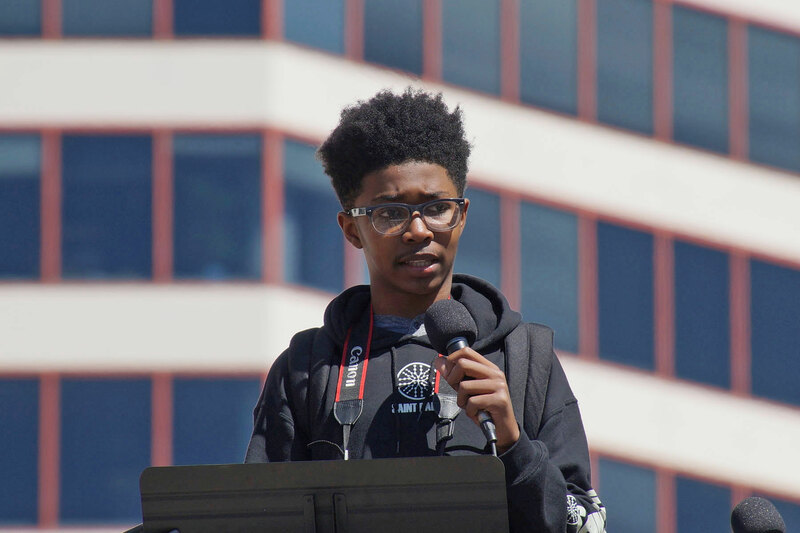 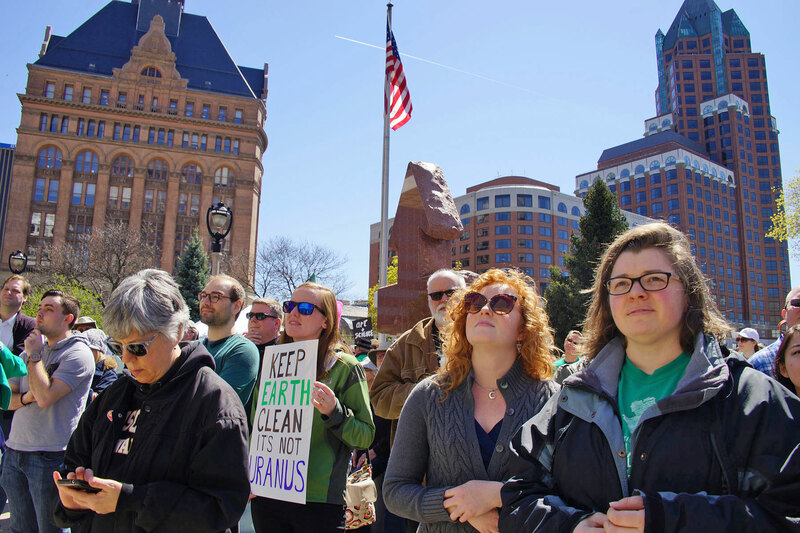 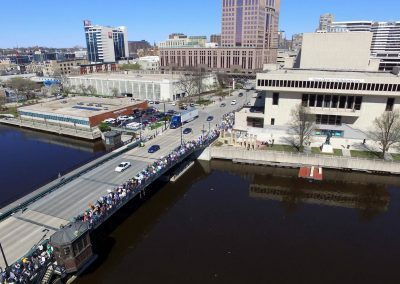 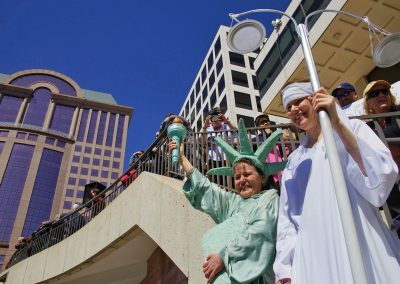 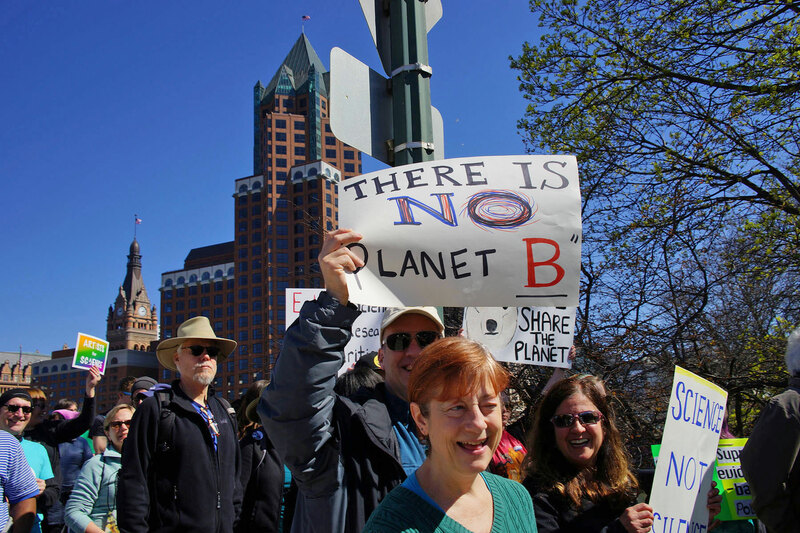 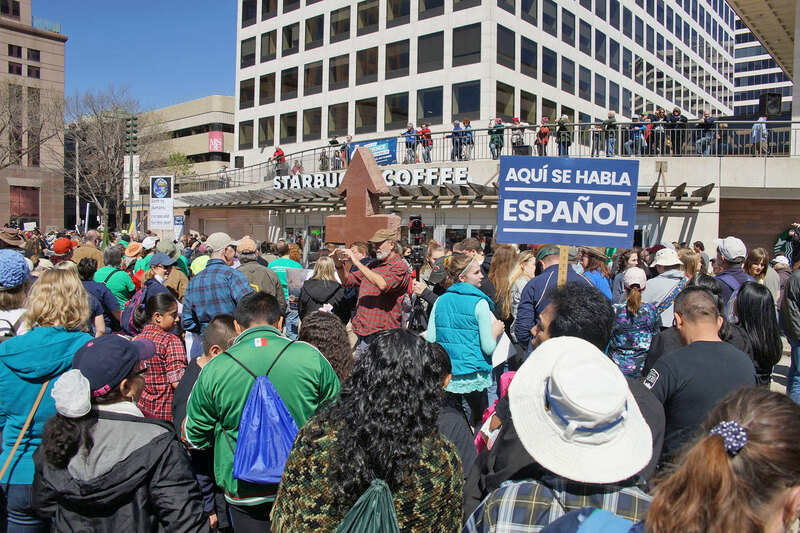 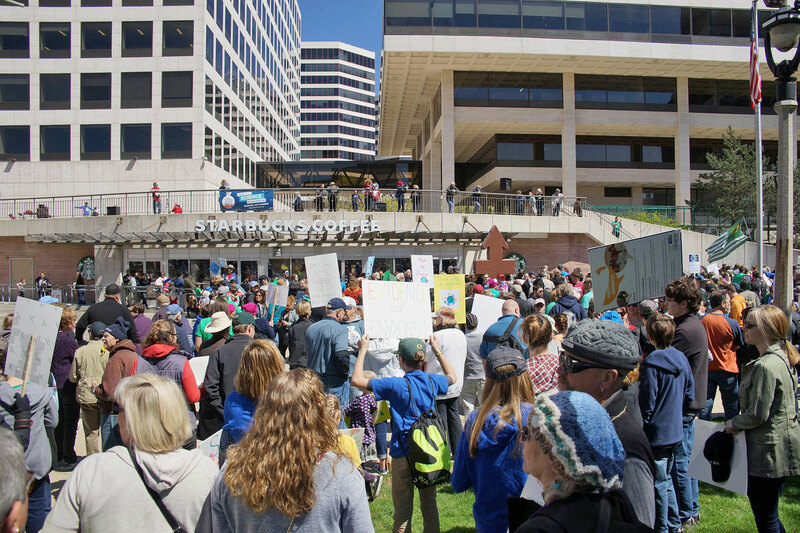 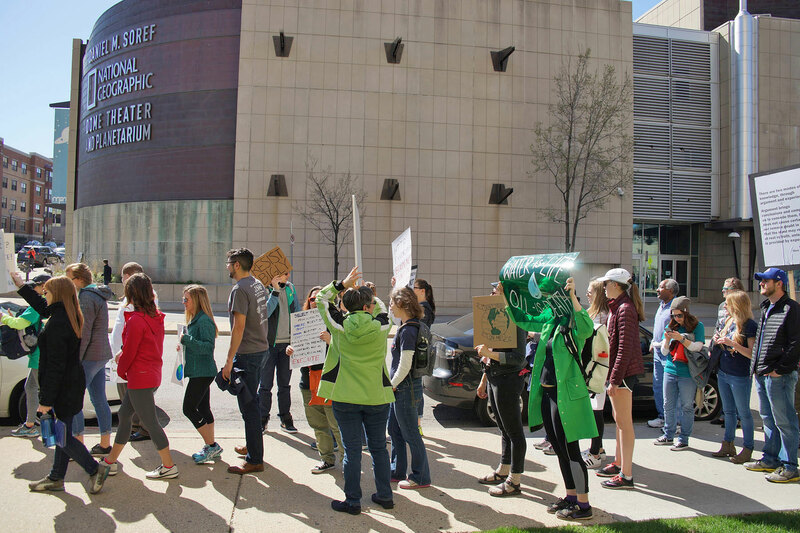 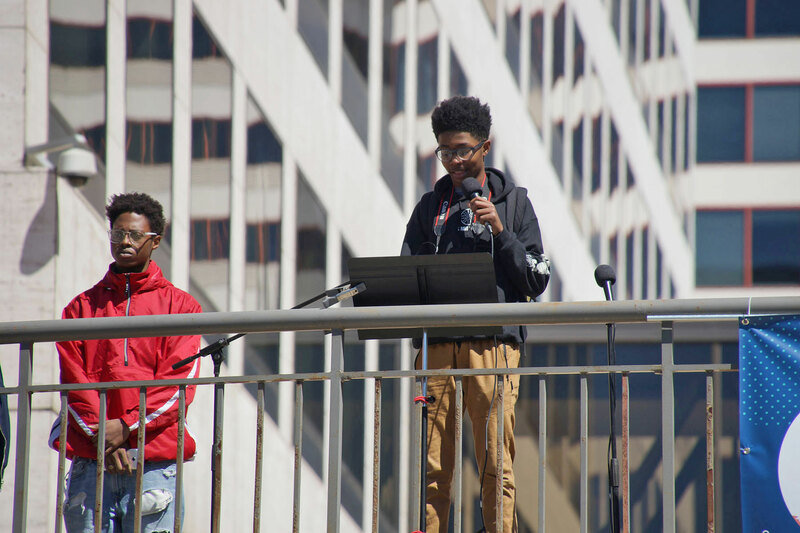 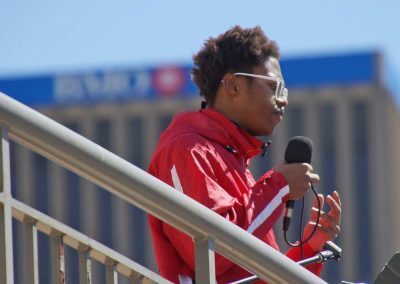 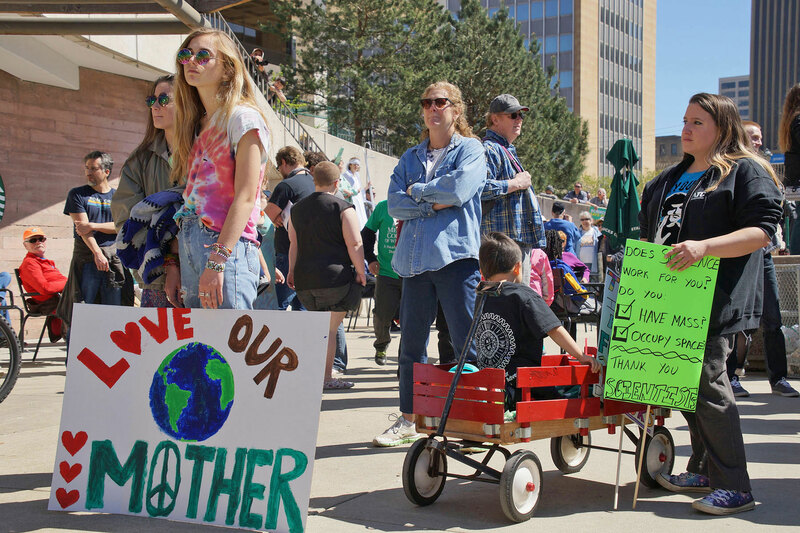 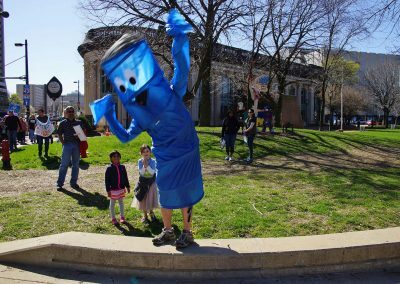 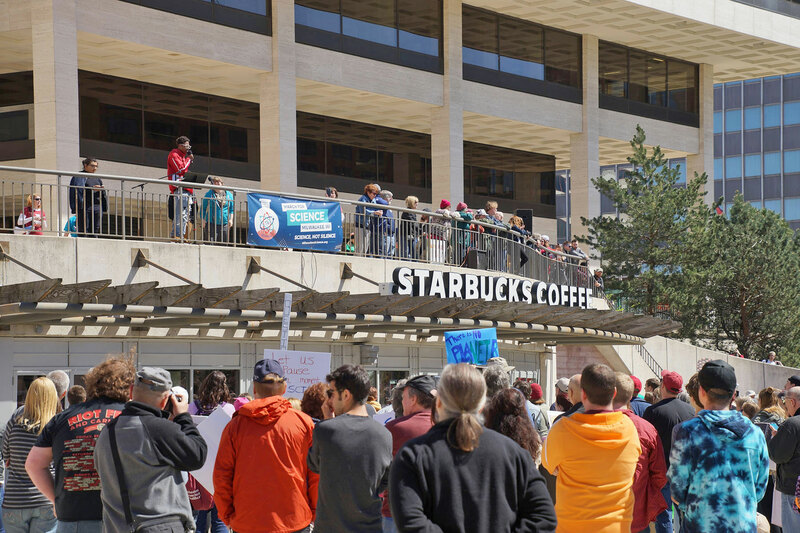 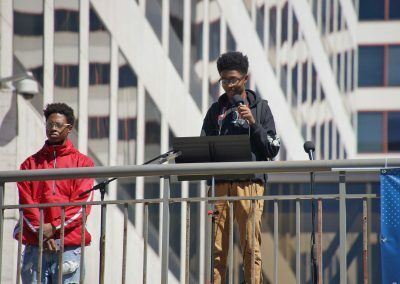 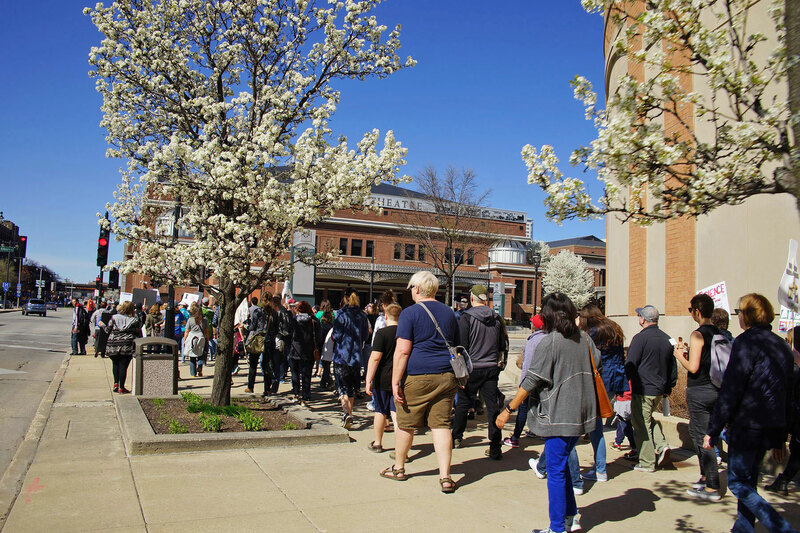 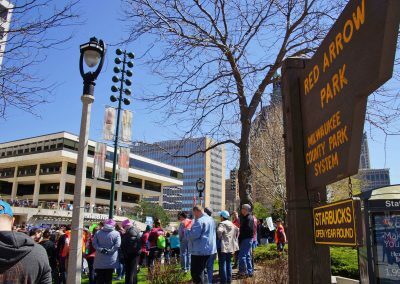 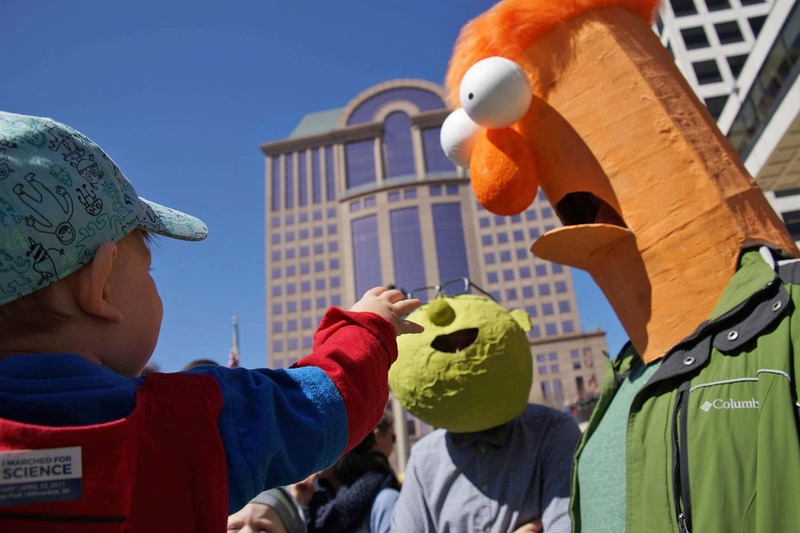 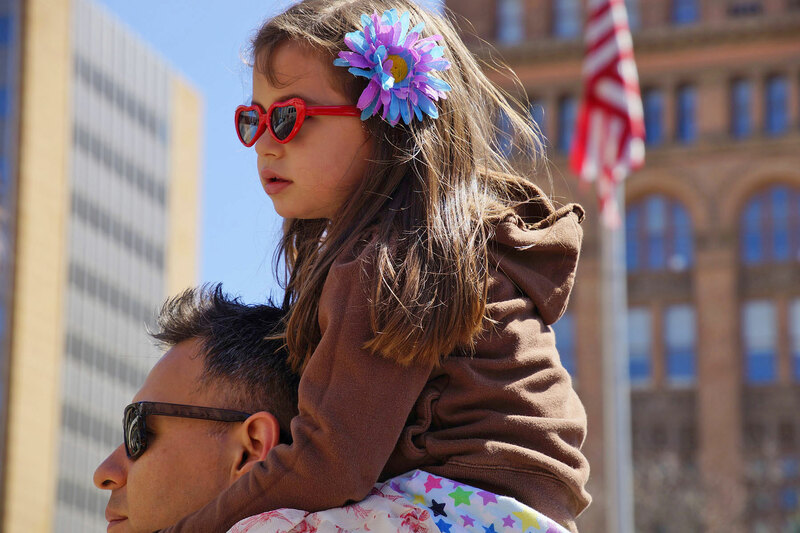 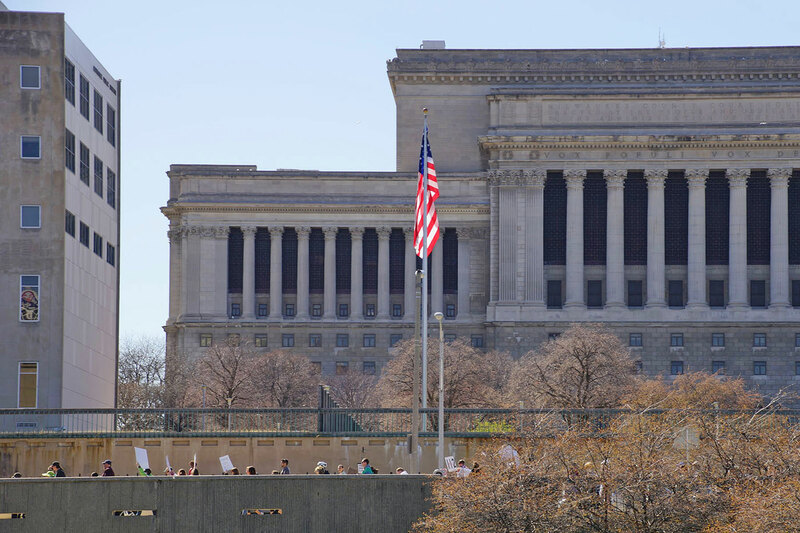 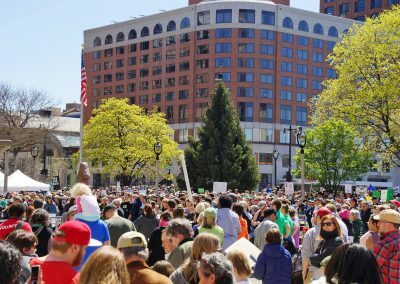 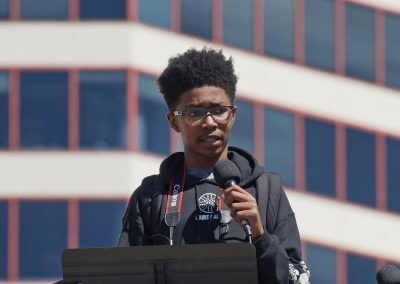 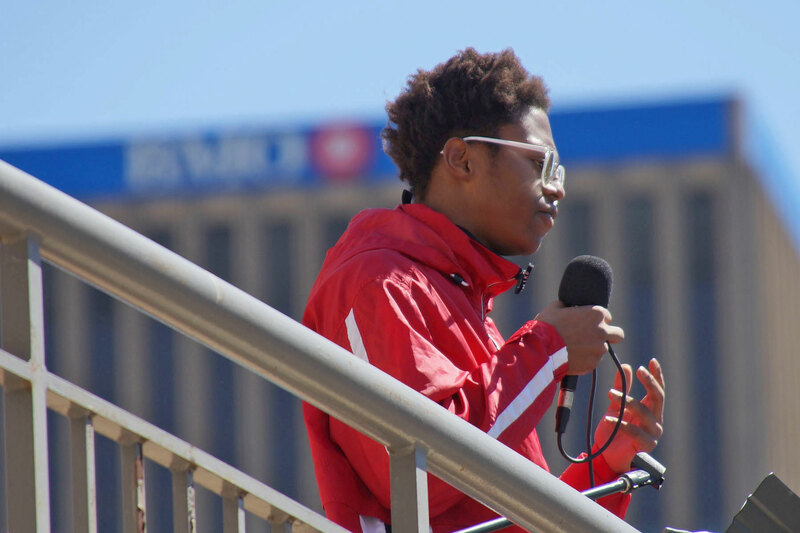 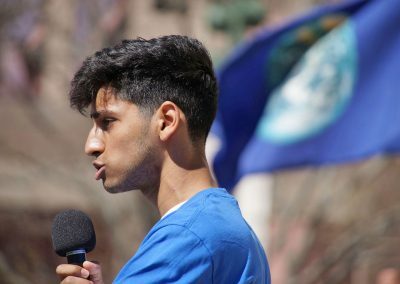 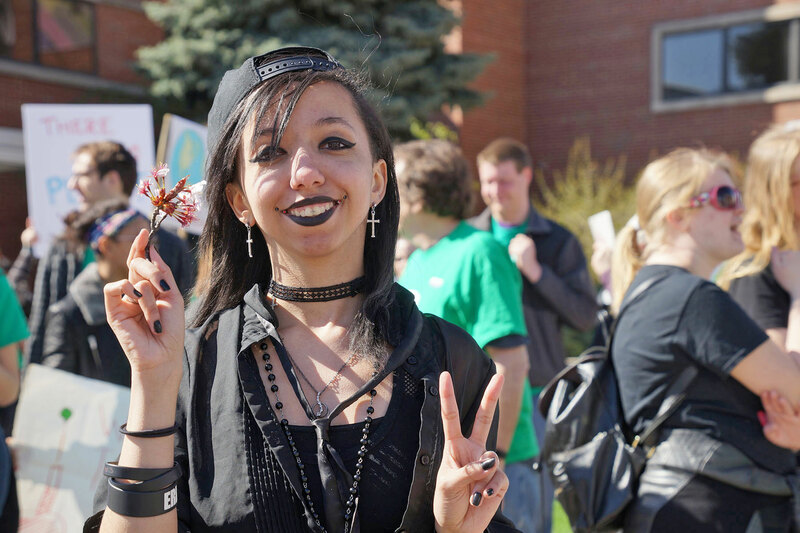 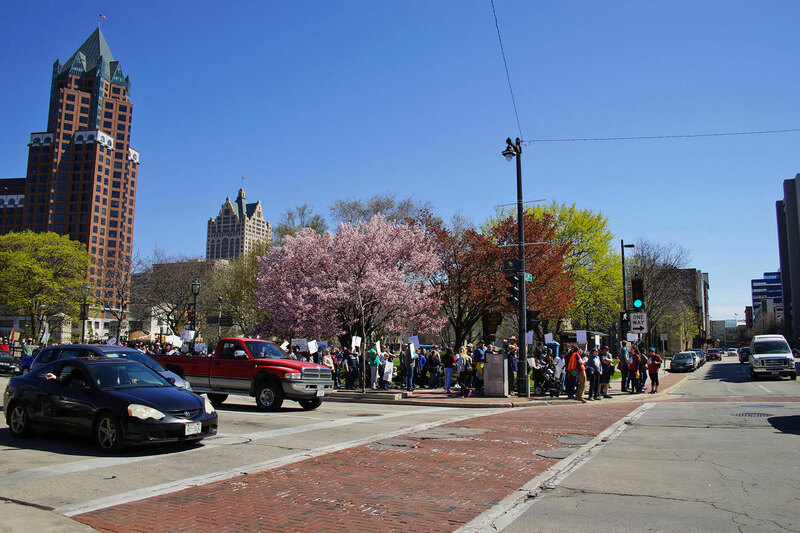 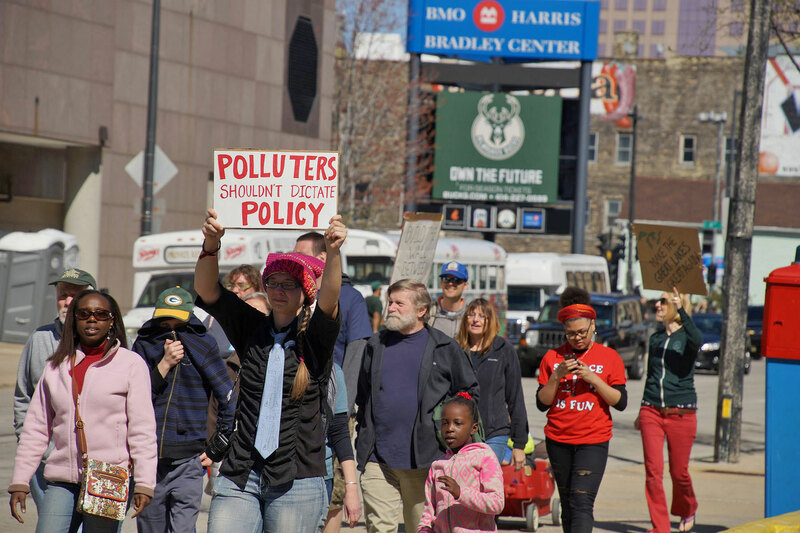 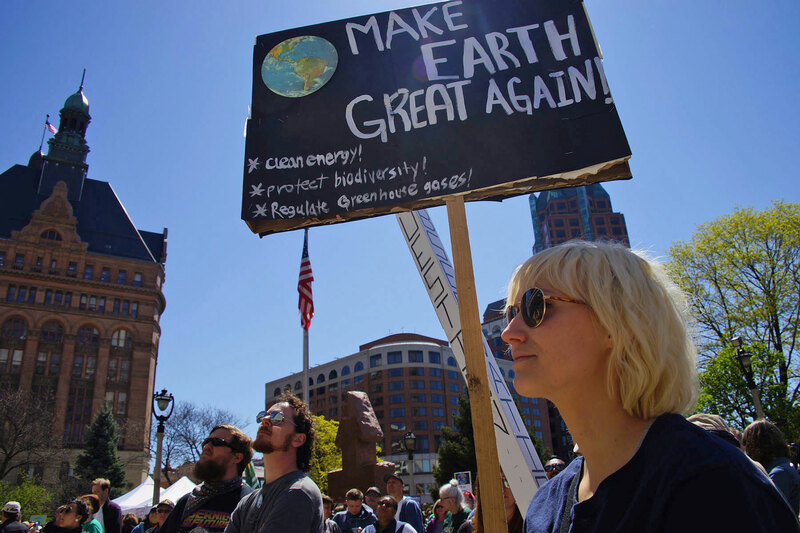 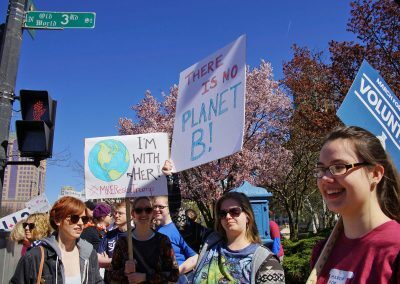 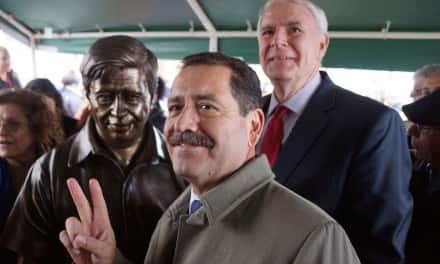 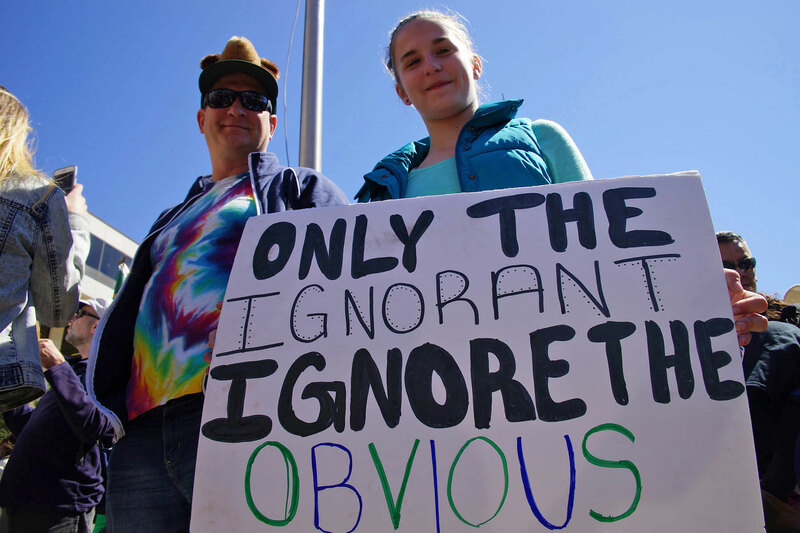 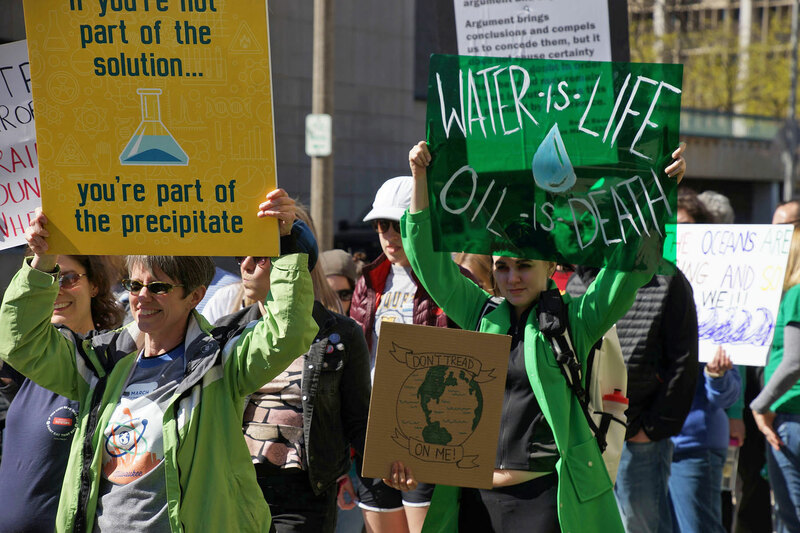 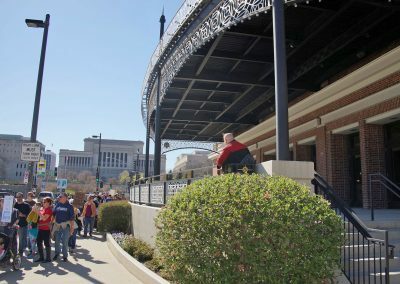 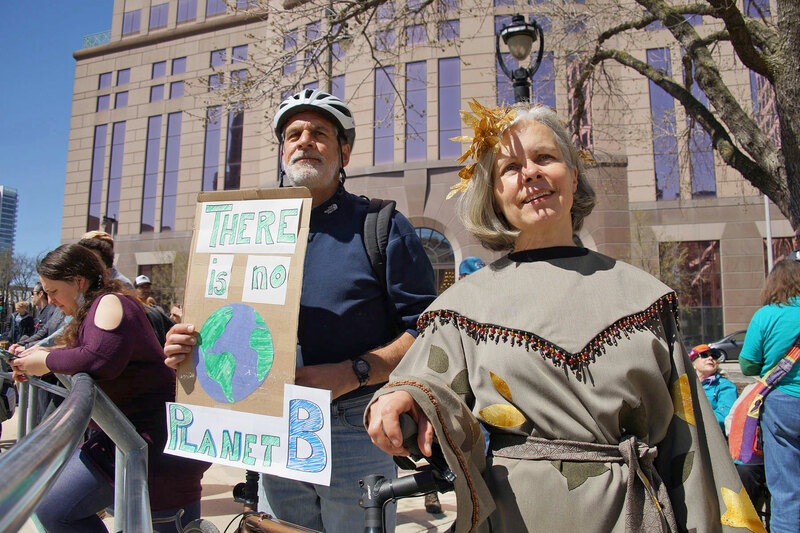 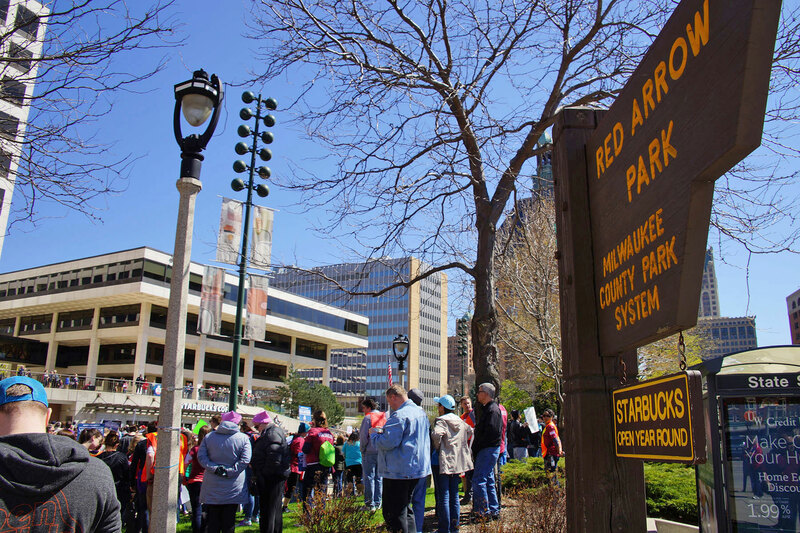 Young and old of all political affiliations gathered on Earth Day to rally at Red Arrow Park before heading for the city streets to remind their elected officials that evidence-based policy was vital. 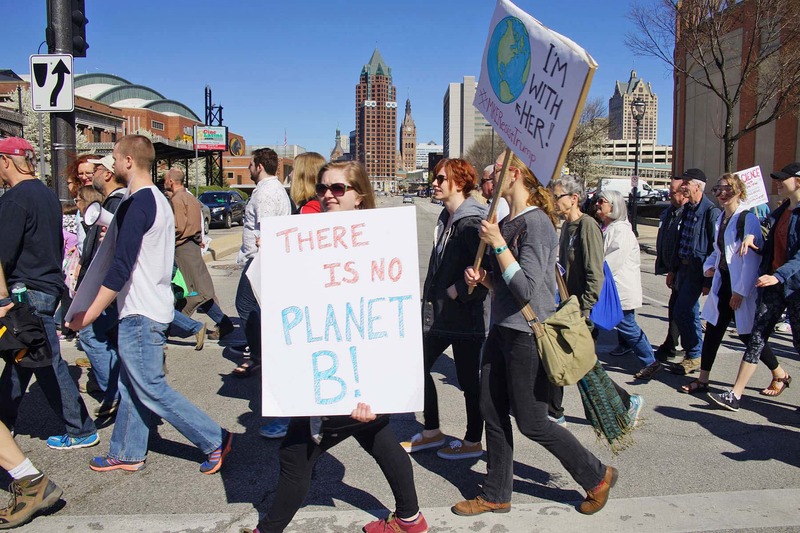 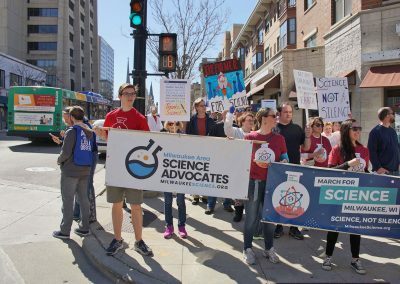 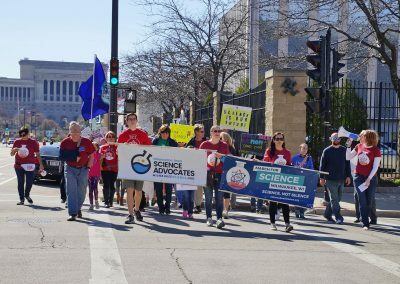 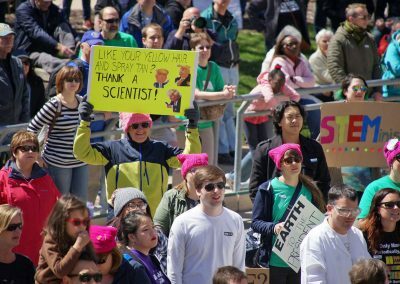 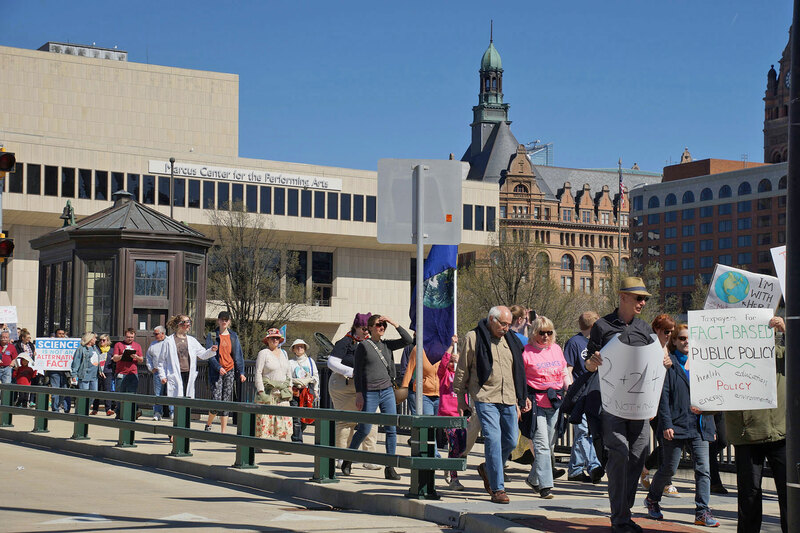 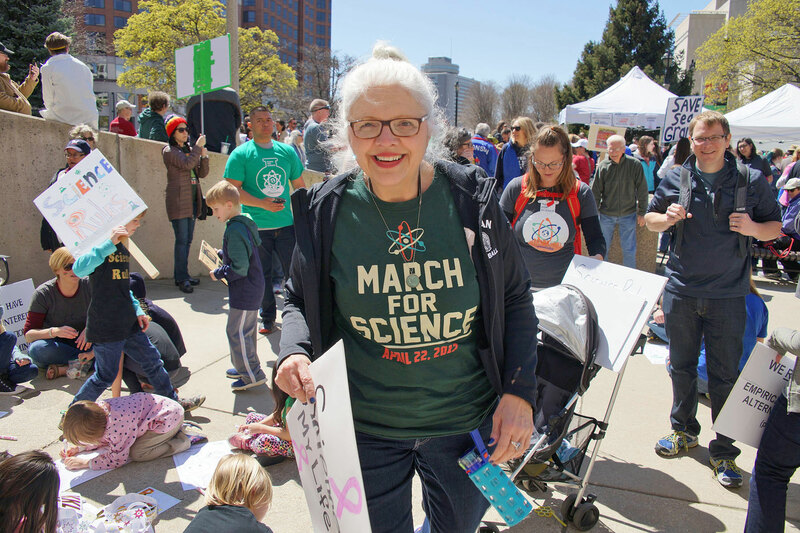 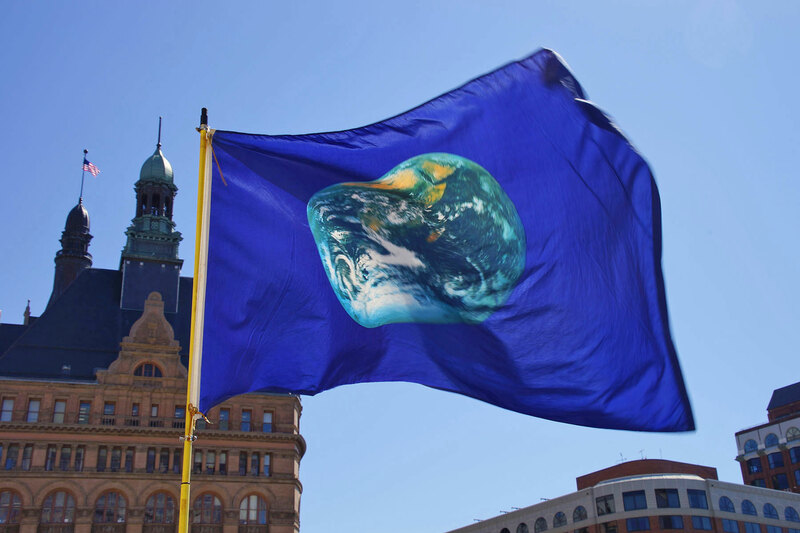 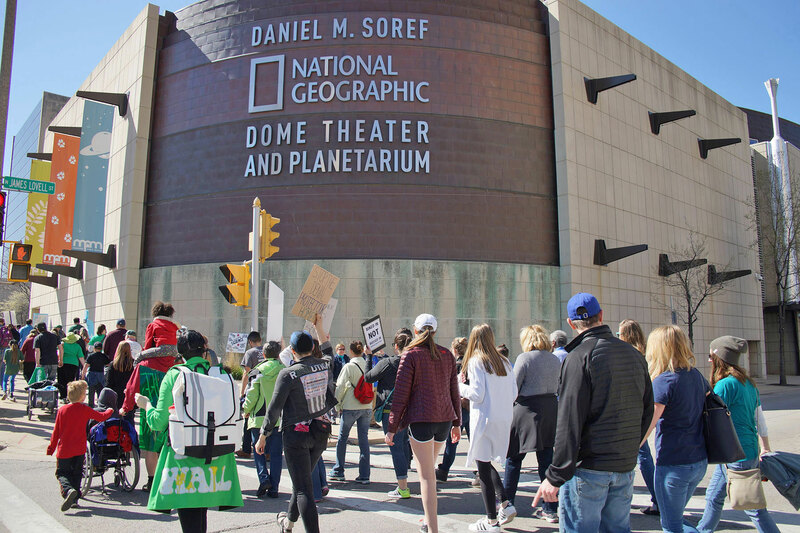 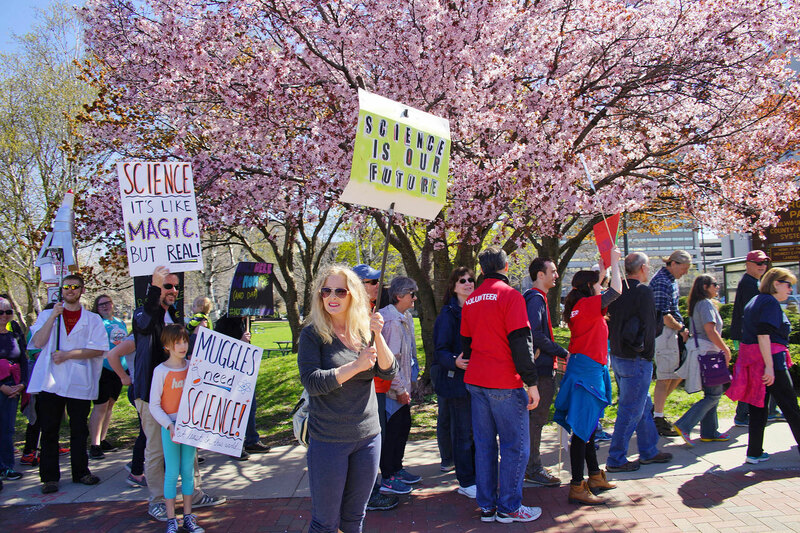 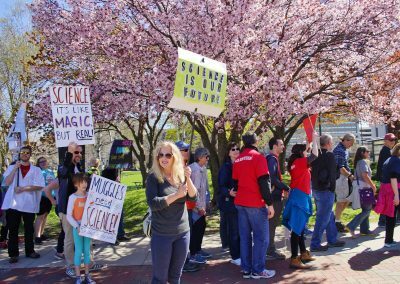 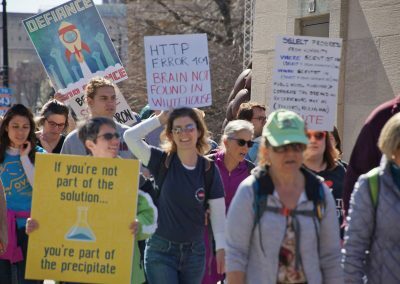 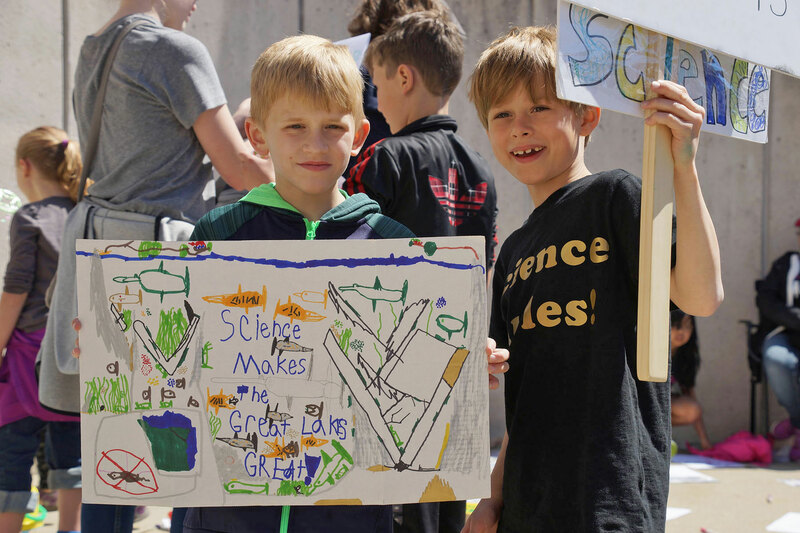 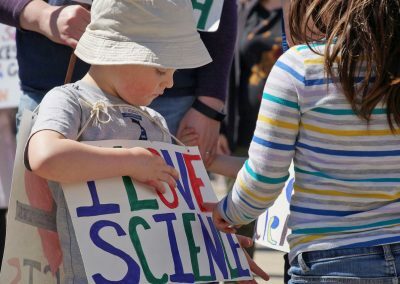 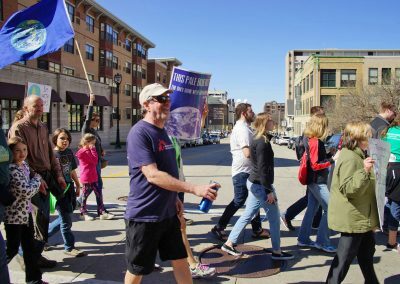 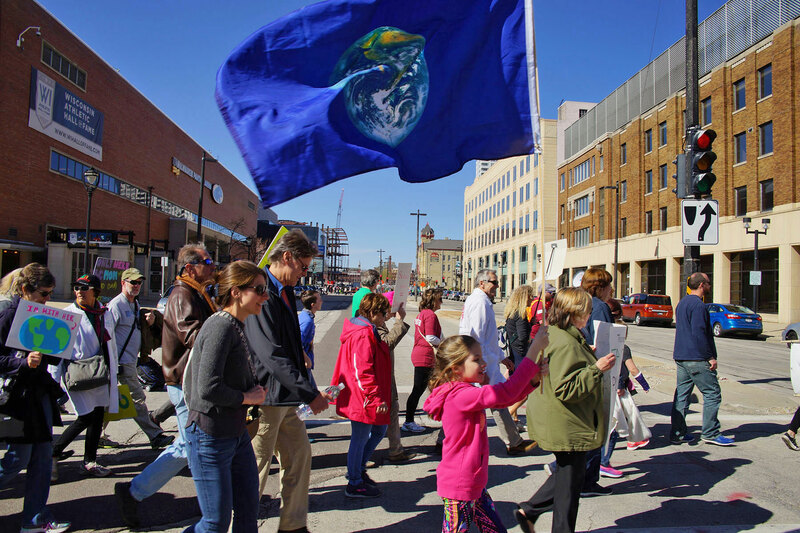 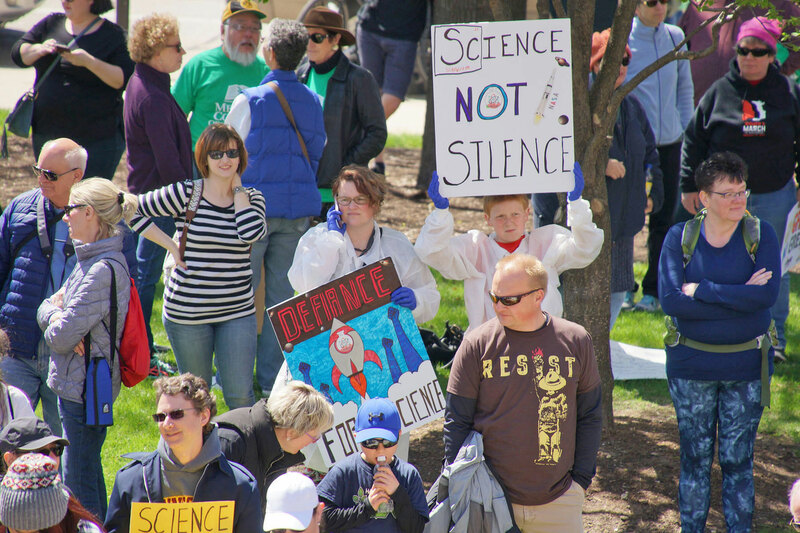 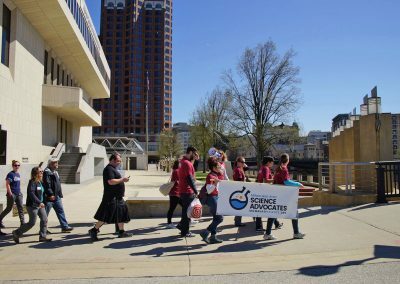 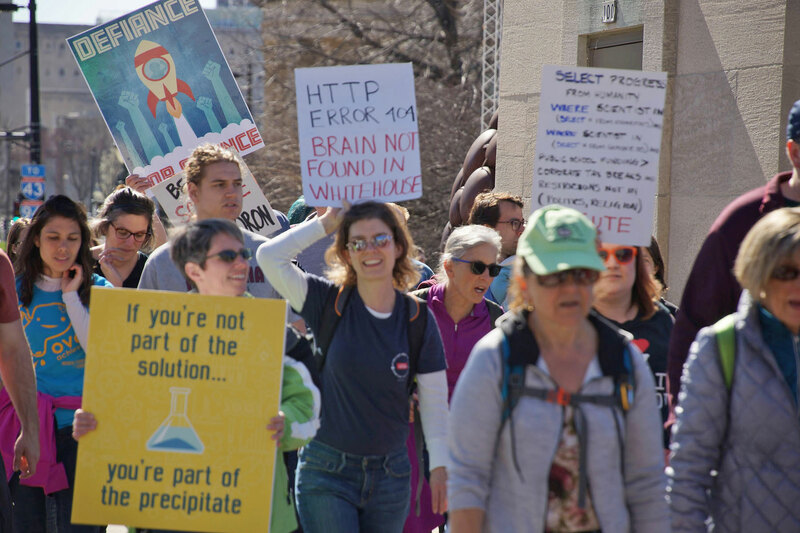 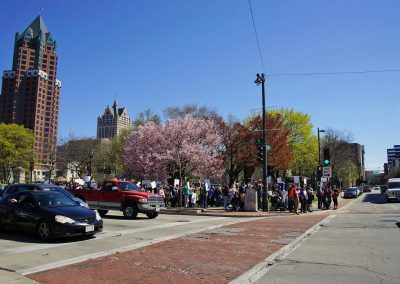 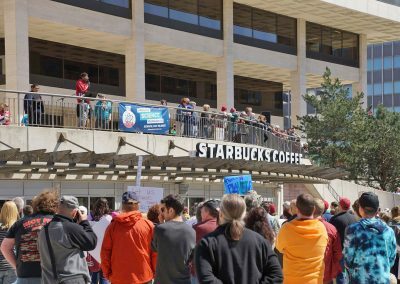 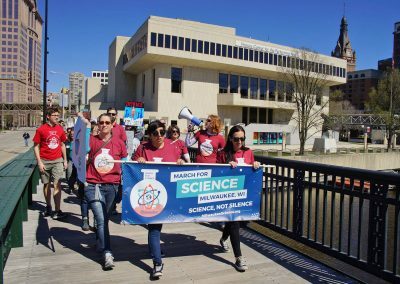 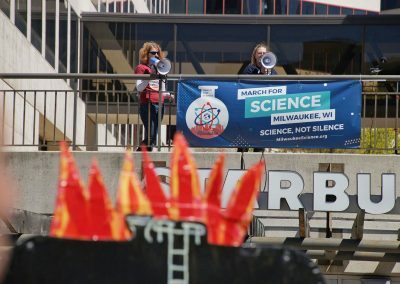 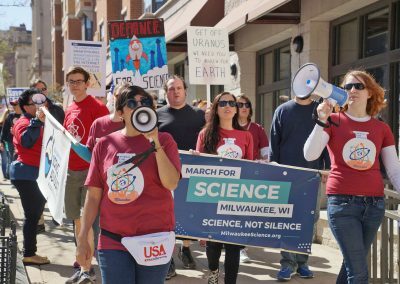 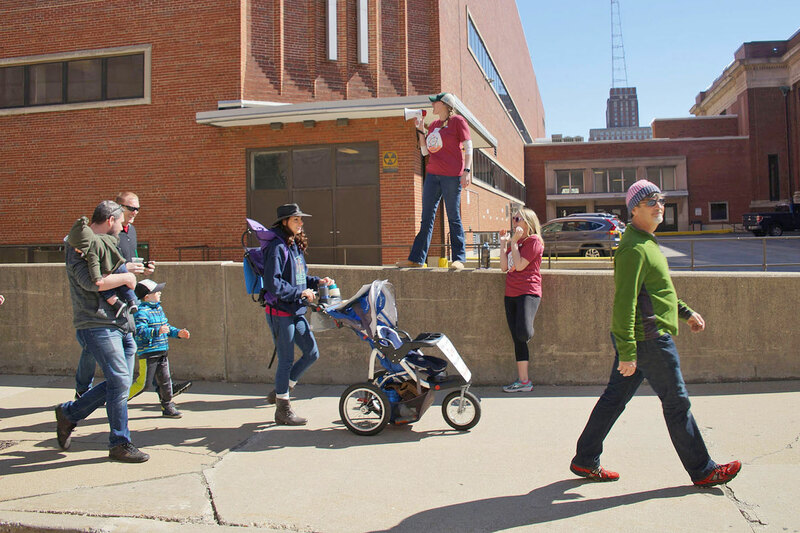 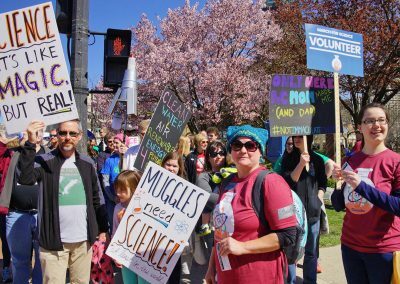 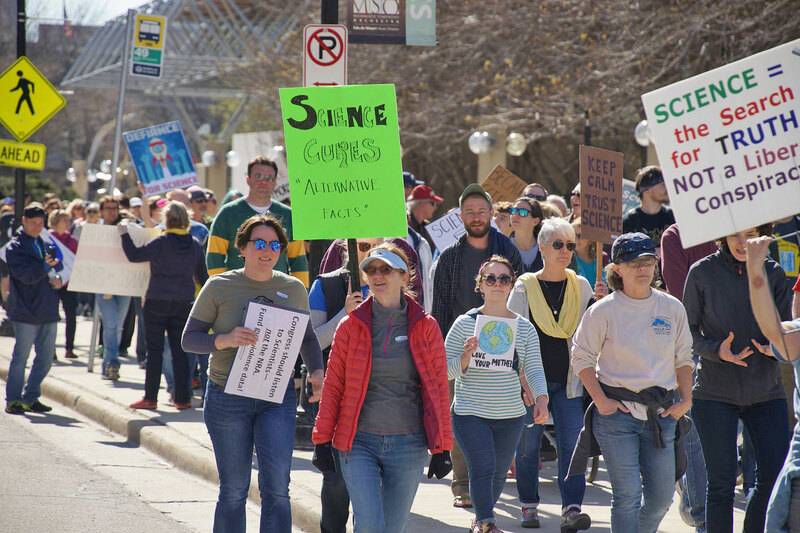 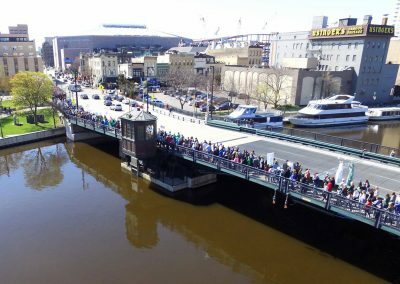 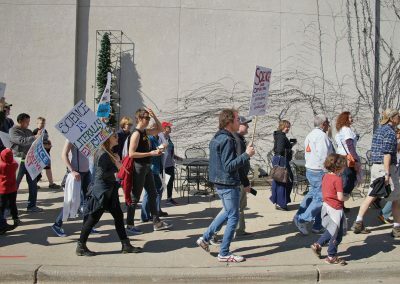 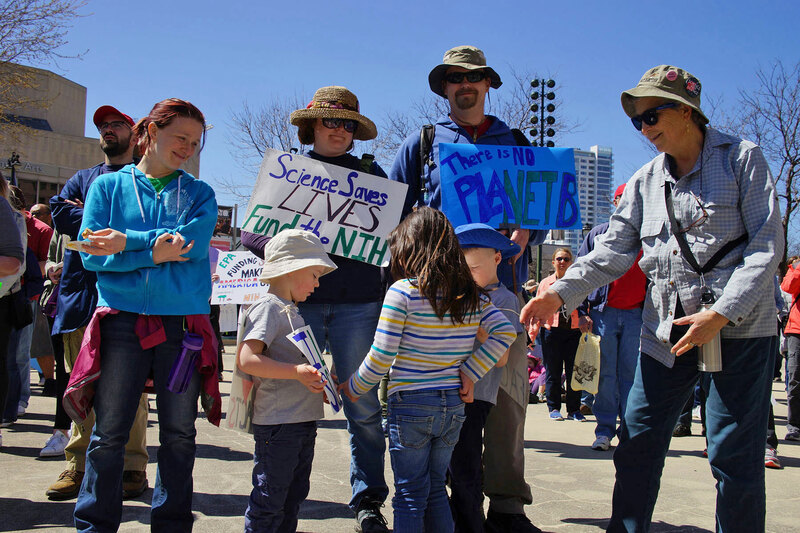 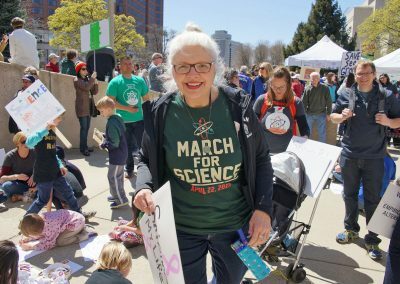 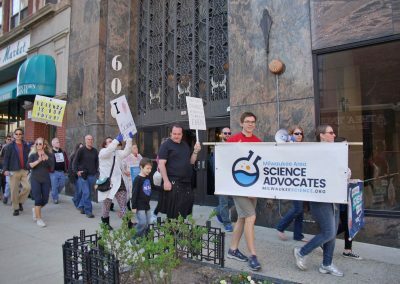 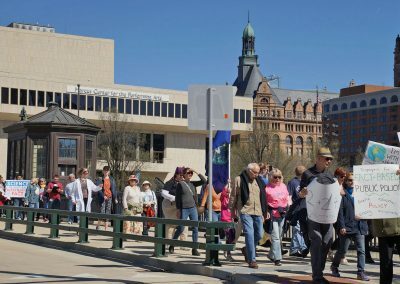 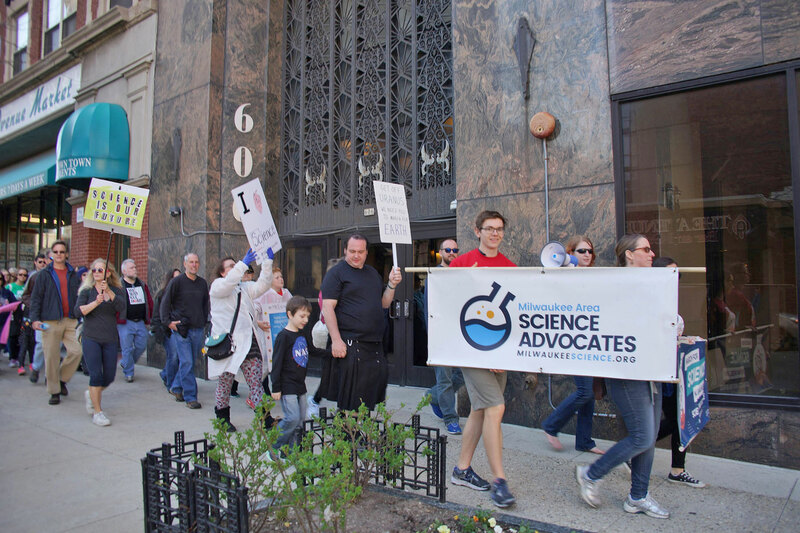 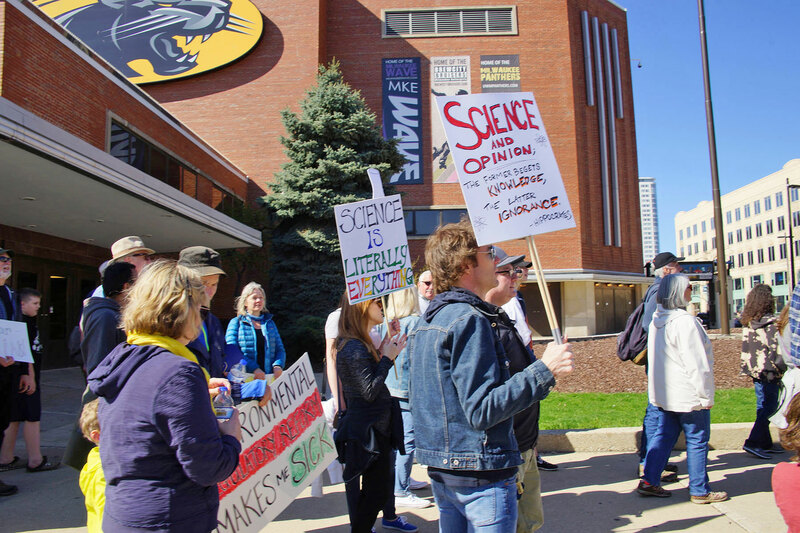 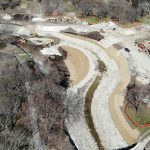 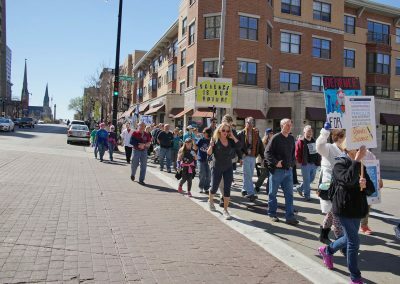 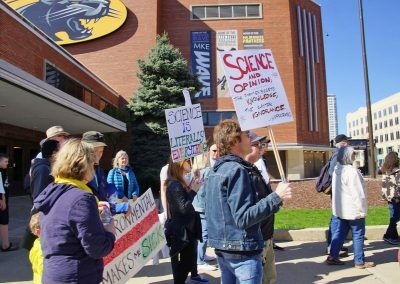 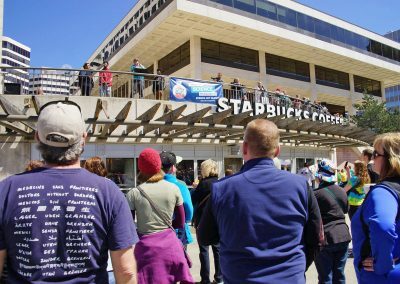 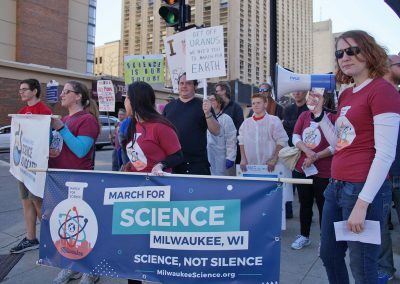 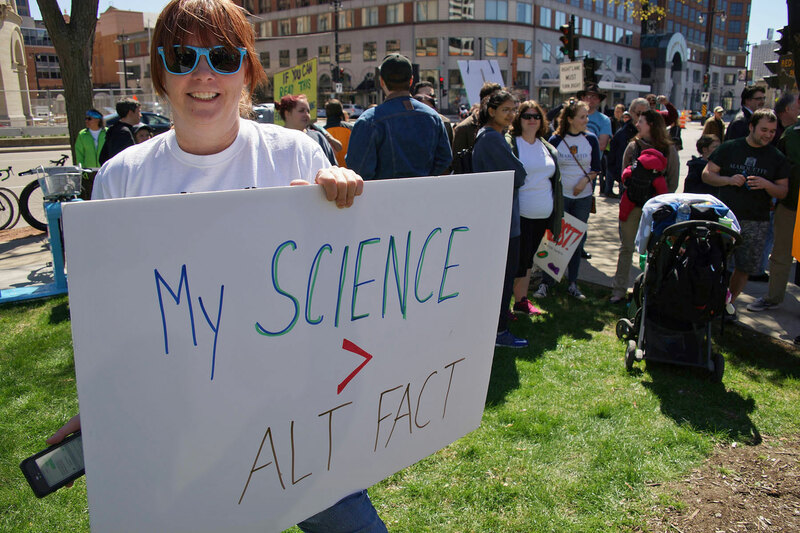 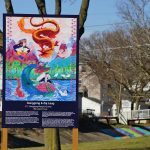 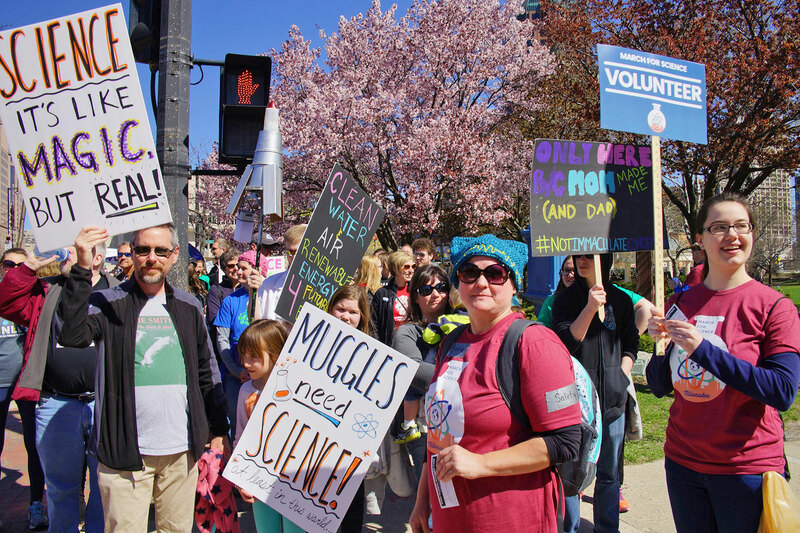 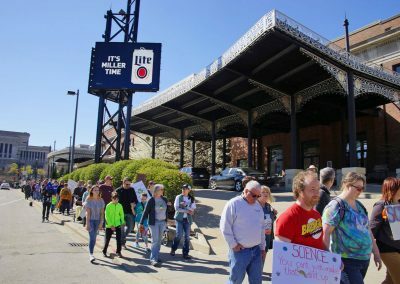 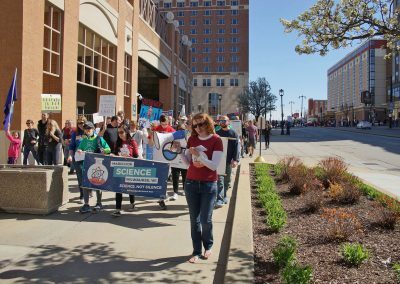 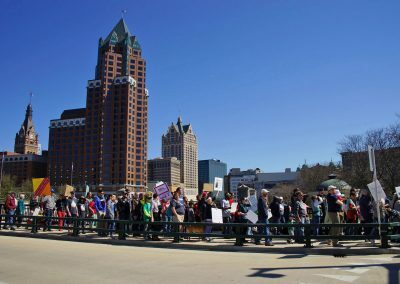 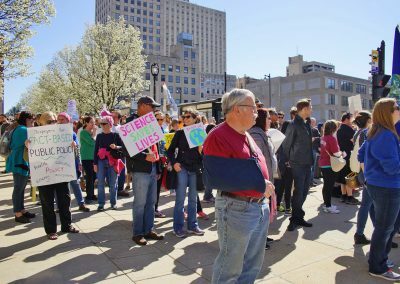 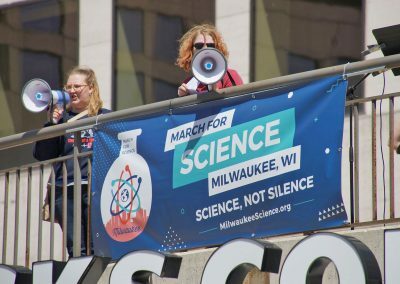 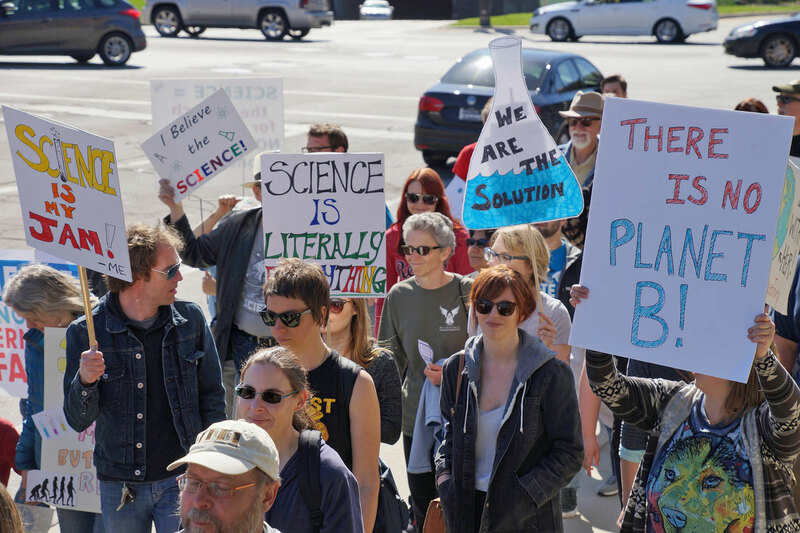 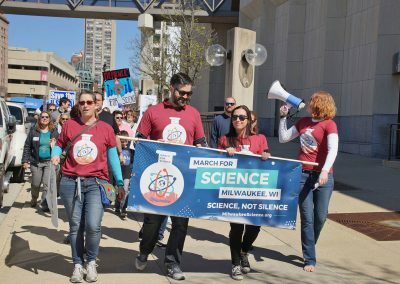 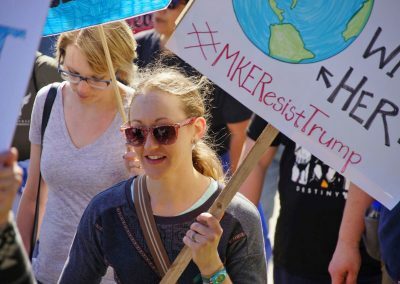 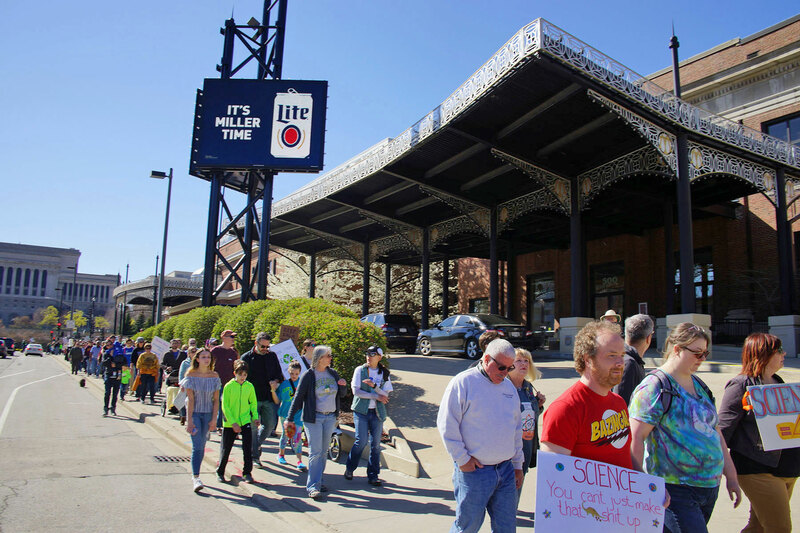 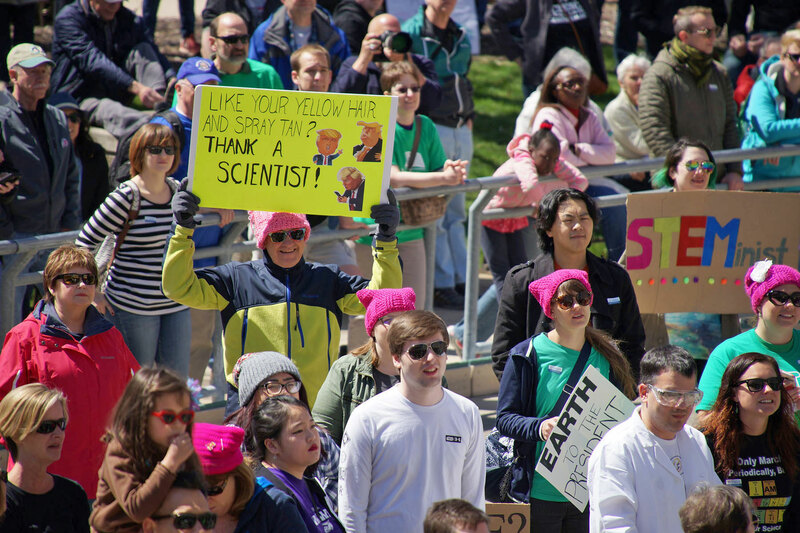 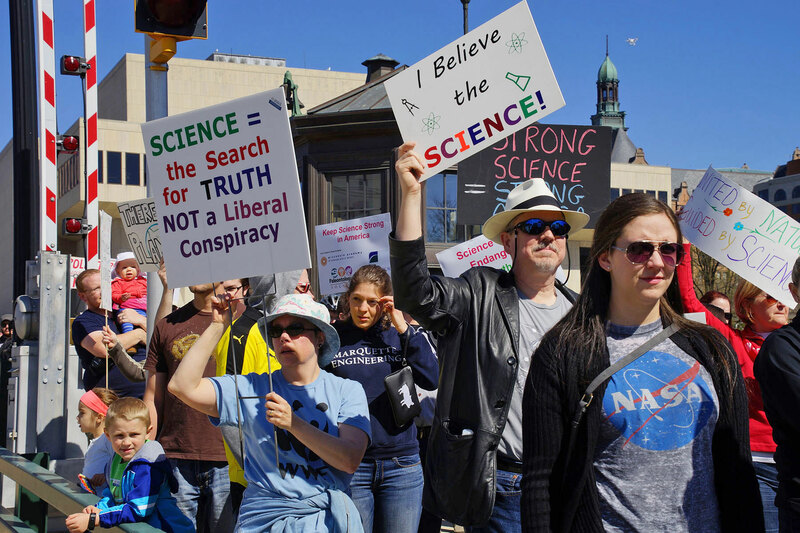 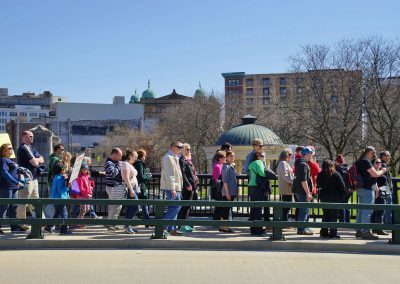 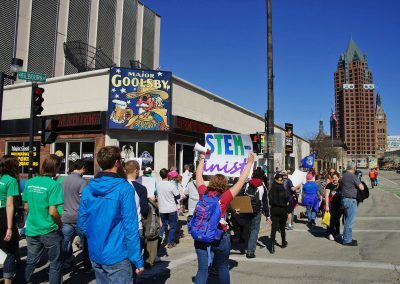 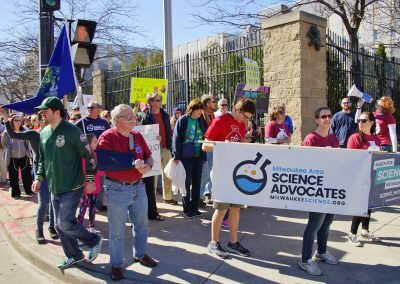 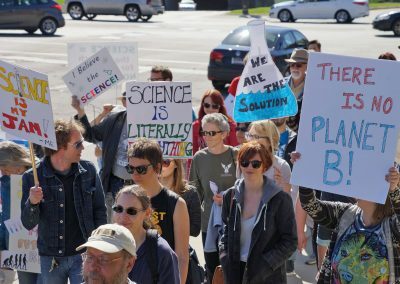 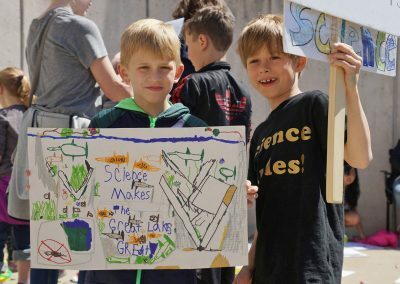 Milwaukee area supporters gathered in conjunction with over 500 satellite marches that happened simultaneously around the planet in support of science. 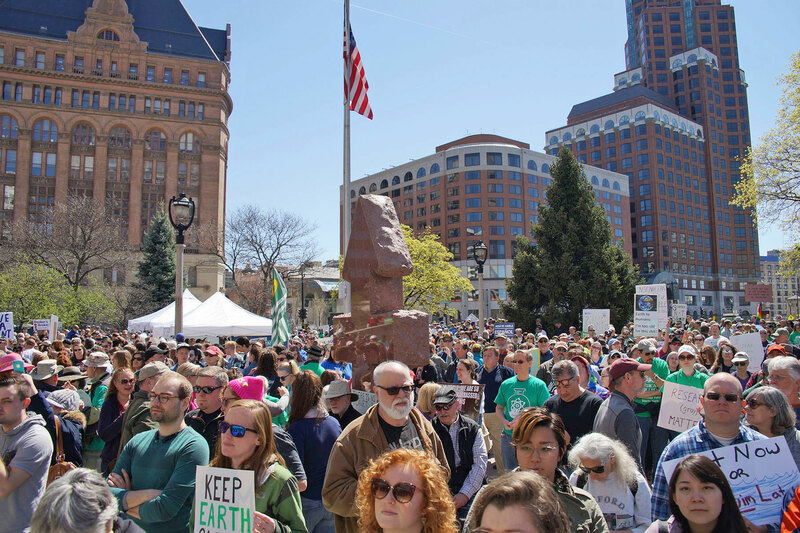 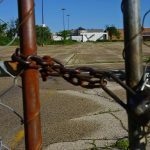 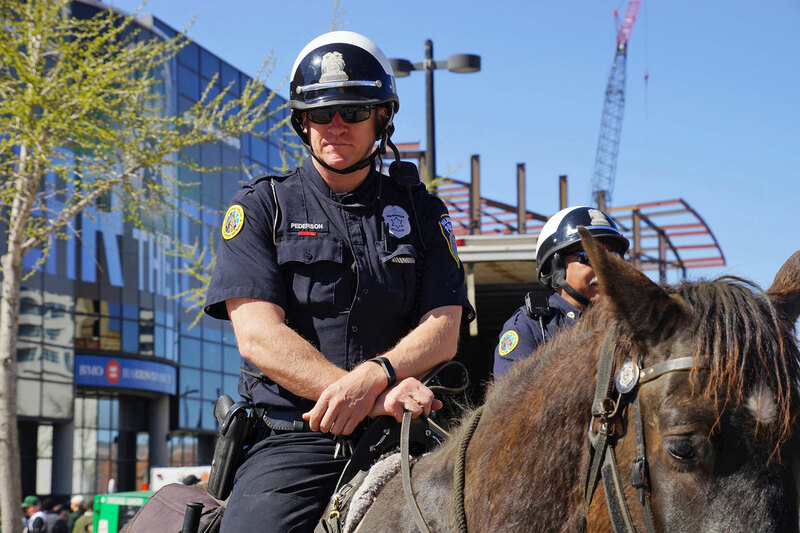 In addition to Milwaukee, Madison and Green Bay, and several Wisconsin cities held events. 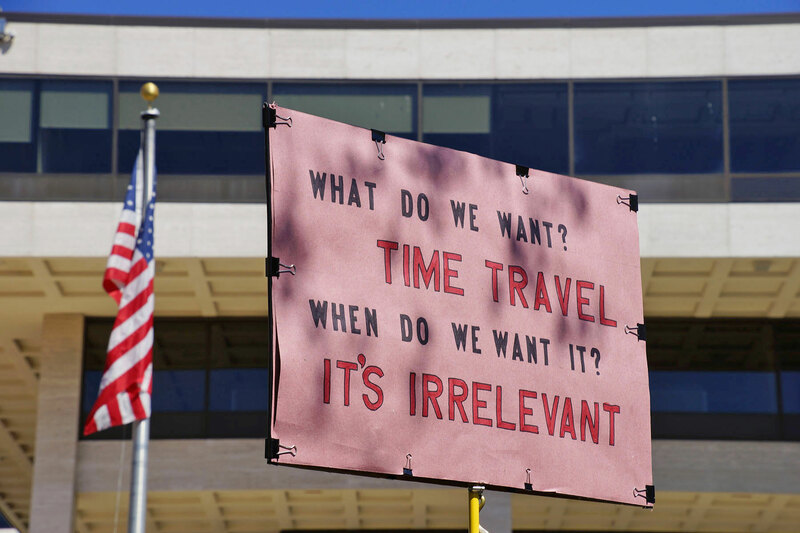 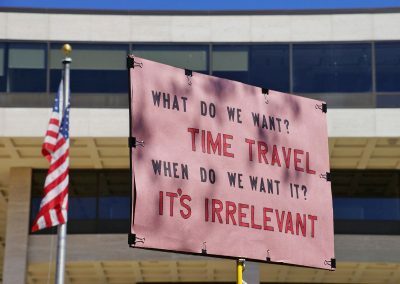 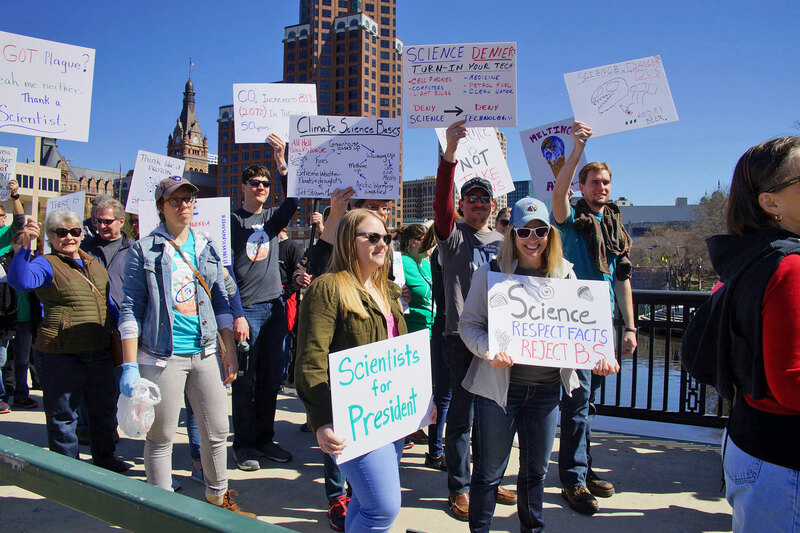 Unlike recent political marches at night in protest of elected officials, the bipartisan rally for Science took place during the day and in defense of an ancient institution. 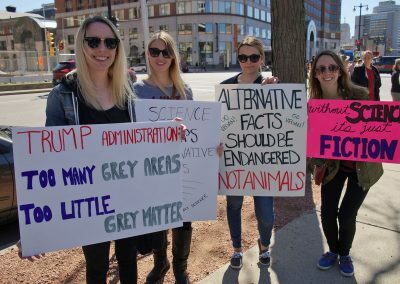 The crowd assembled to support the study of the natural world and quest for knowledge that has been under attack by the current federal administration. The foundations of scientific study date back to antiquity and ancient Greece. 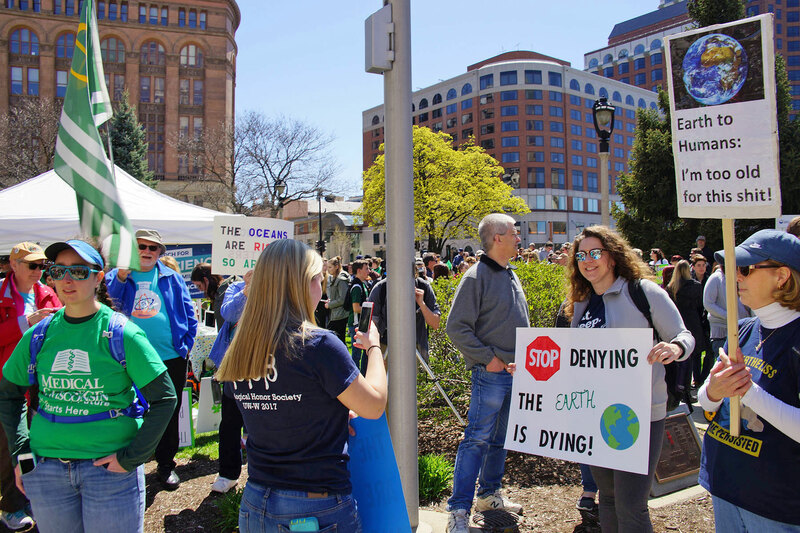 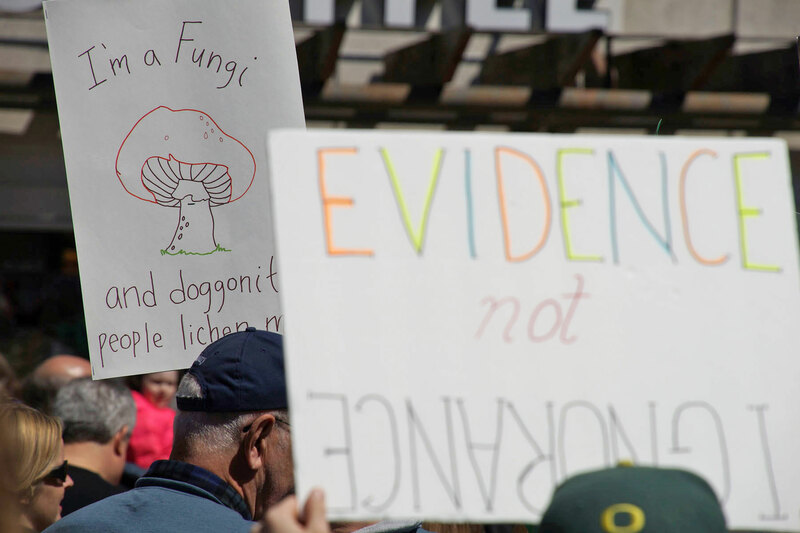 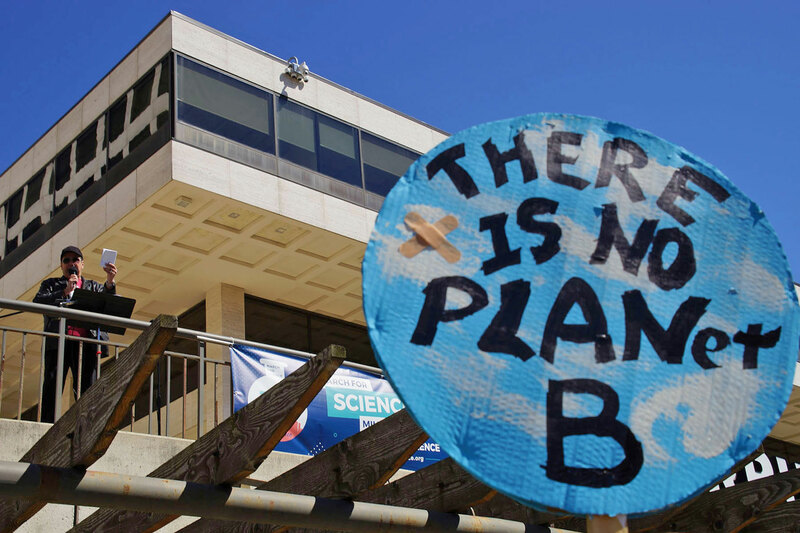 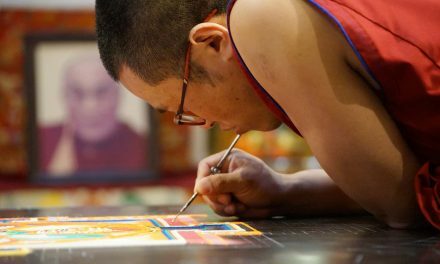 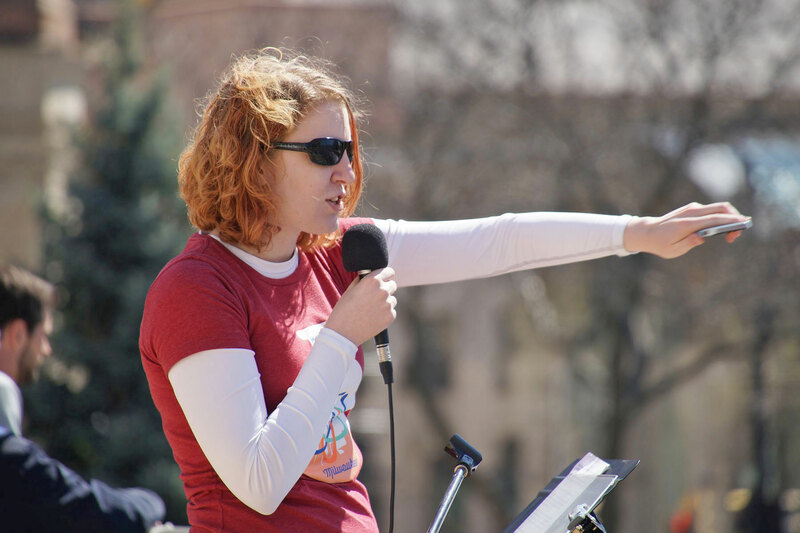 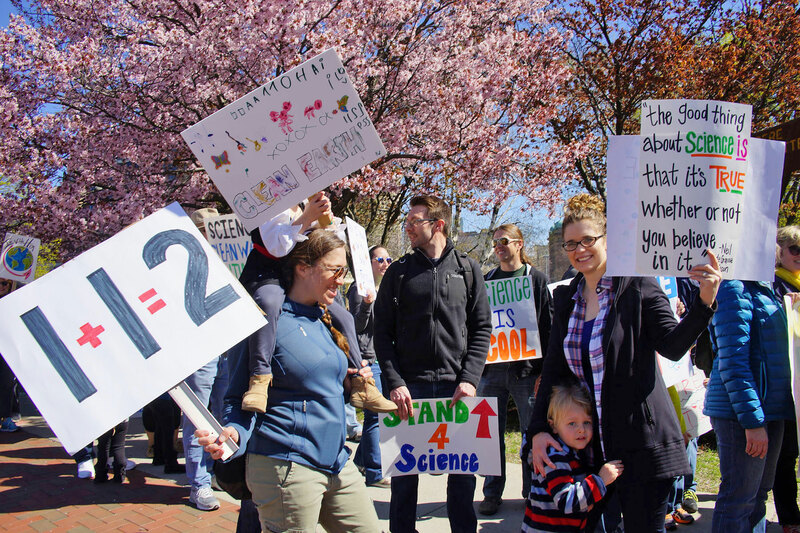 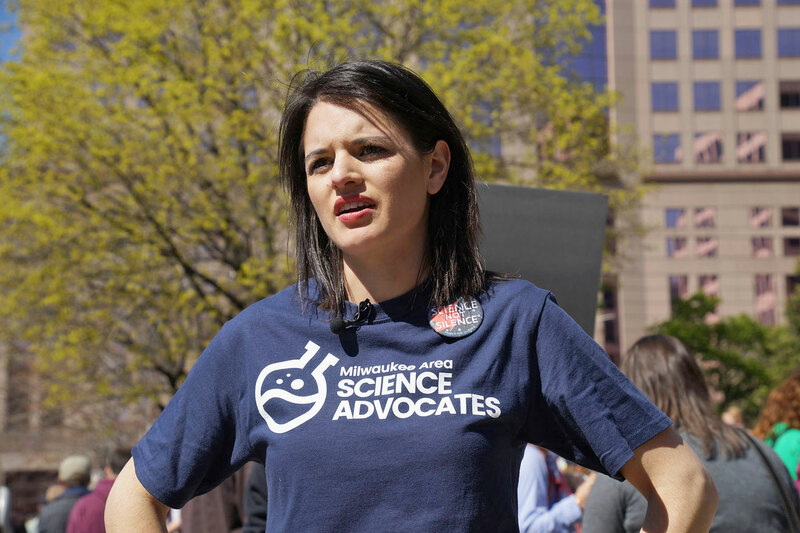 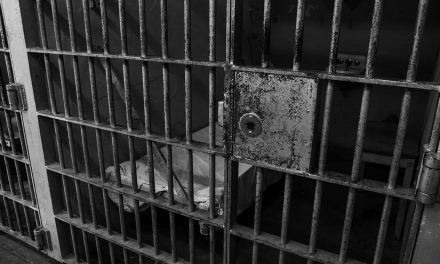 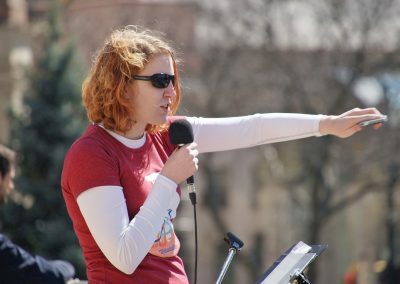 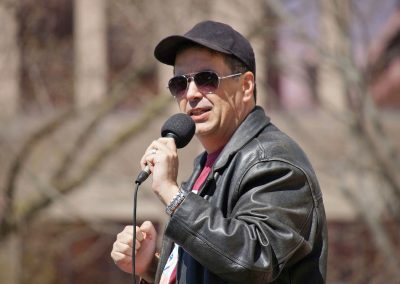 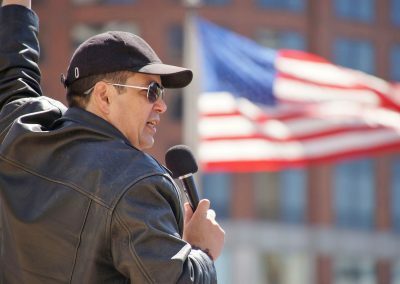 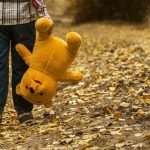 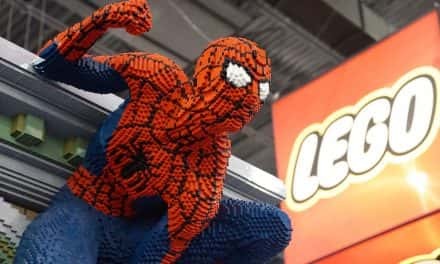 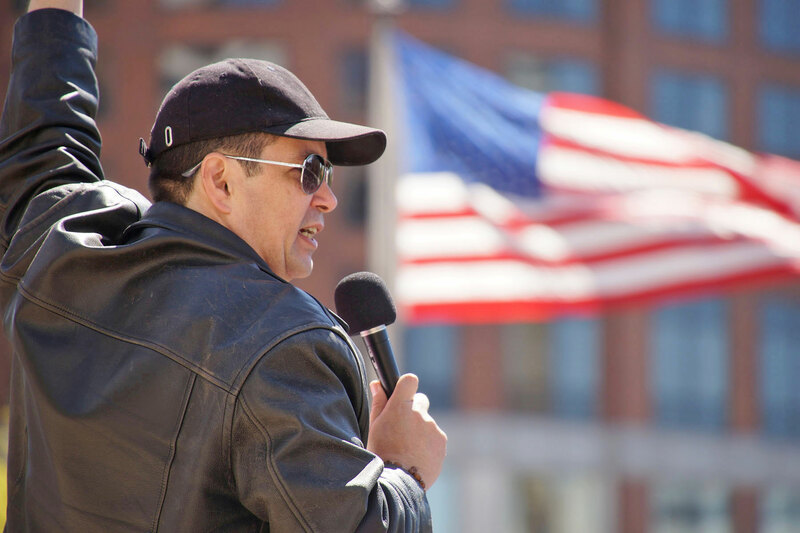 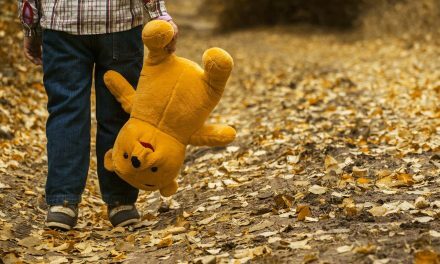 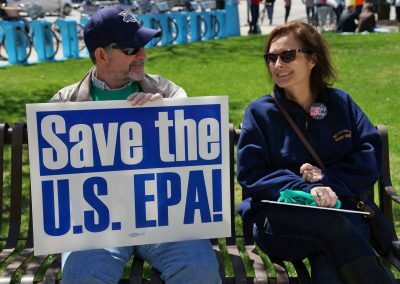 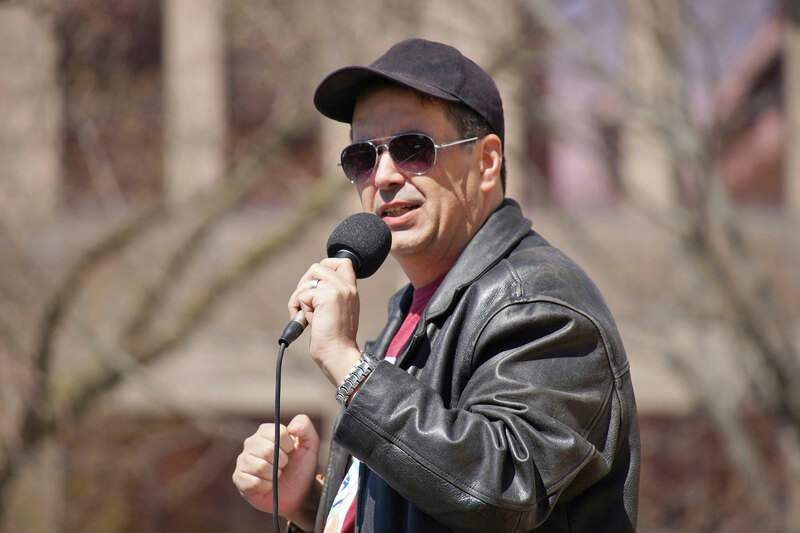 The messages of speakers and demonstrators were aimed at decision makers in government, in an effort to stem the trend that has sought to deny science as a matter of policy decisions. 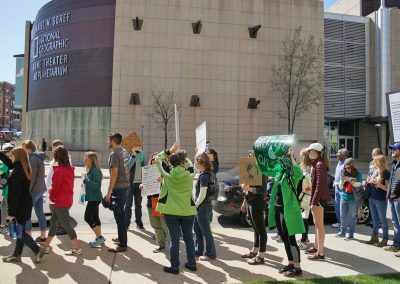 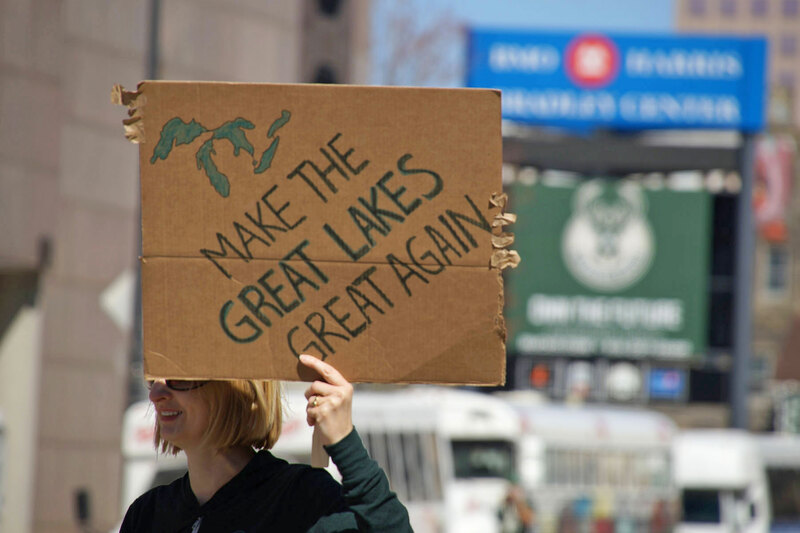 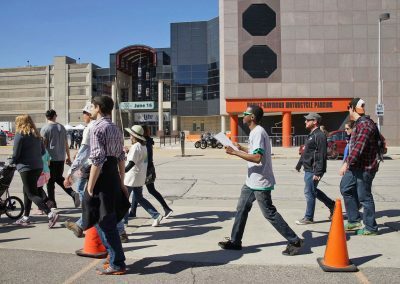 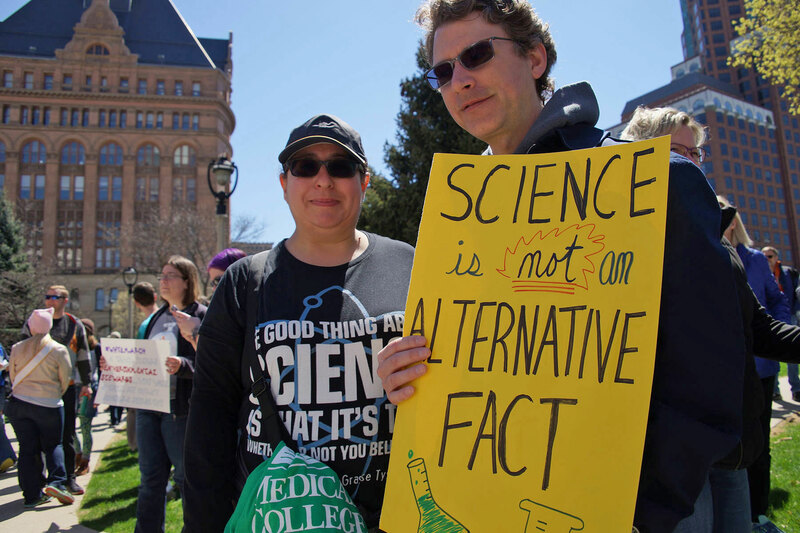 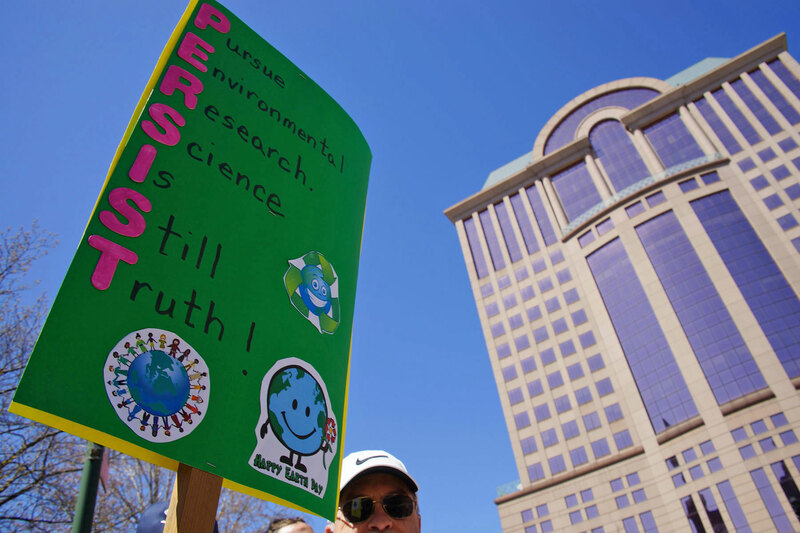 The Earth Day March for Science also happened to correspond with game four of the Milwaukee Bucks playoffs against the Toronto Raptors. 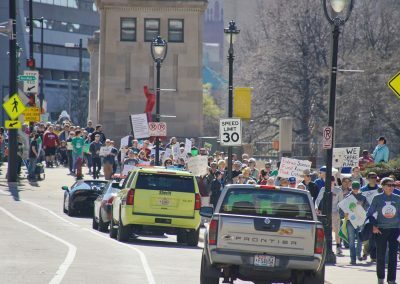 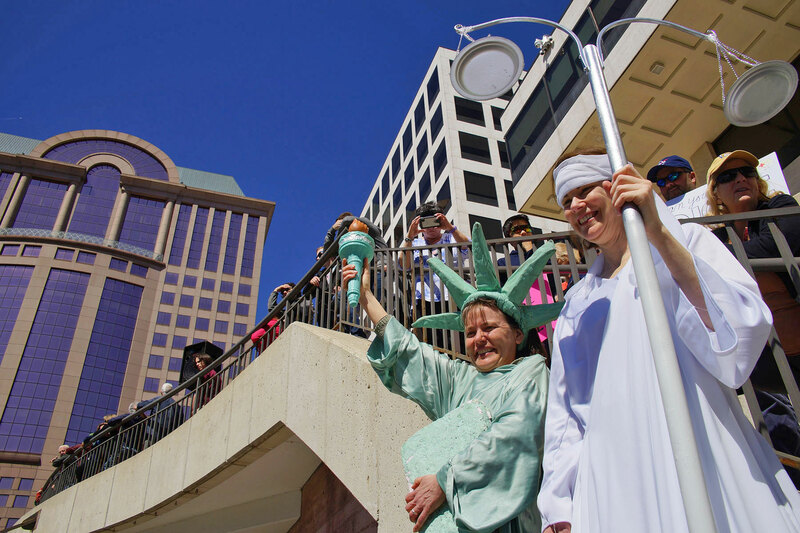 City streets were not closed, and supporters walked on sidewalks to comply with traffic regulations. 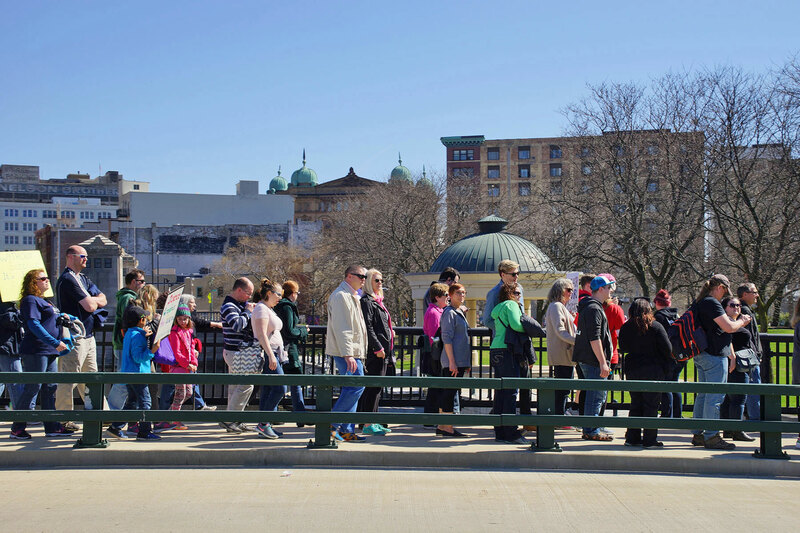 As a result, the line of supporters stretched nearly the entire length of the mile an a half route as groups waited for crosswalk lights. 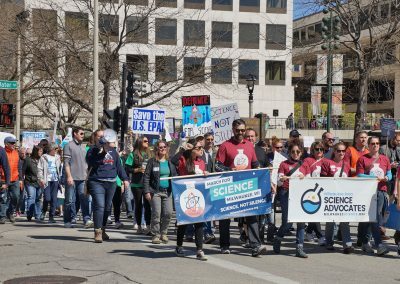 Some marchers were just beginning as others finished, in a show of solidarity for science. 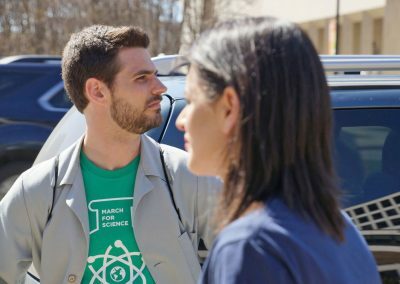 As a small group participants walked past a Lamborghini parked along the Peck Pavilion at the Marcus Center, they pointed to the $200,000 vehicle as an example of science on display, particularly Italian science. 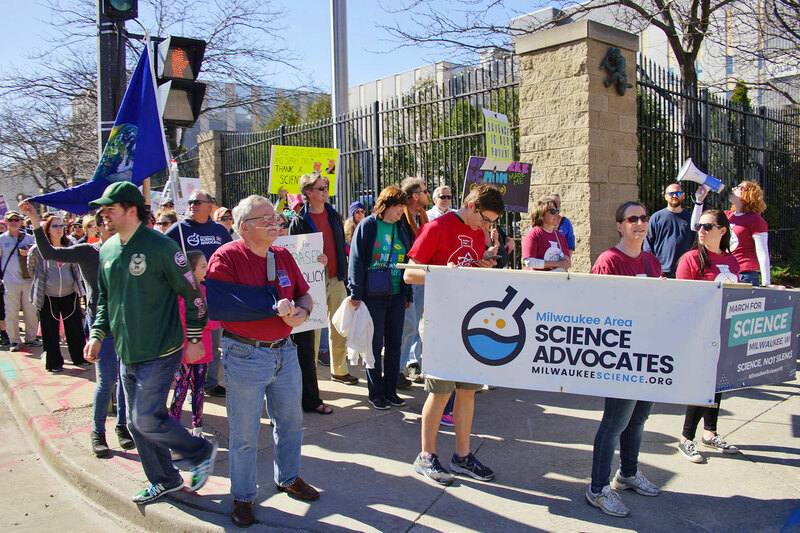 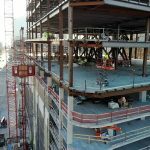 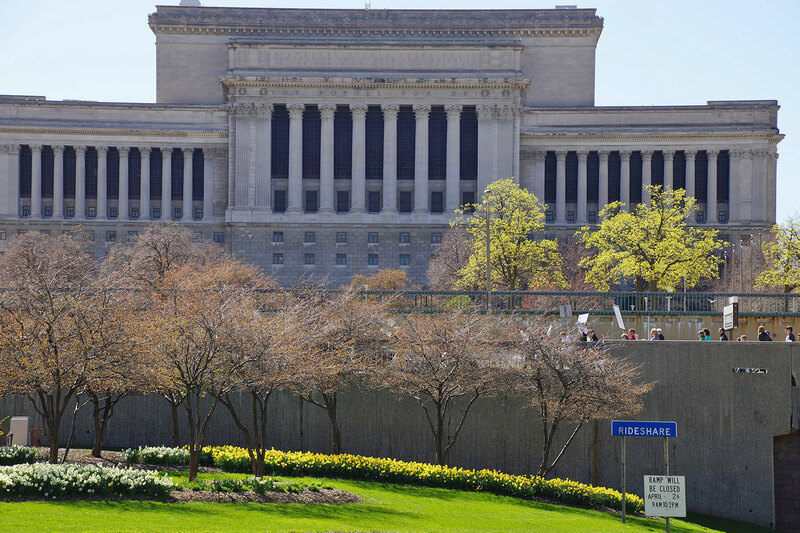 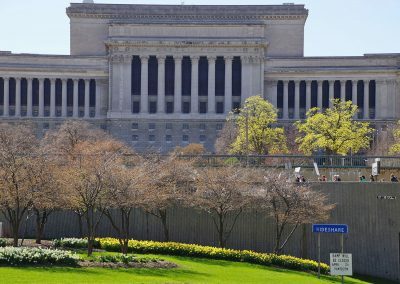 Organized by the Milwaukee Area Science Advocates (MASA) the nonprofit was formed to champion science as a pillar of freedom and prosperity. 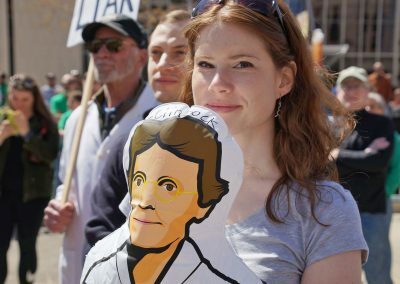 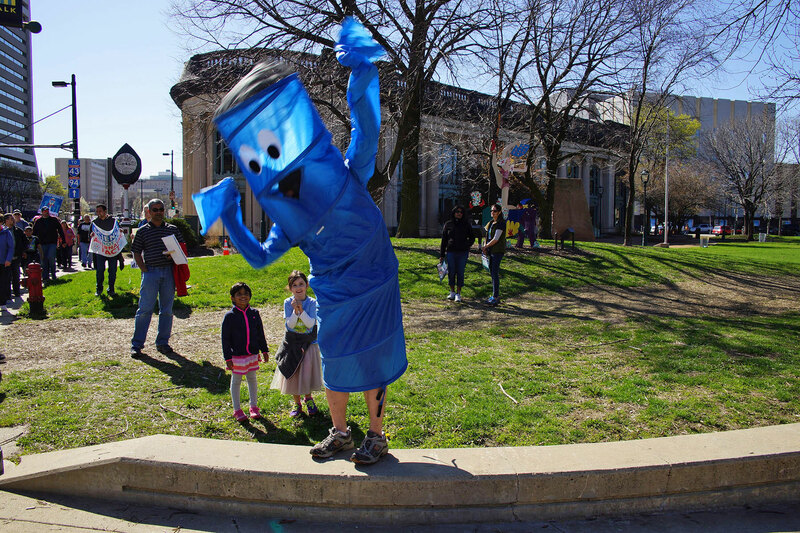 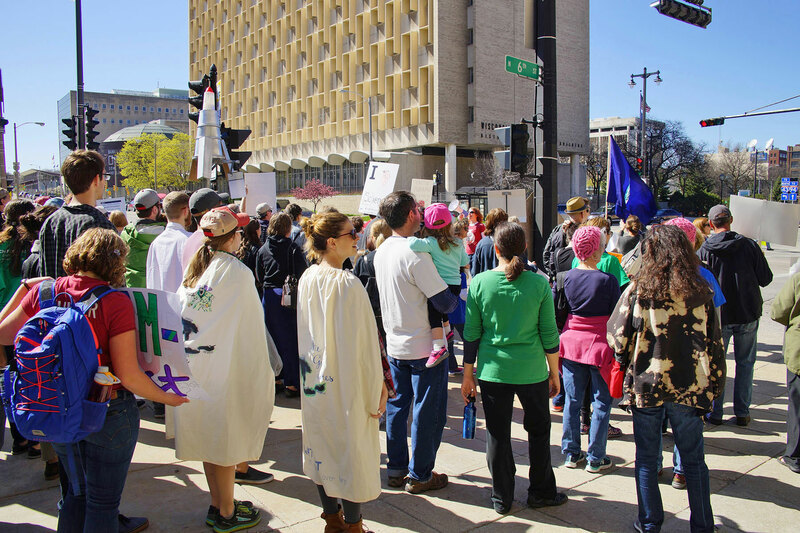 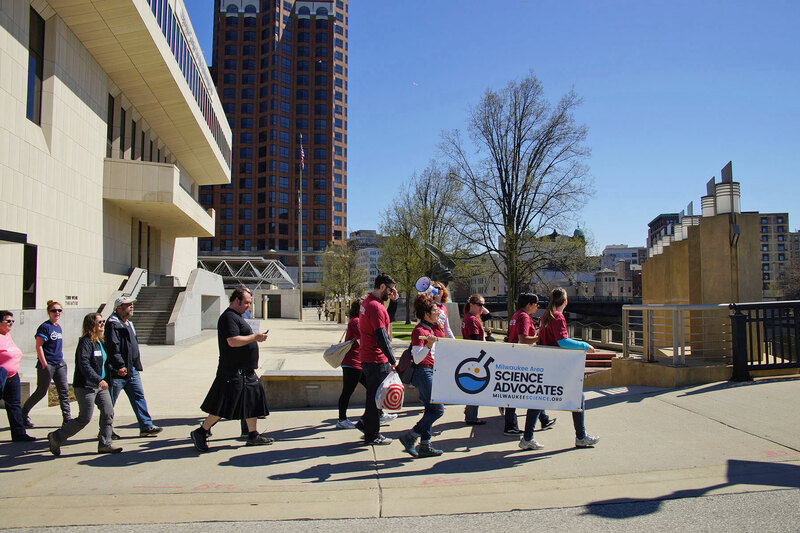 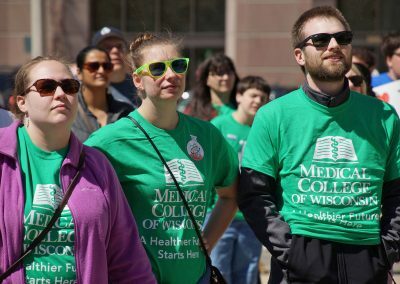 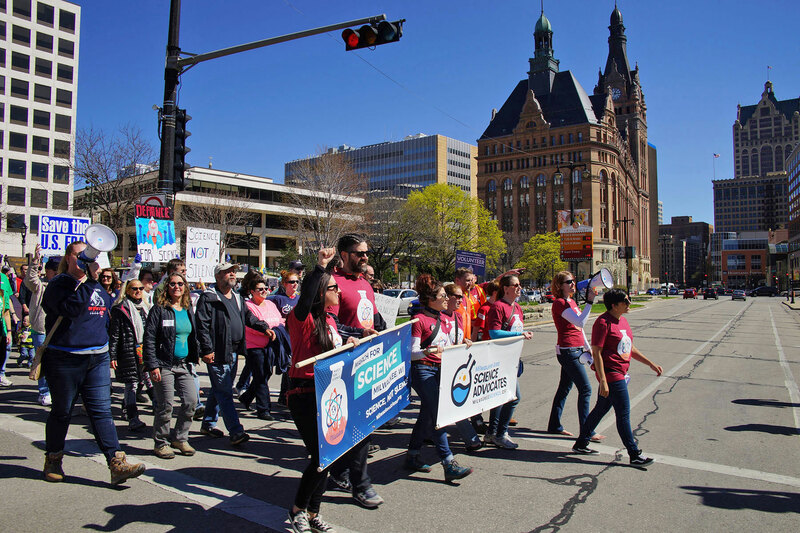 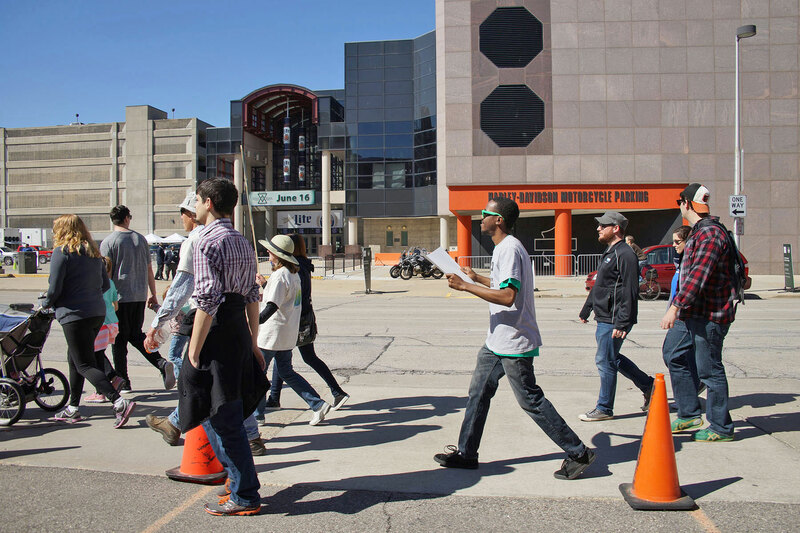 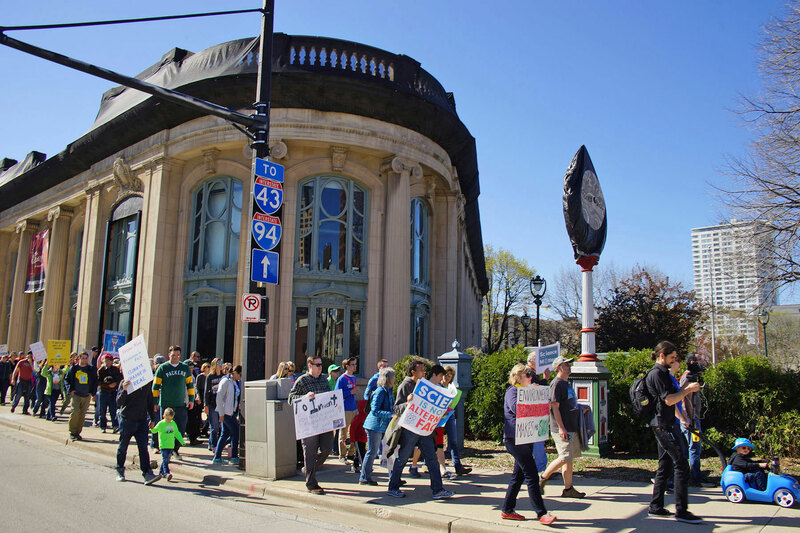 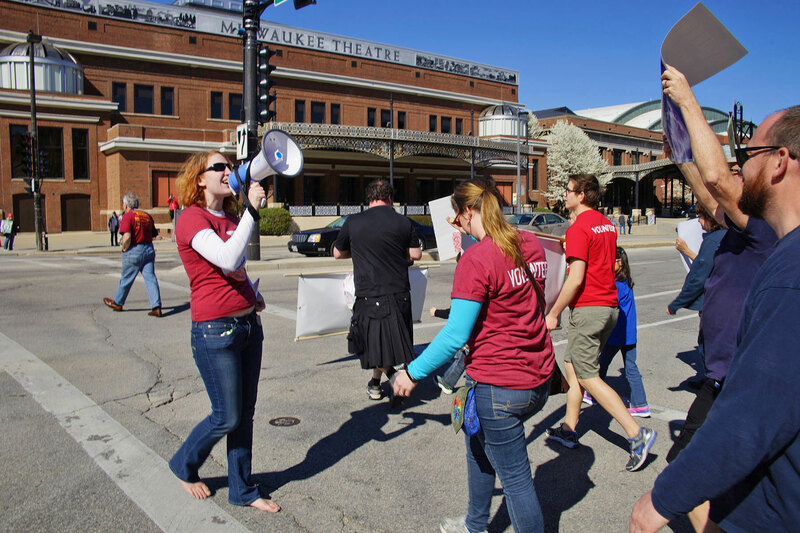 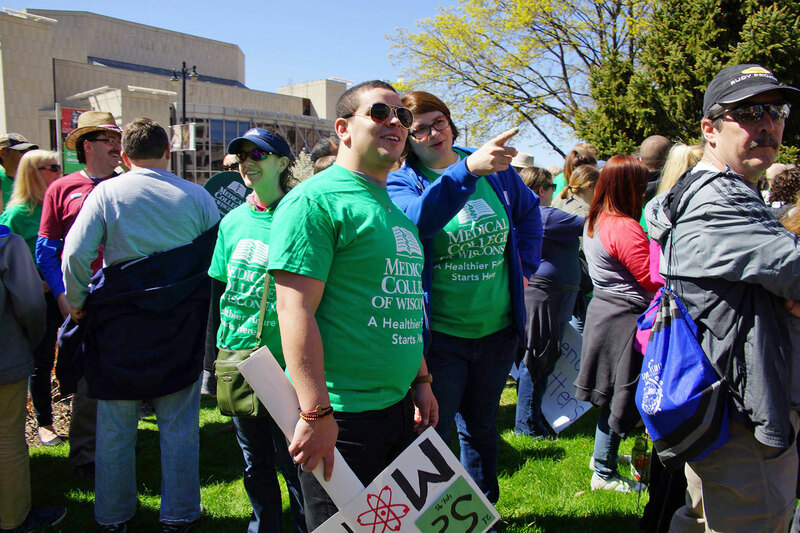 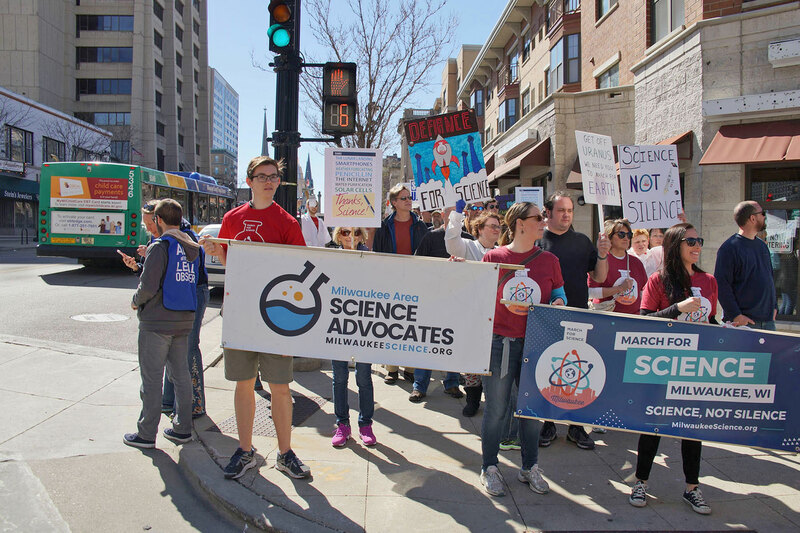 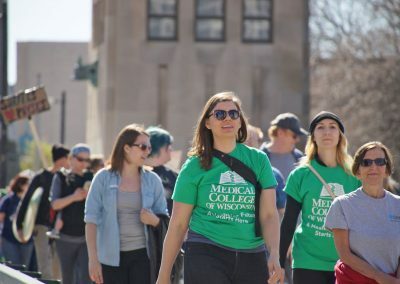 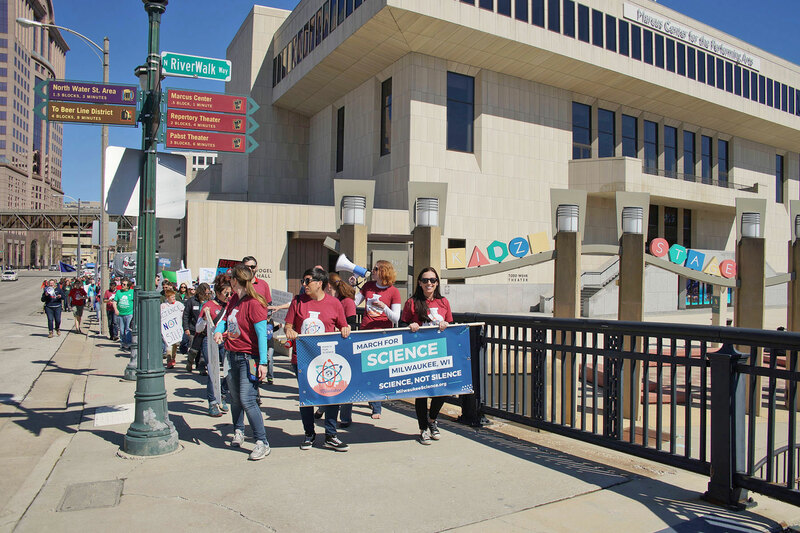 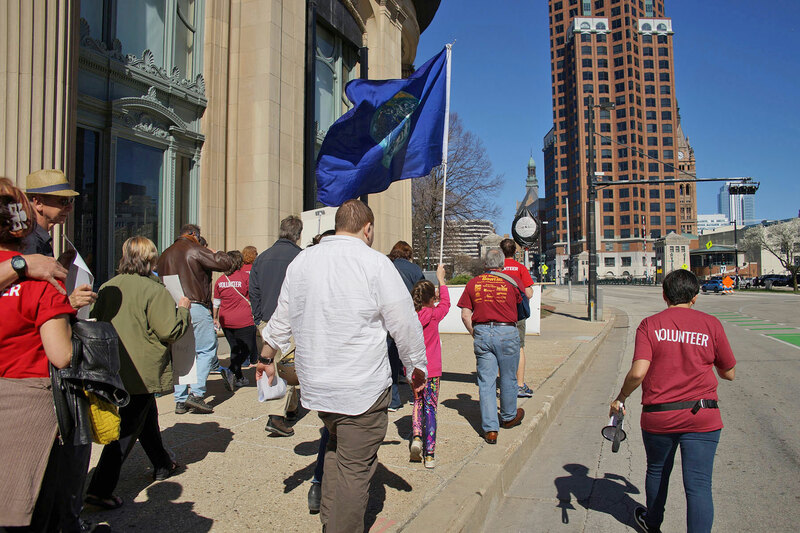 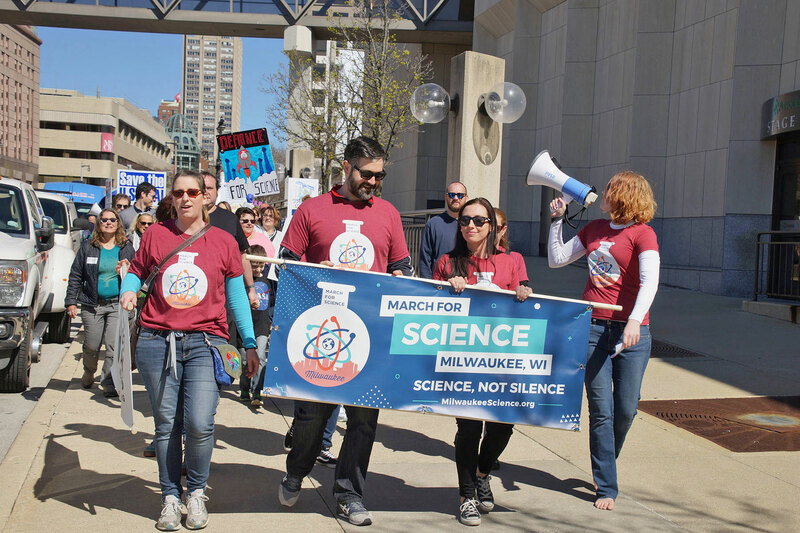 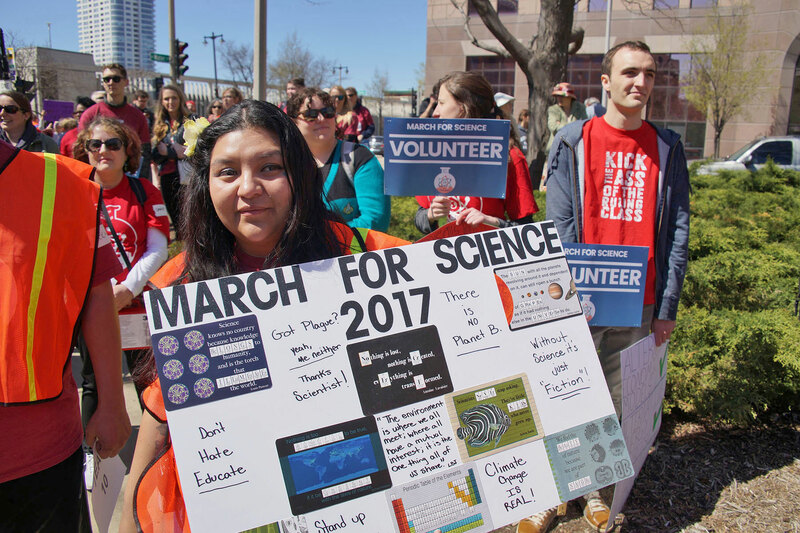 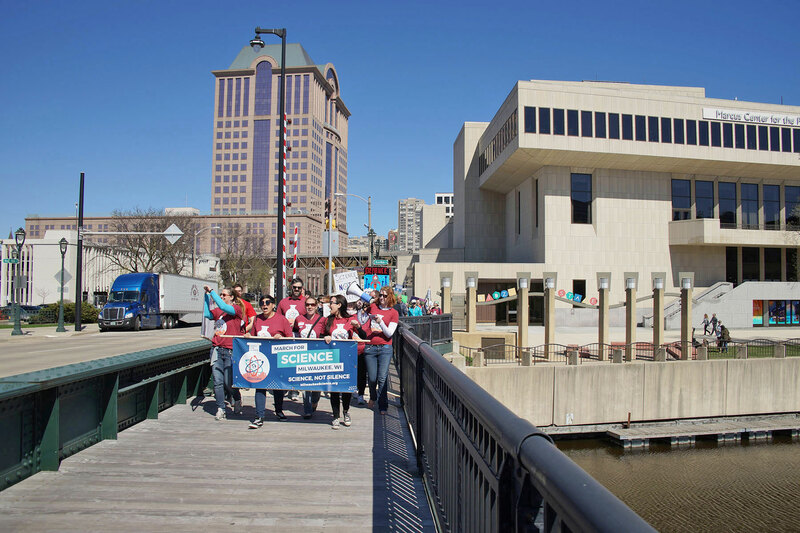 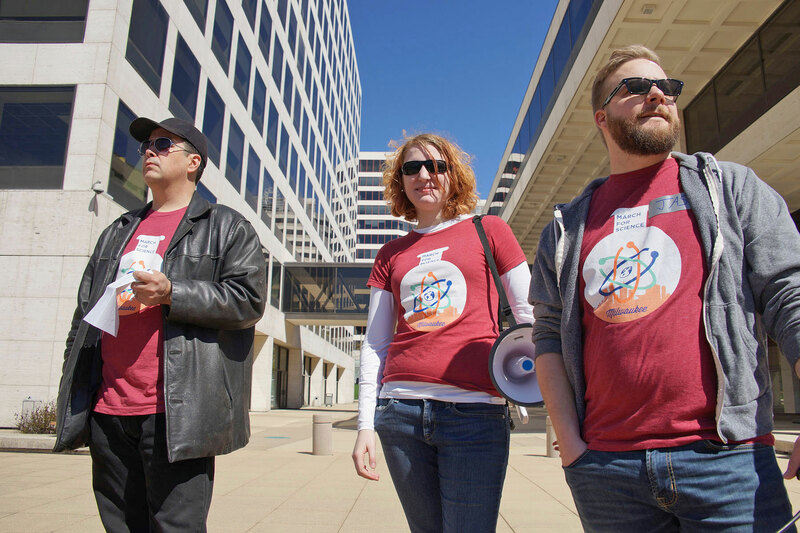 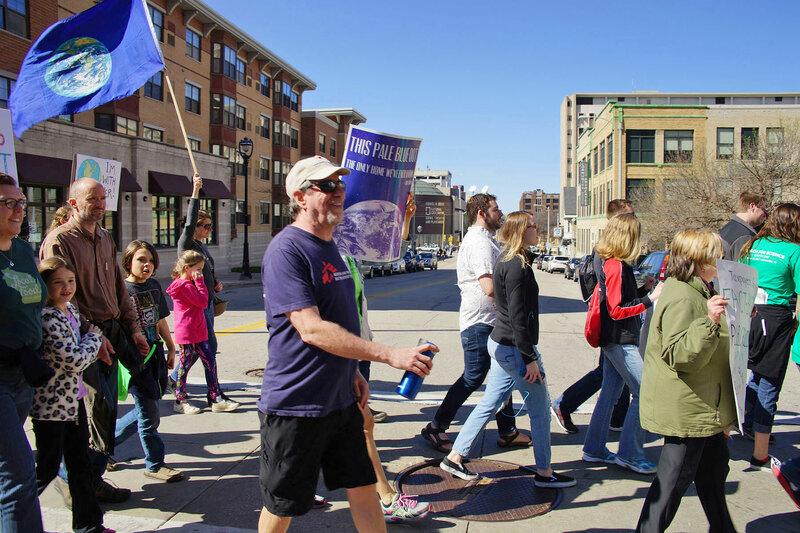 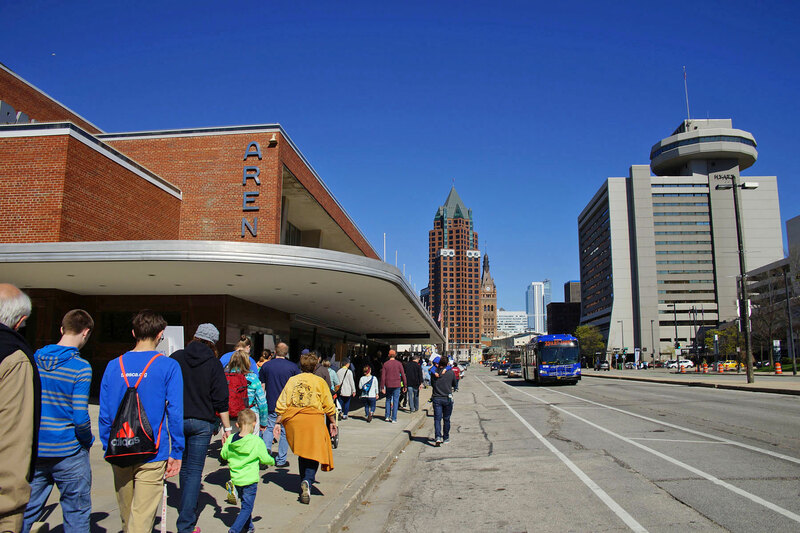 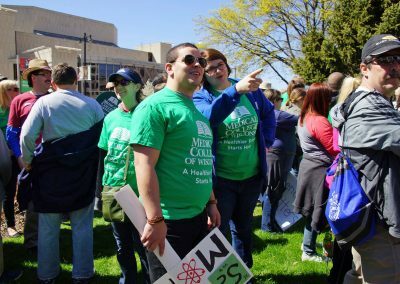 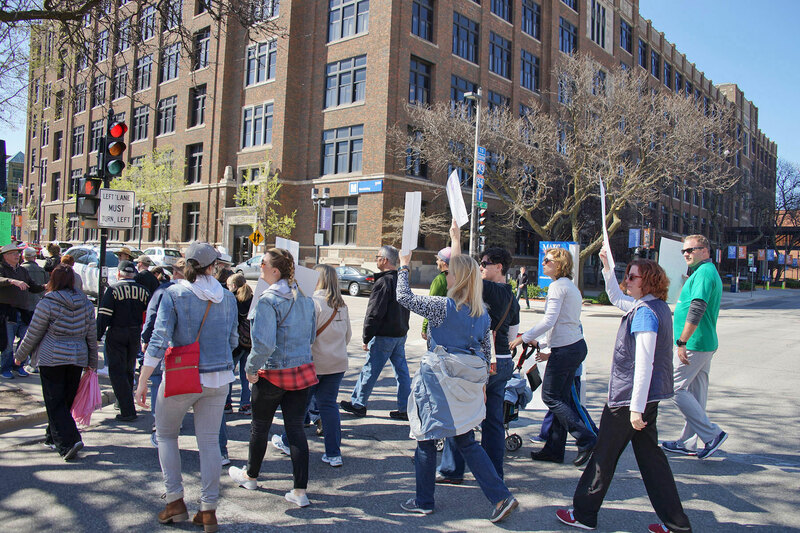 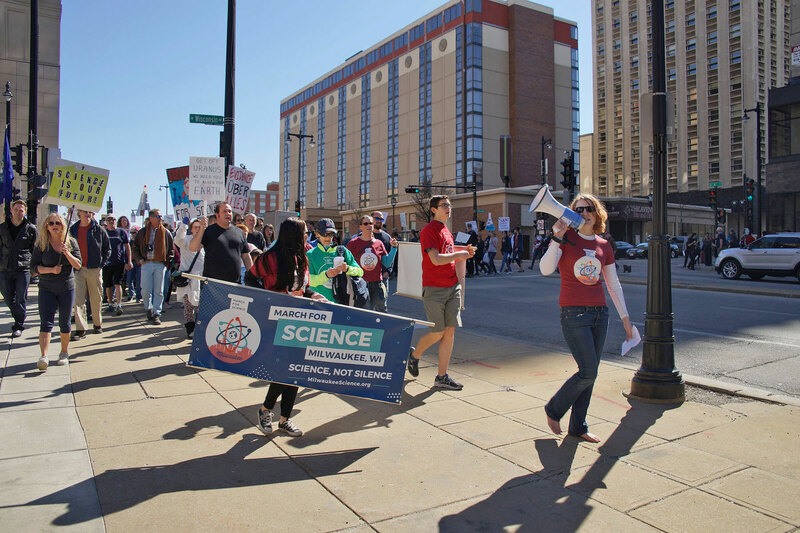 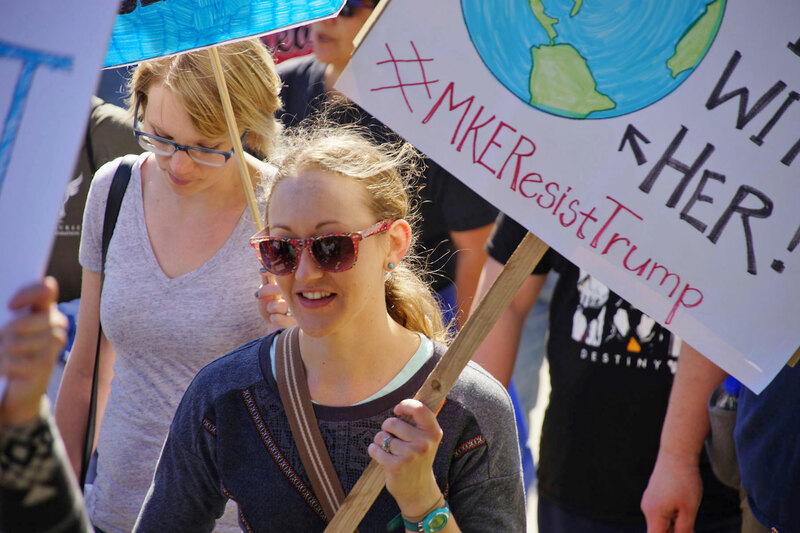 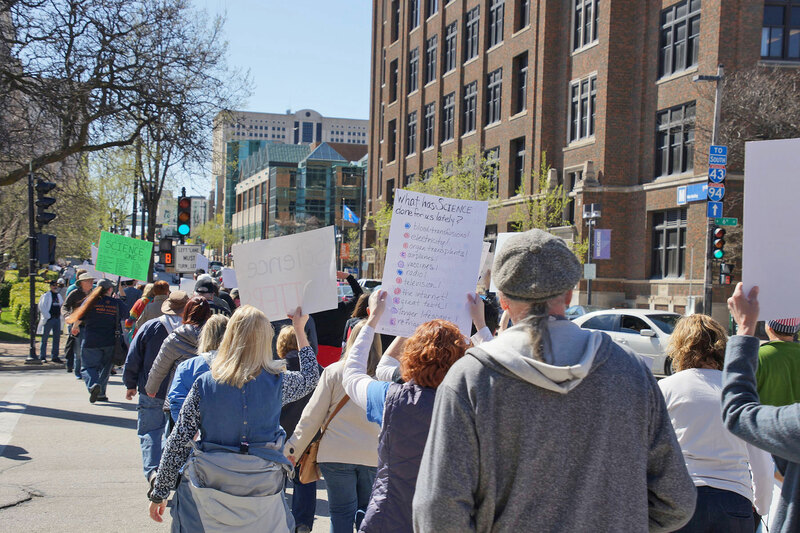 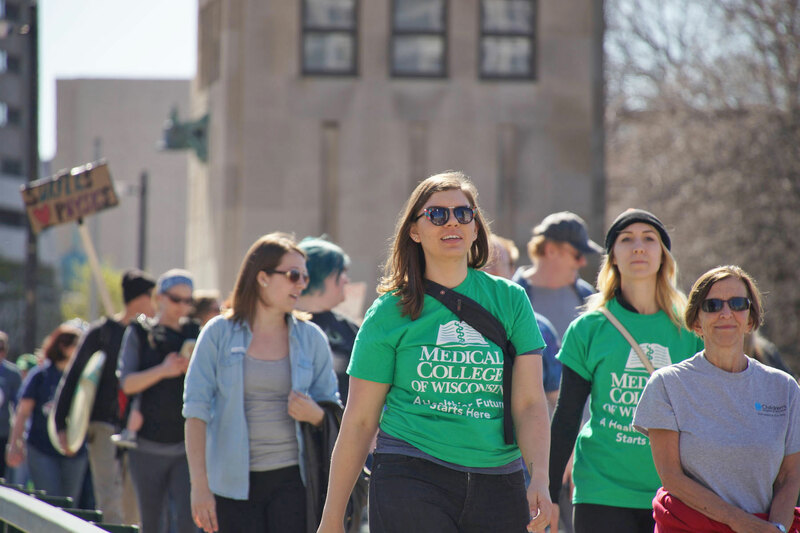 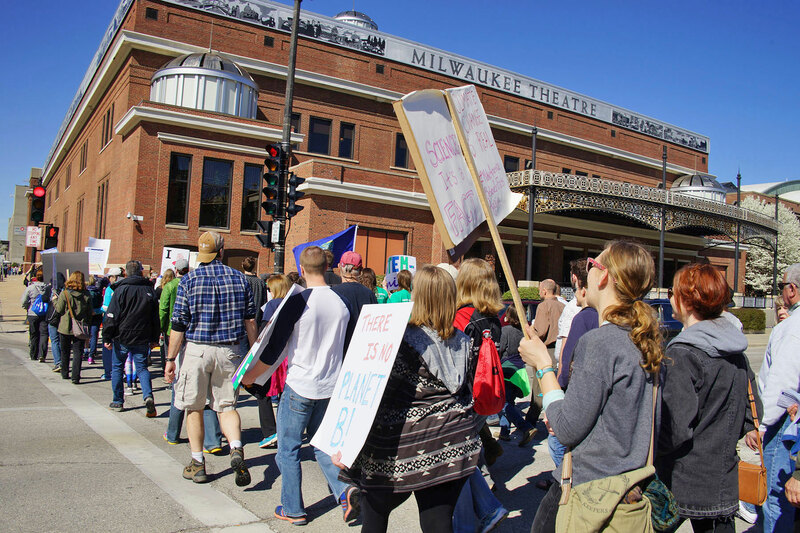 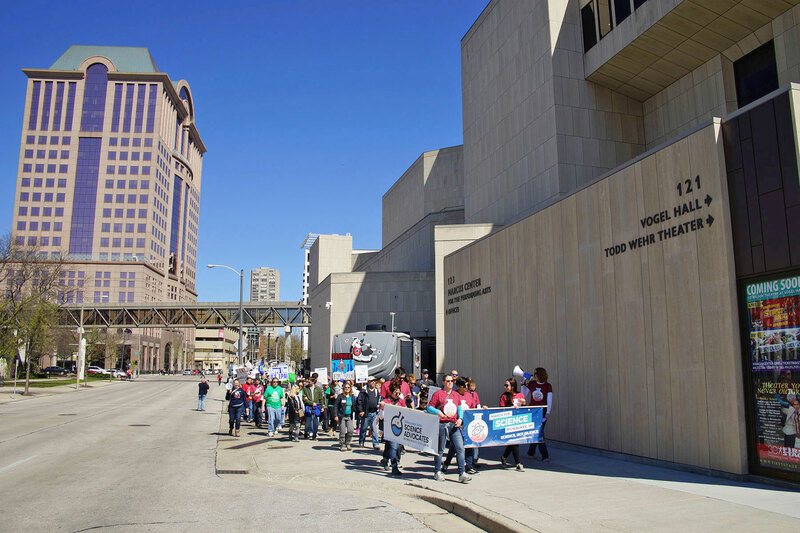 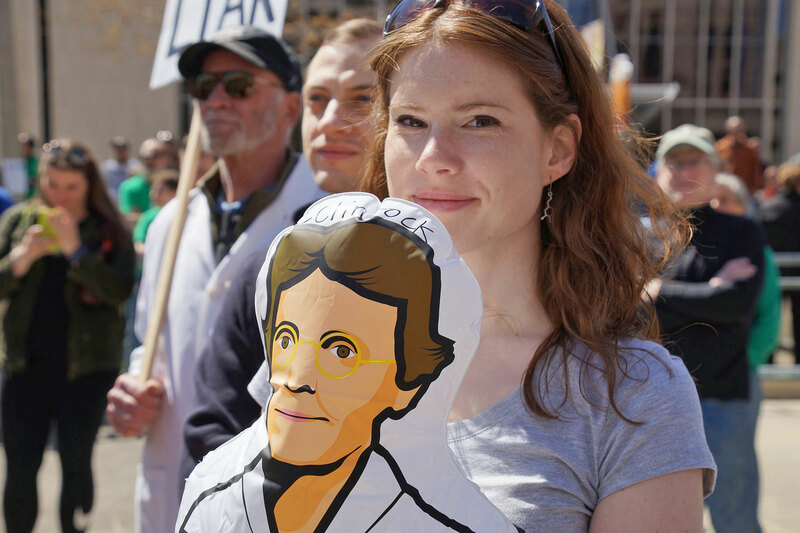 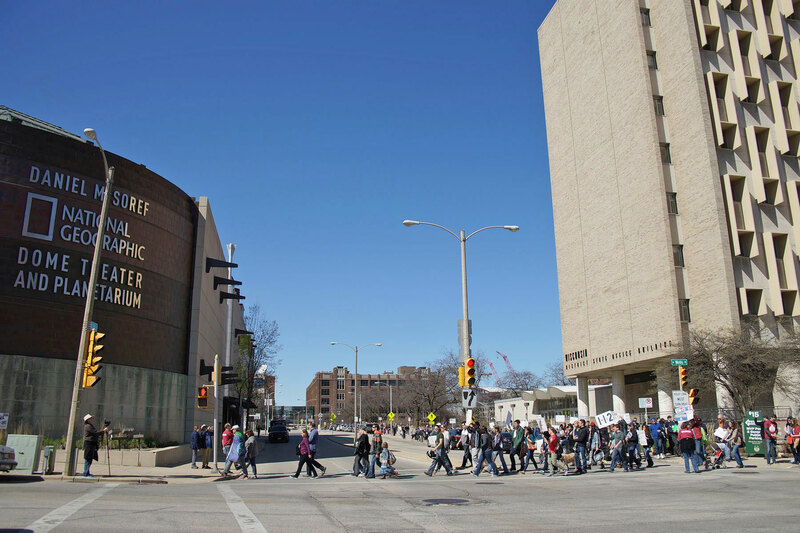 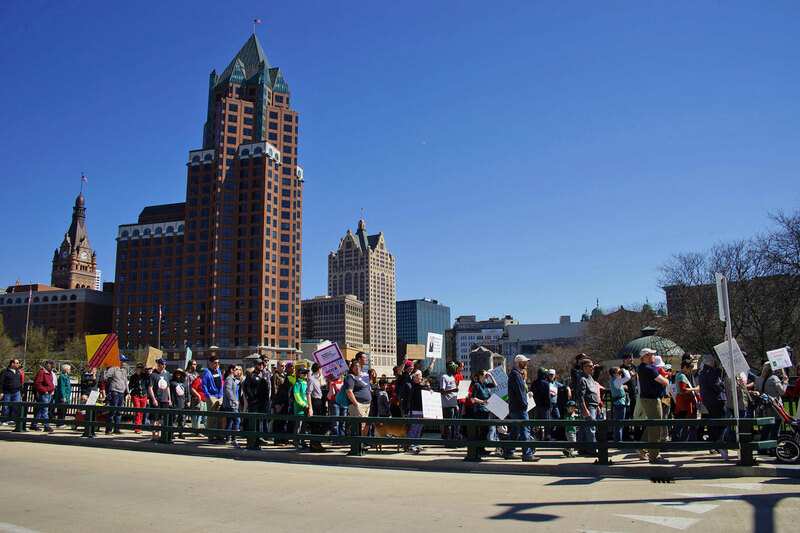 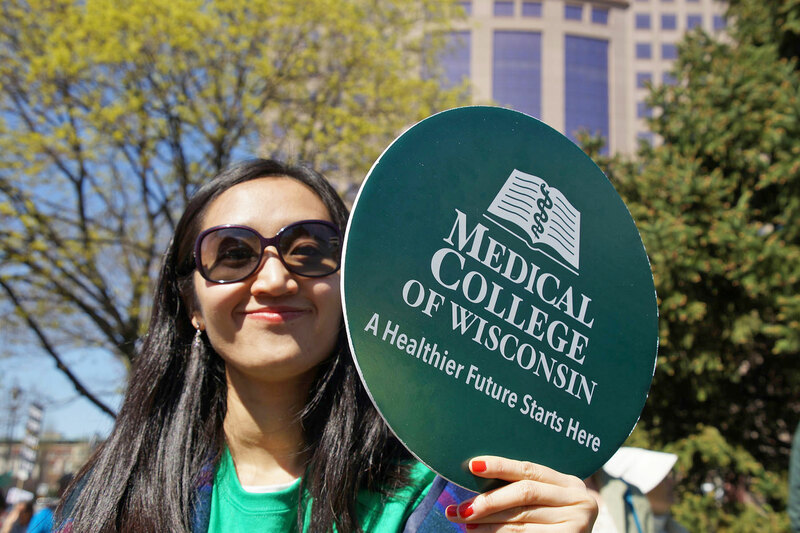 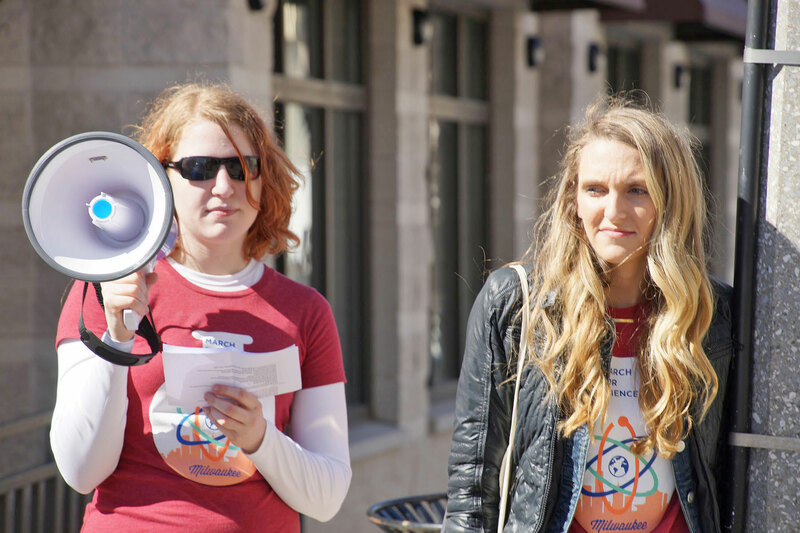 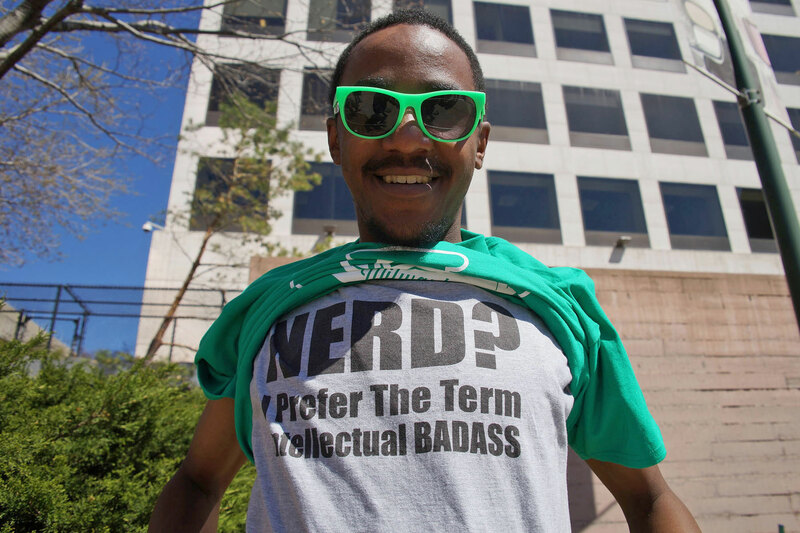 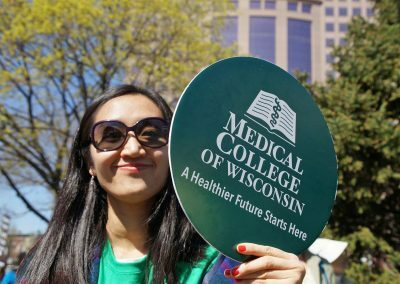 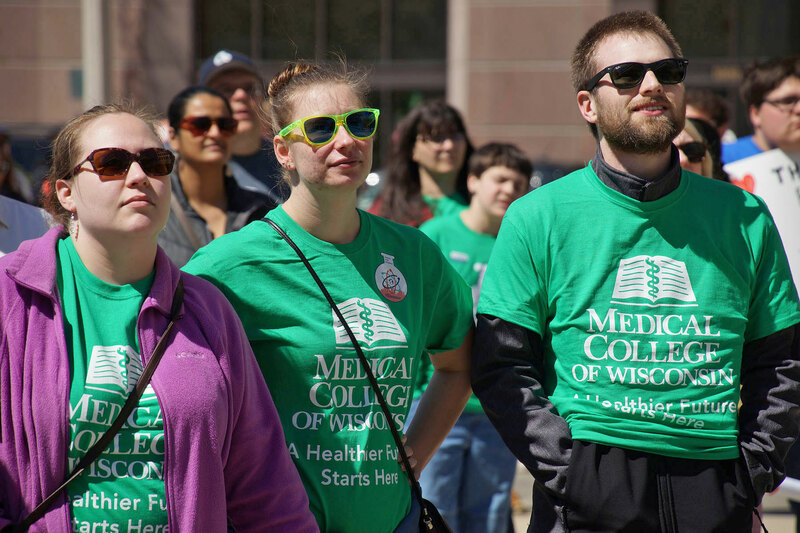 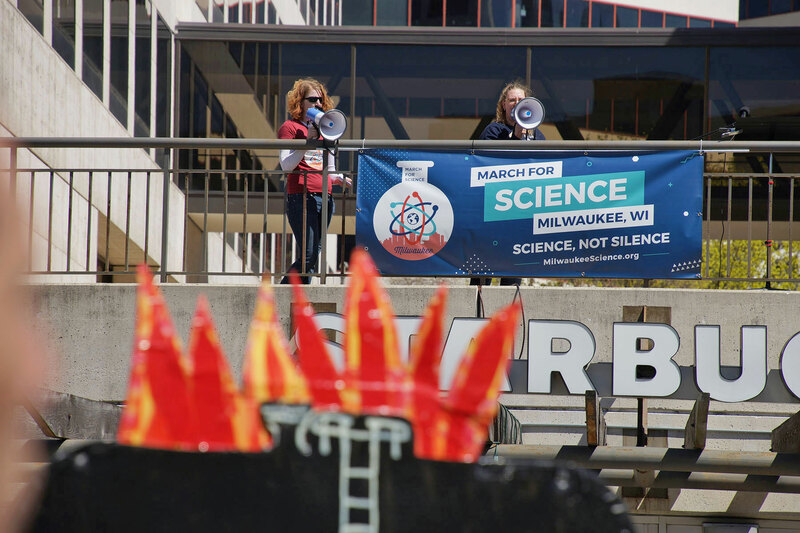 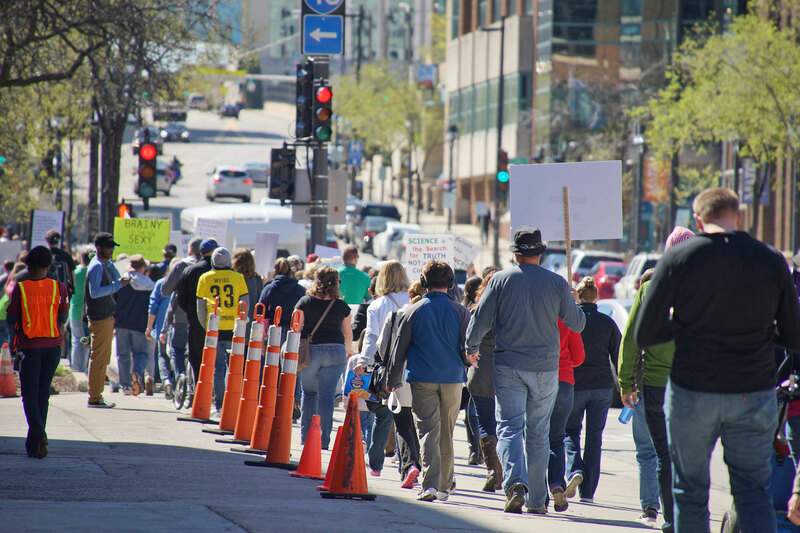 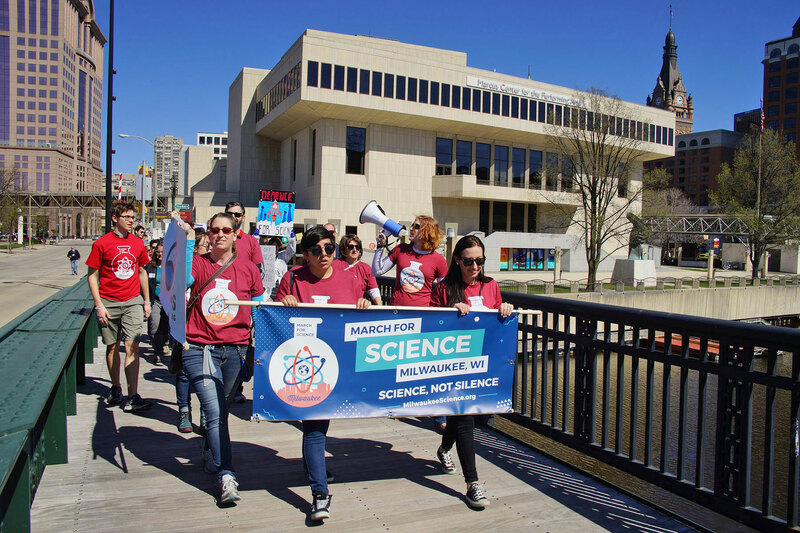 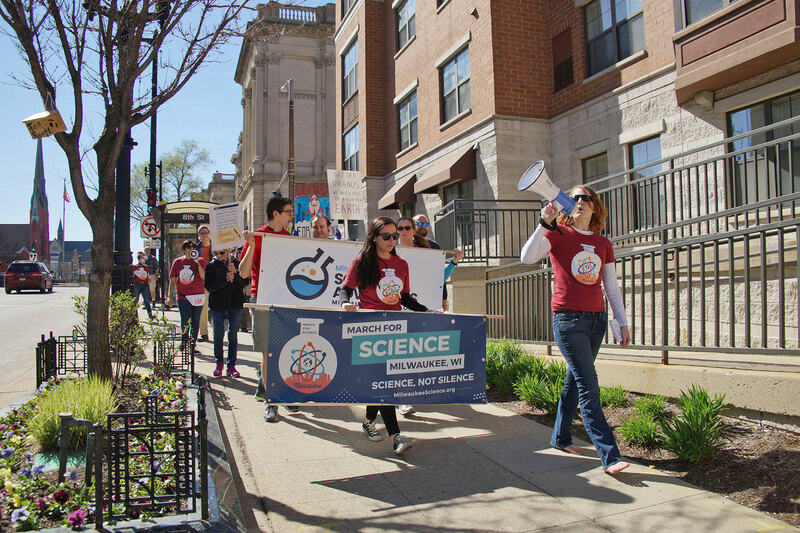 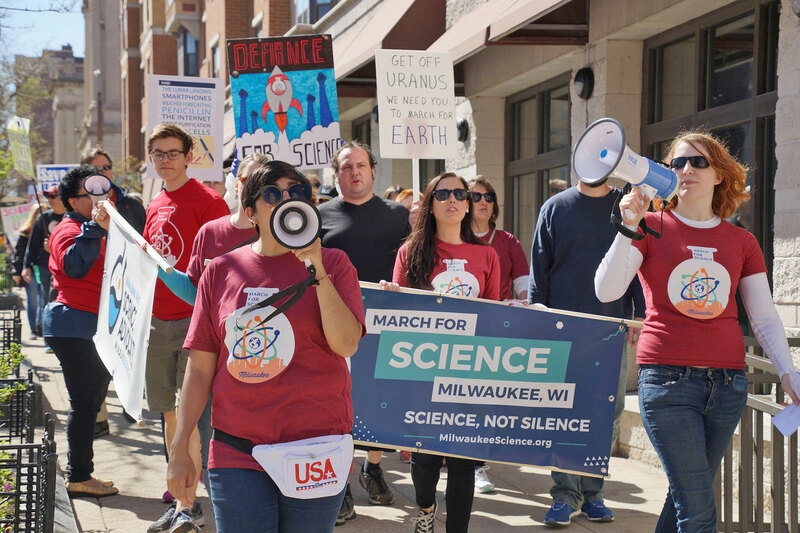 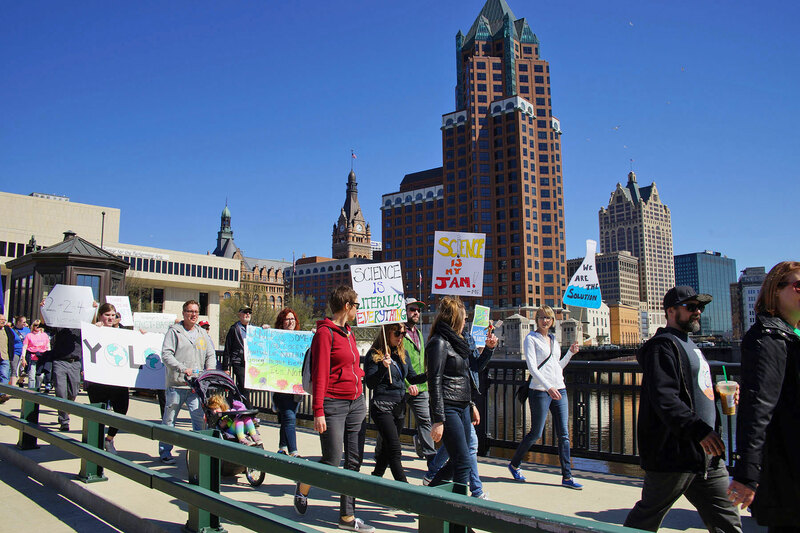 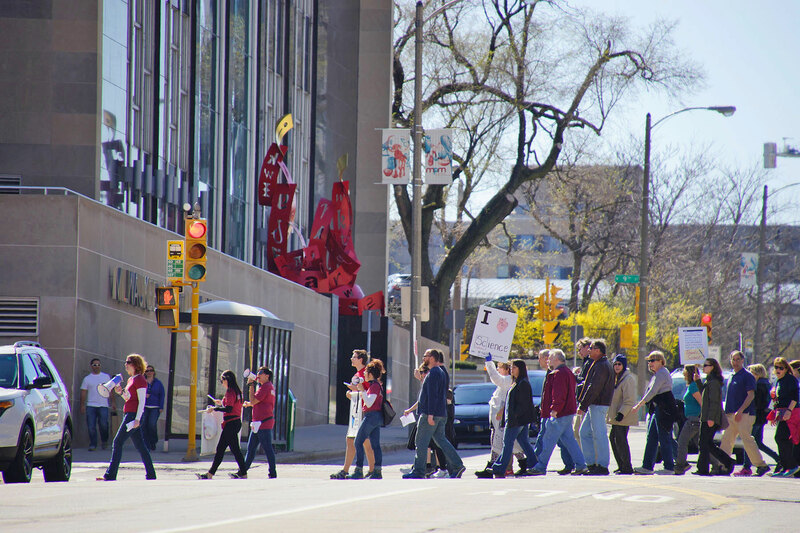 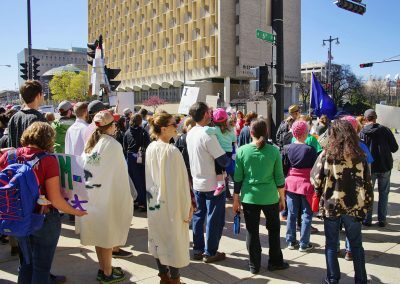 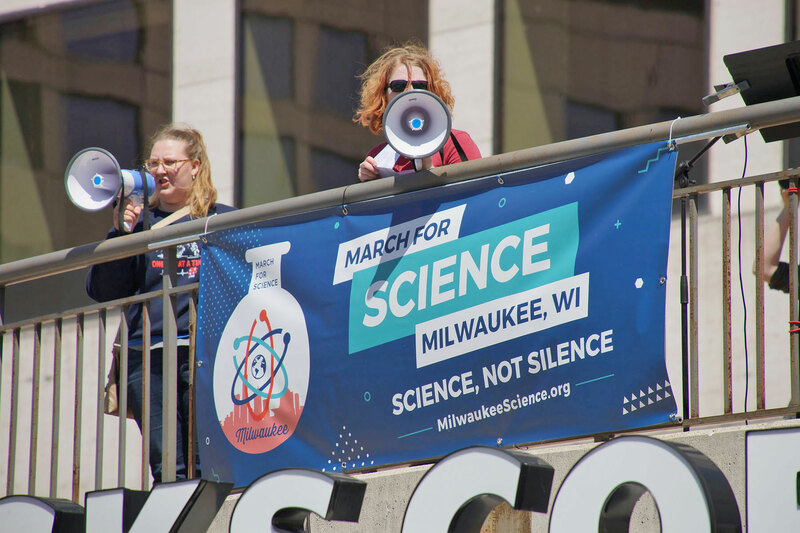 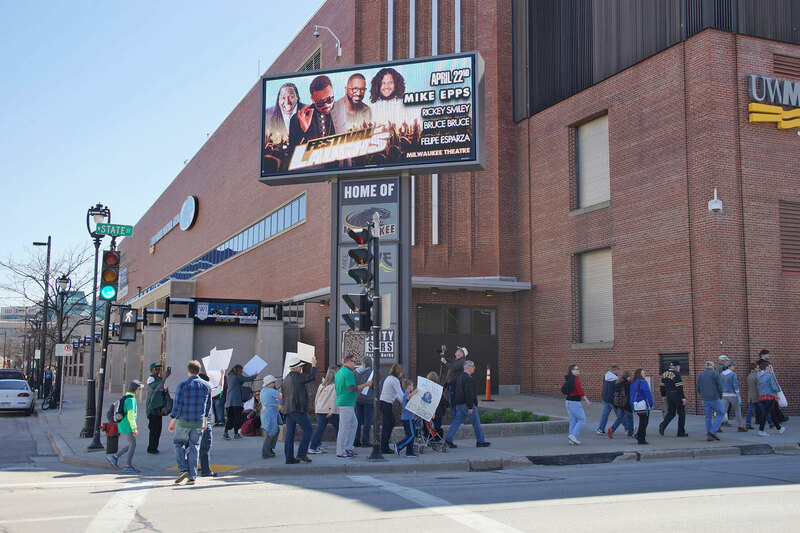 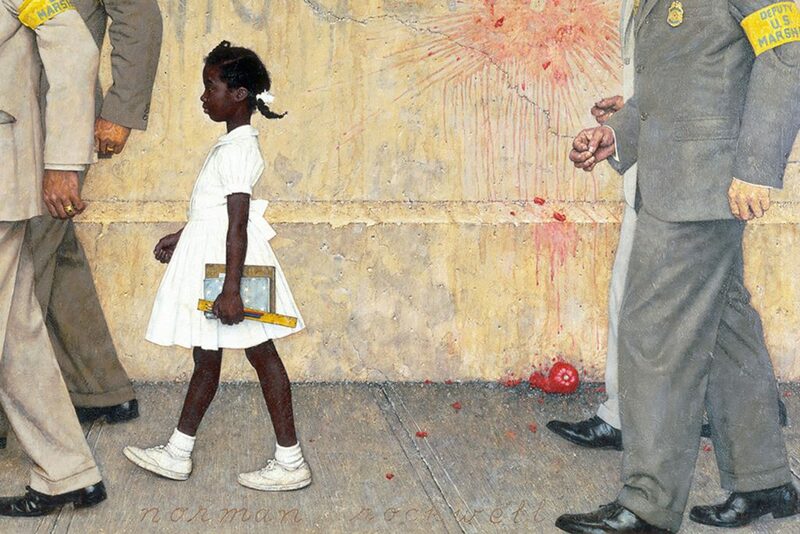 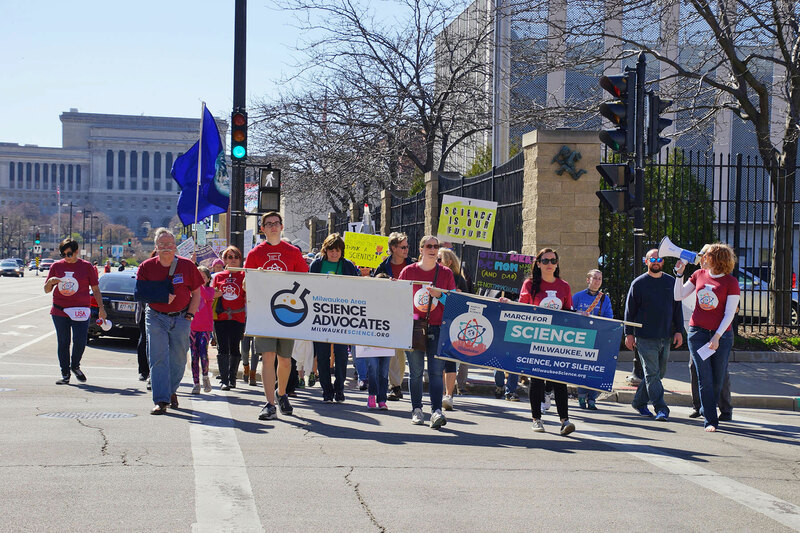 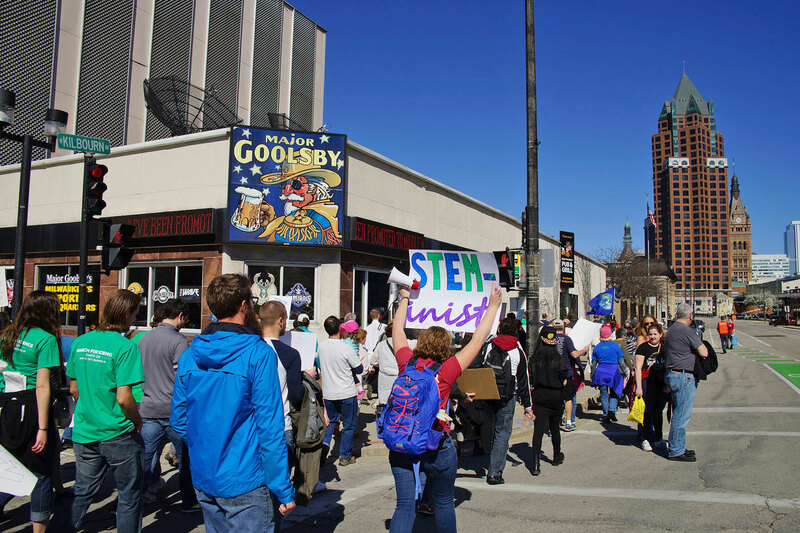 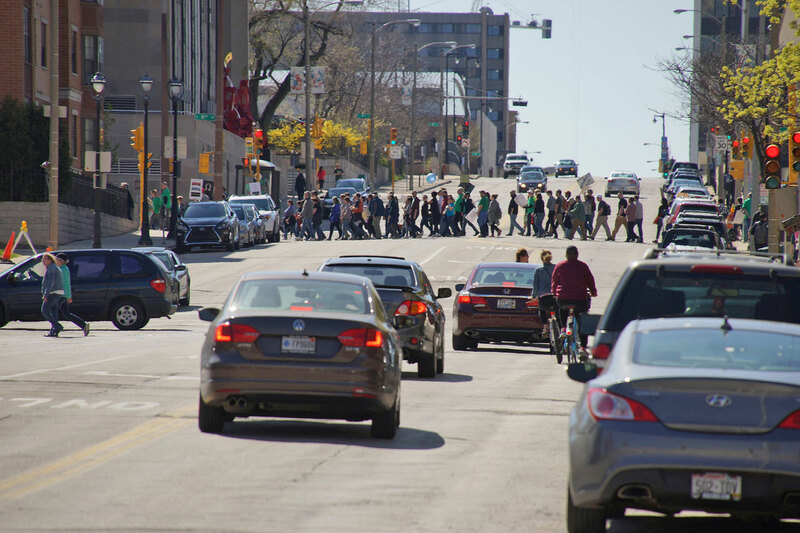 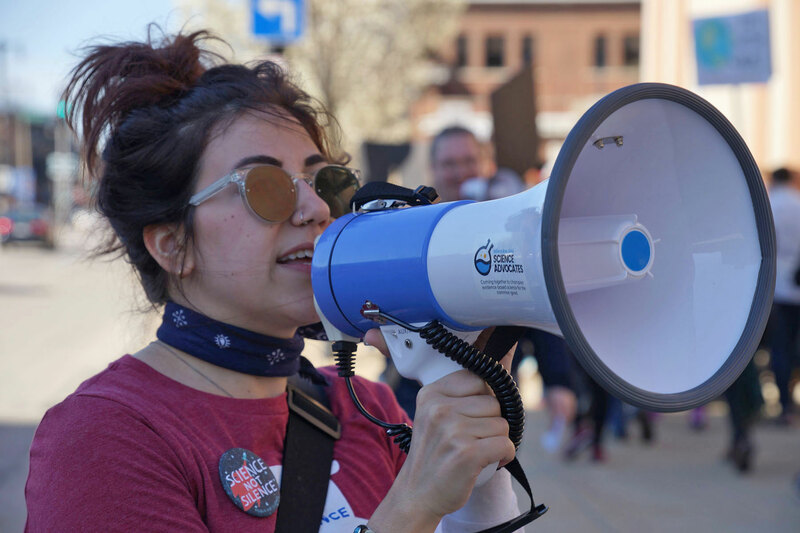 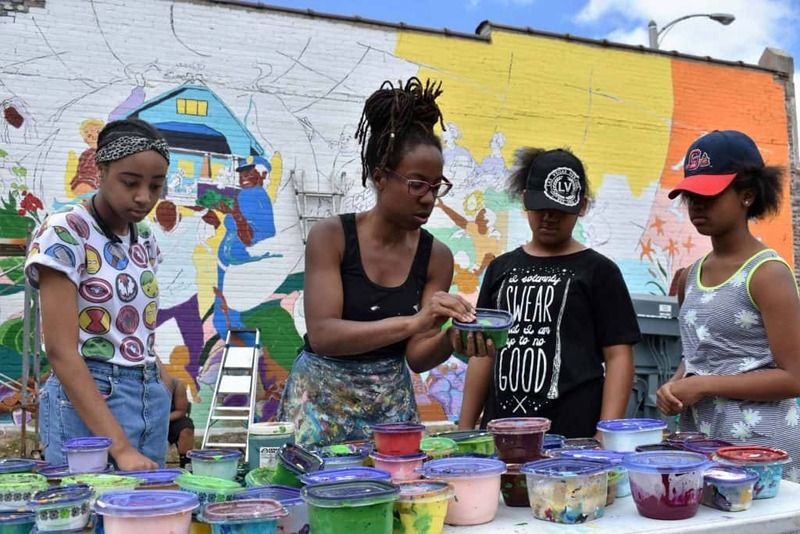 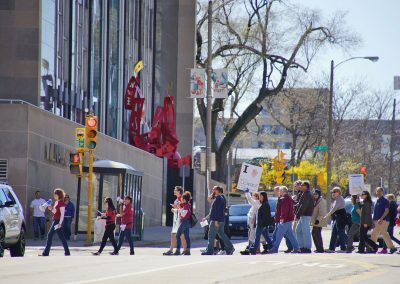 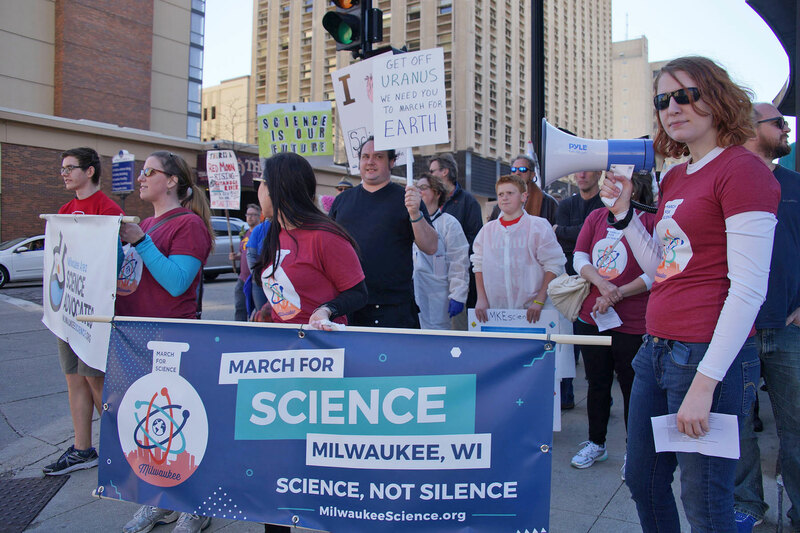 The march was an extension of the group’s mission to increase community engagement in Science Education, Public Health, and Sustainability in Milwaukee communities. 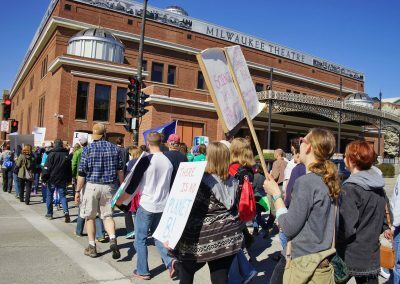 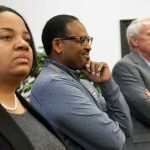 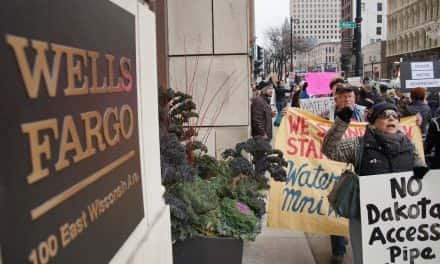 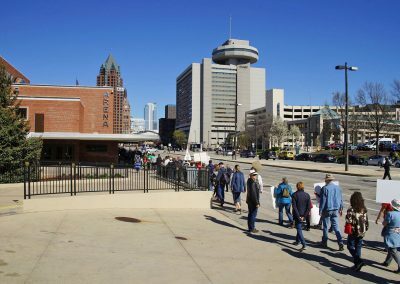 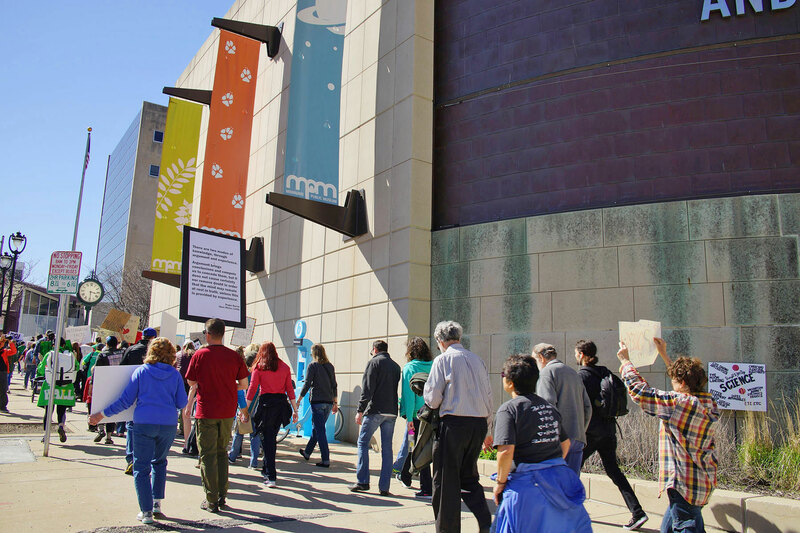 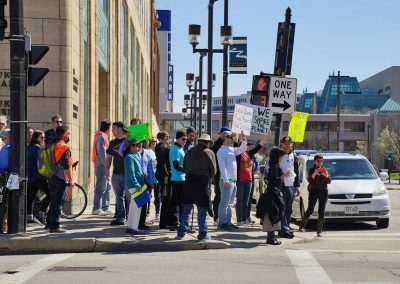 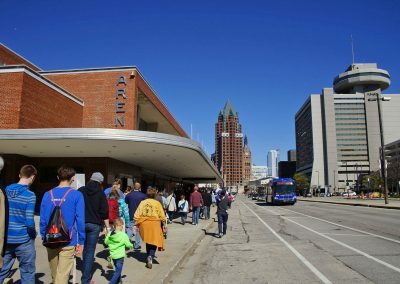 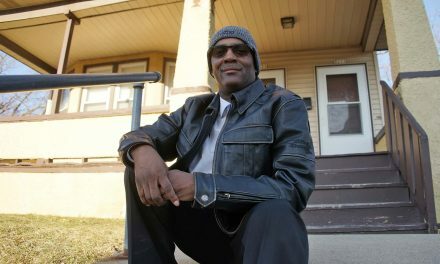 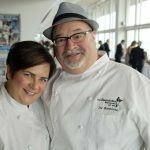 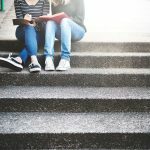 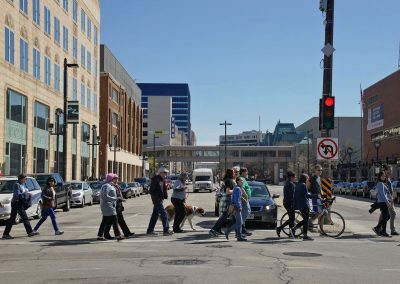 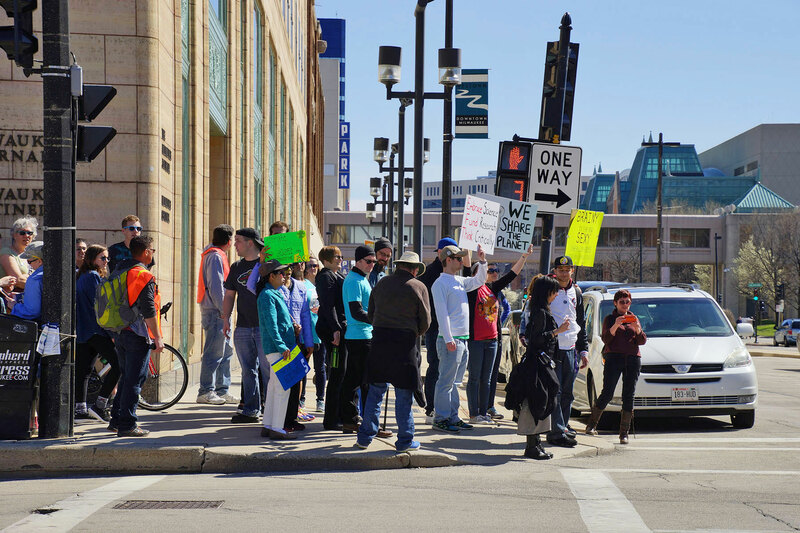 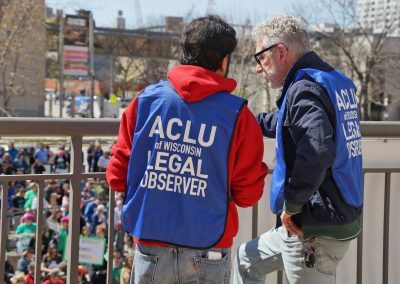 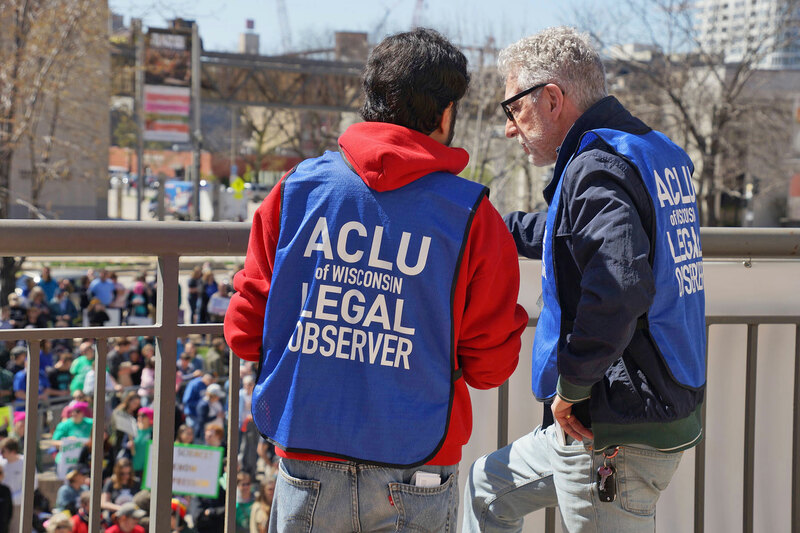 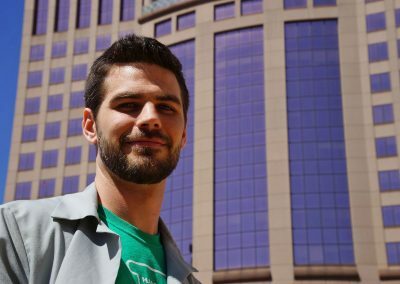 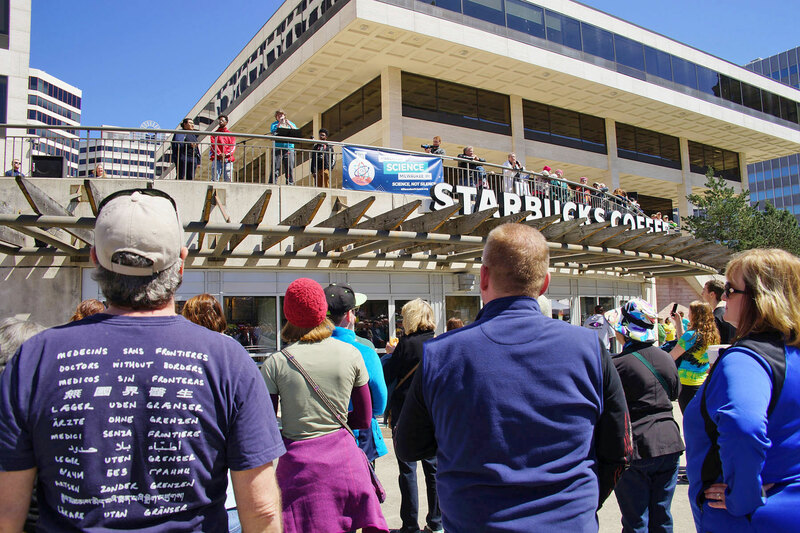 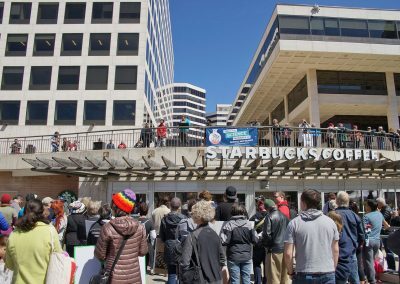 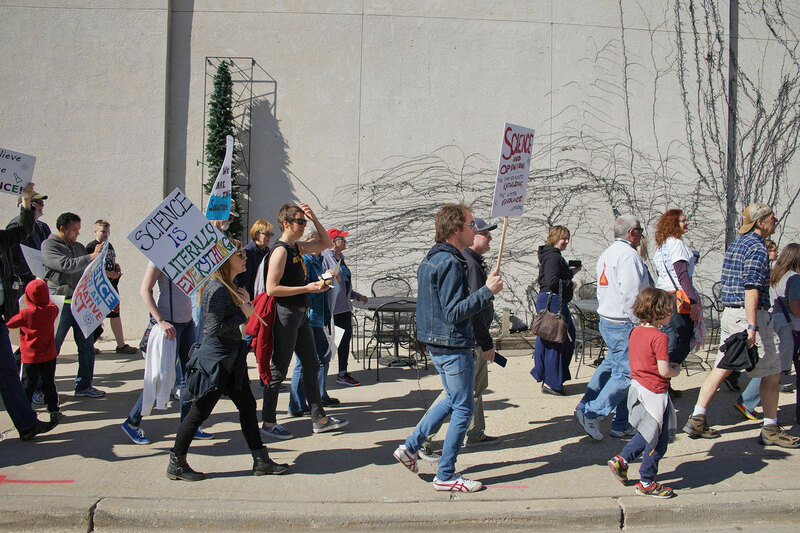 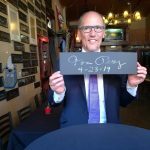 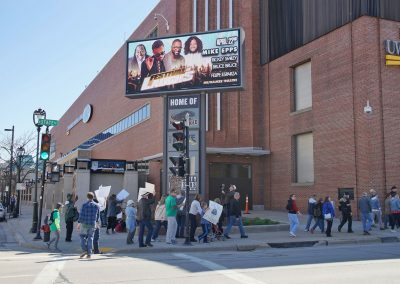 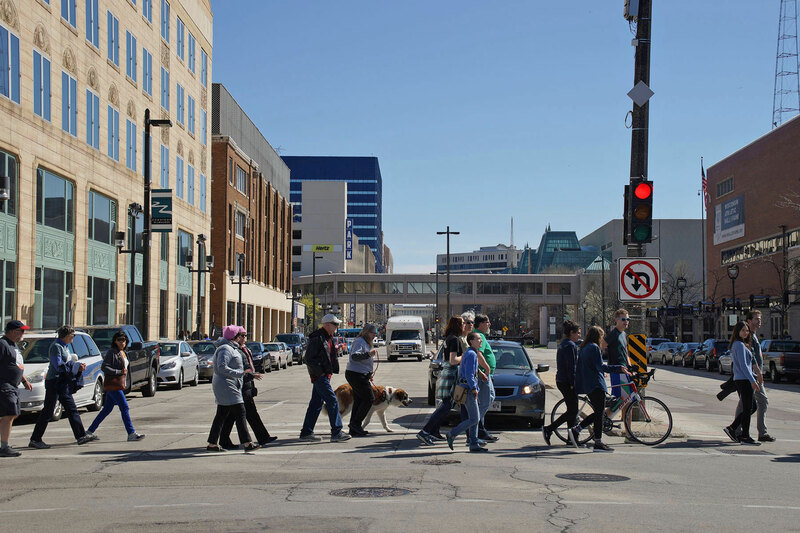 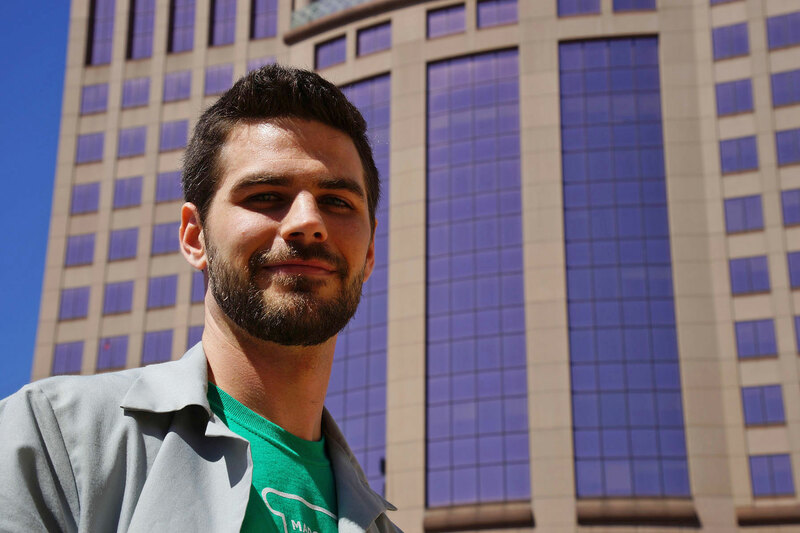 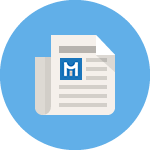 After the Milwaukee march concluded, participants were encouraged to attend meetups at various local establishments, with proceeds going to designated Milwaukee nonprofits. 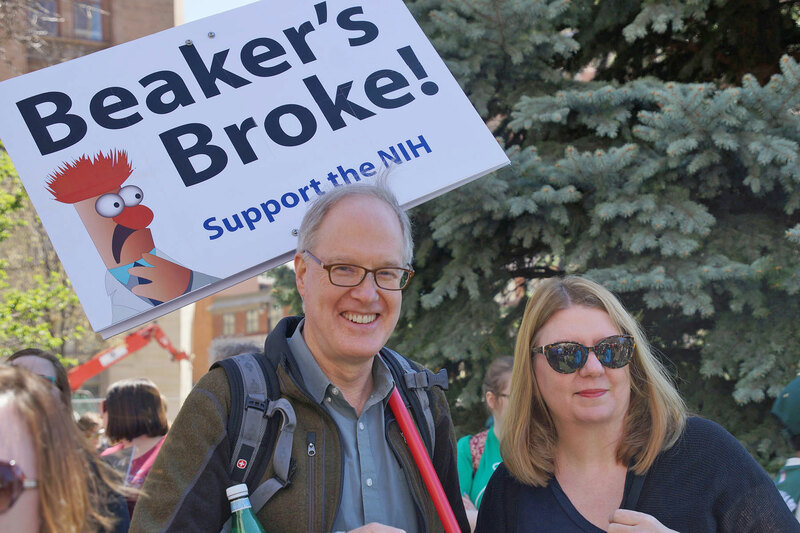 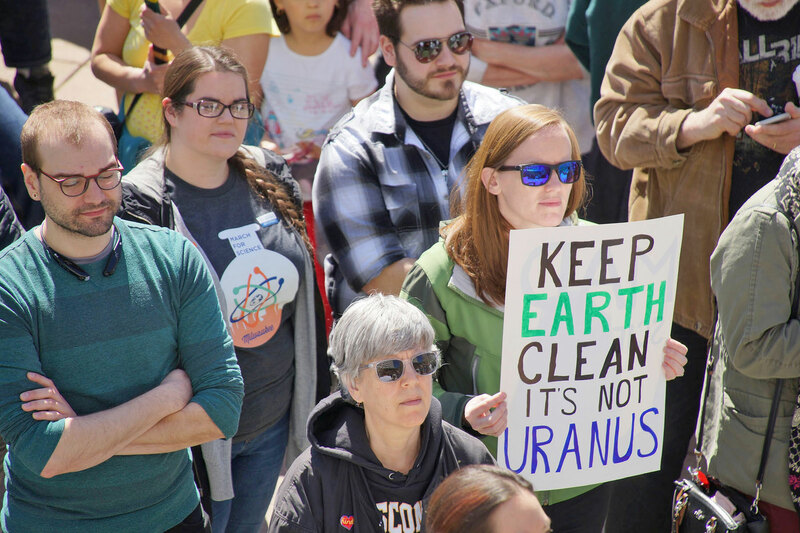 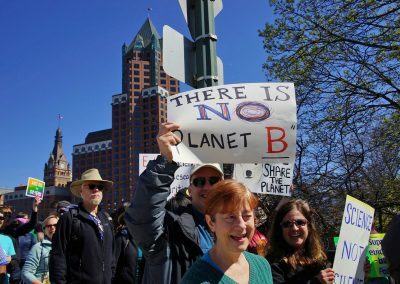 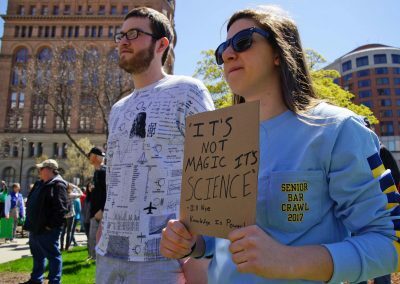 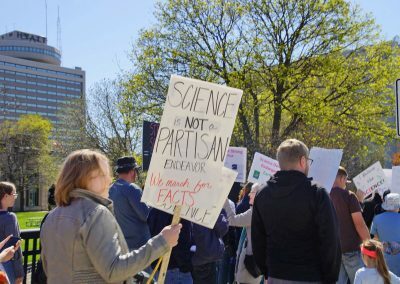 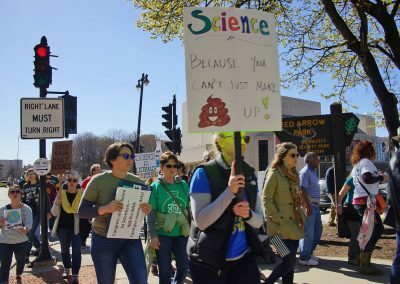 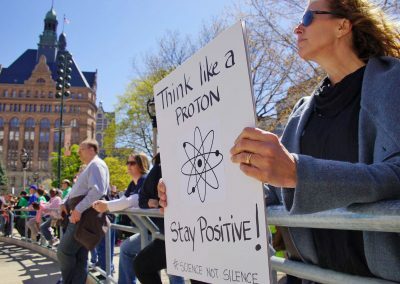 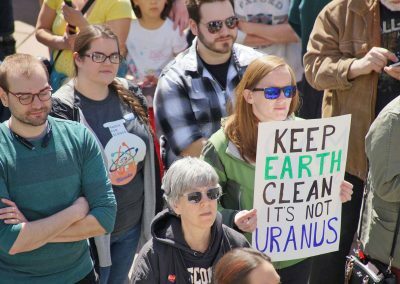 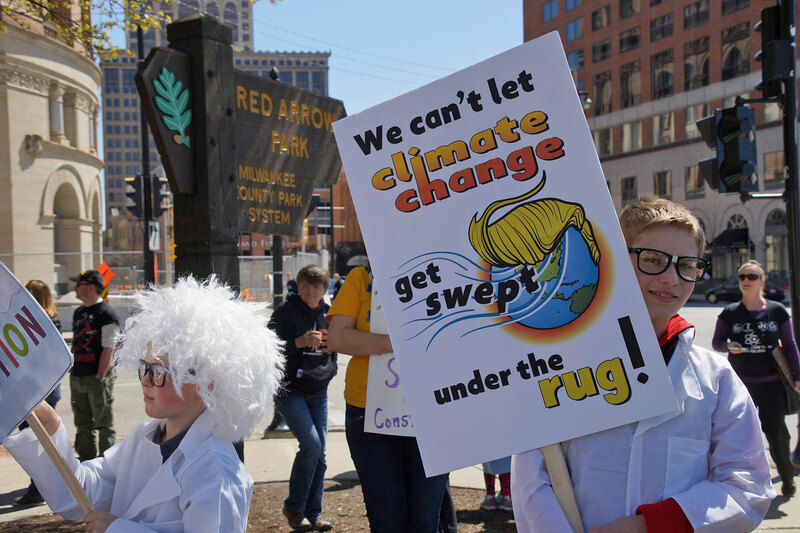 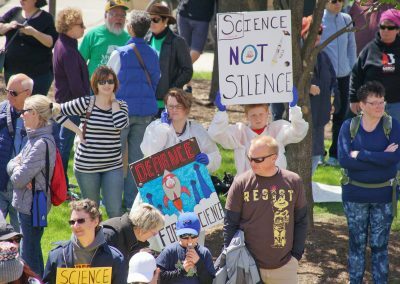 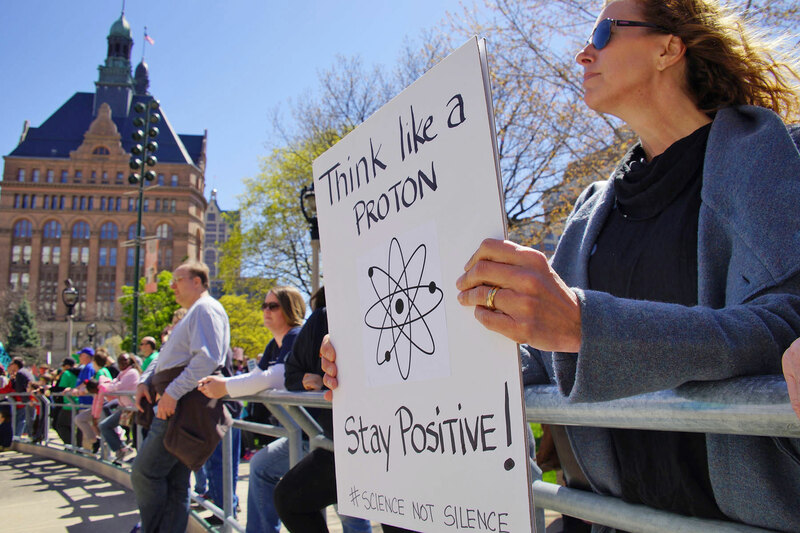 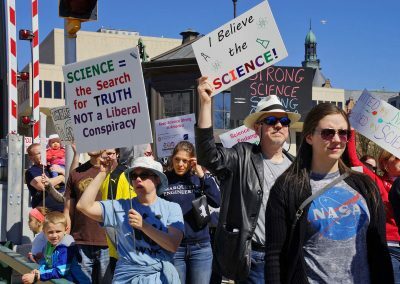 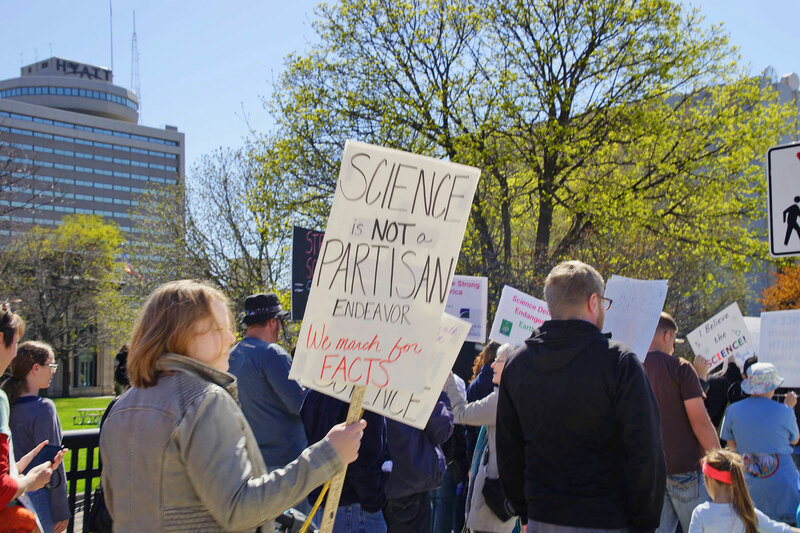 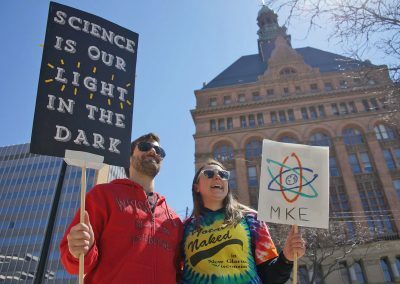 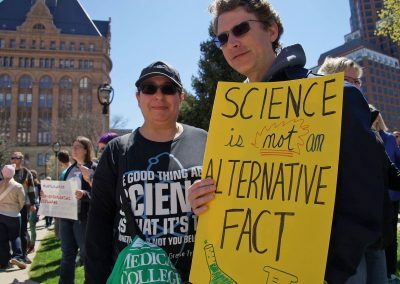 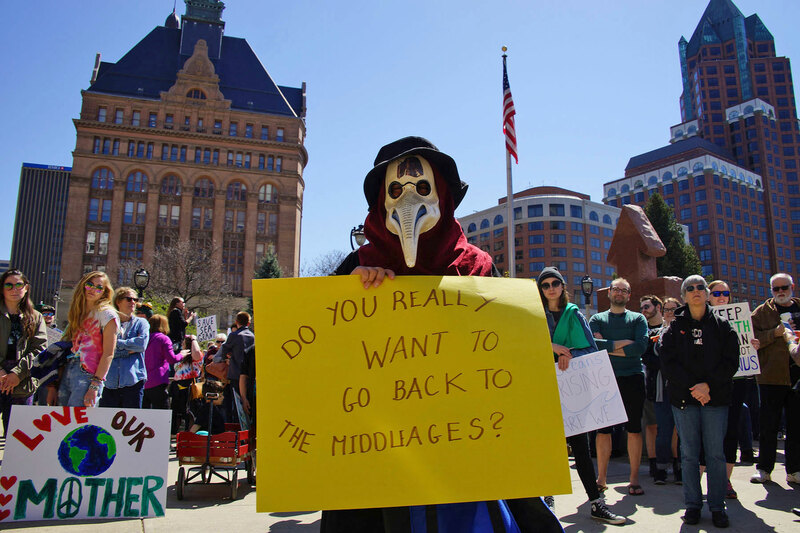 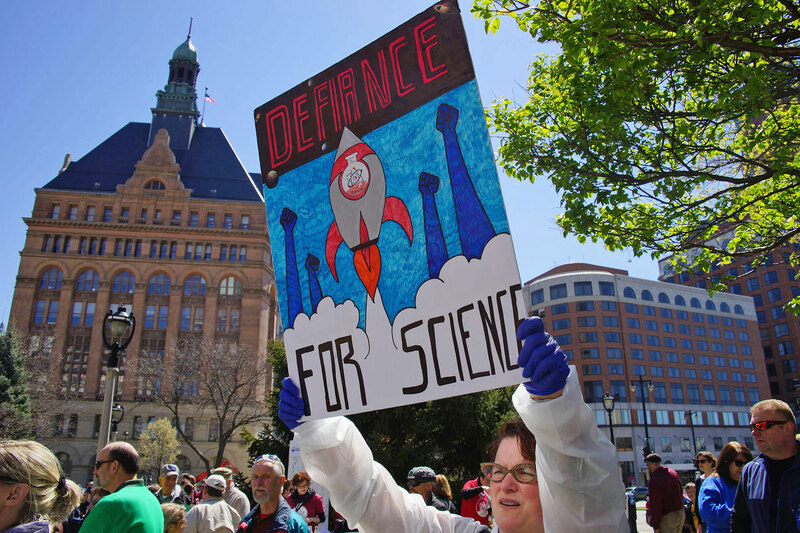 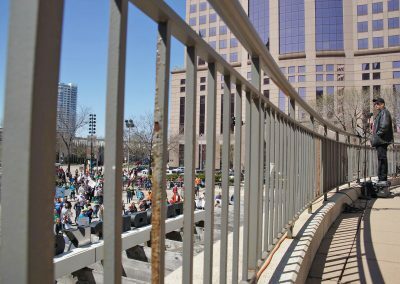 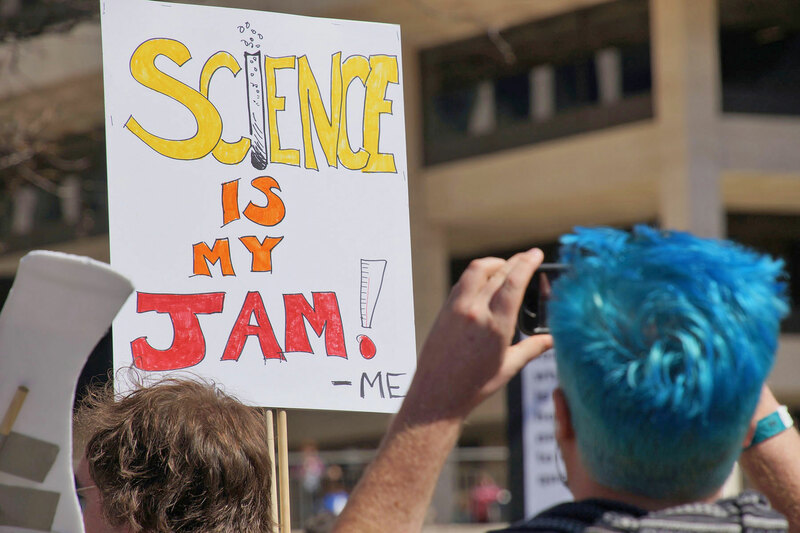 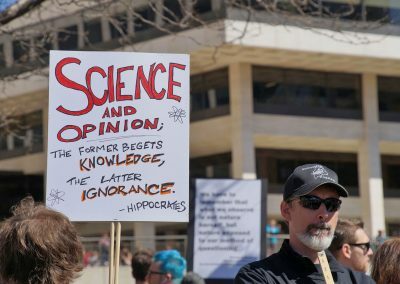 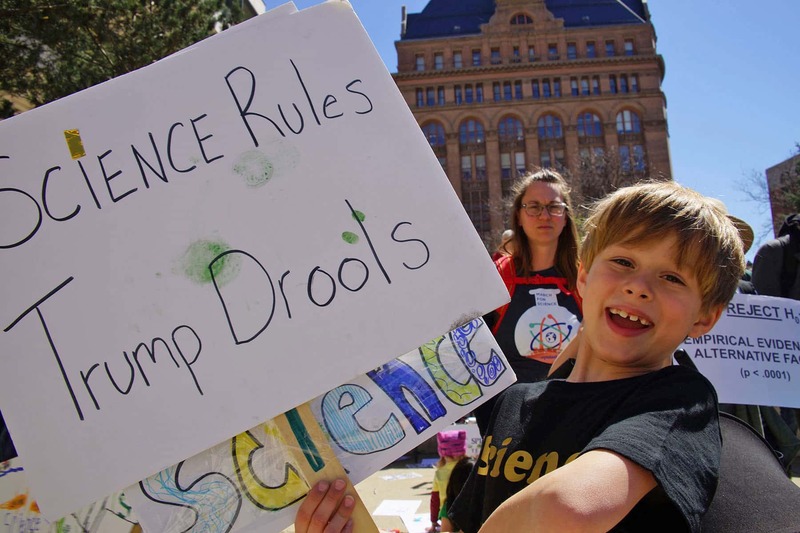 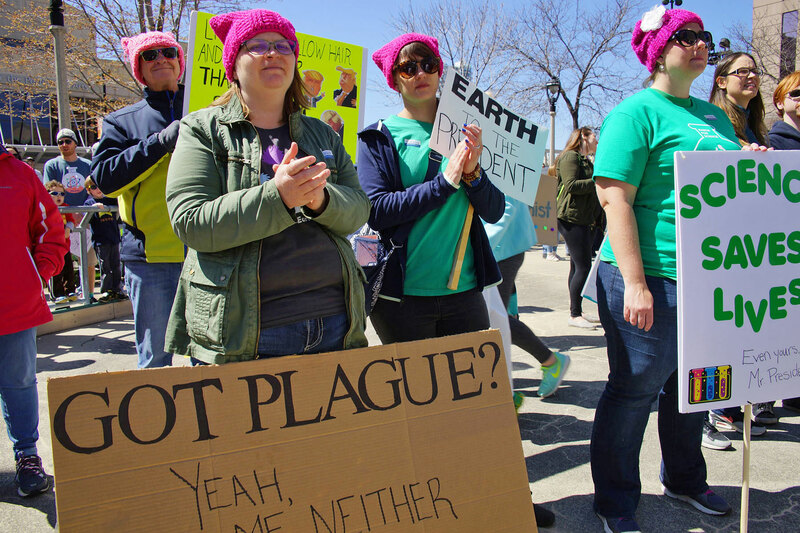 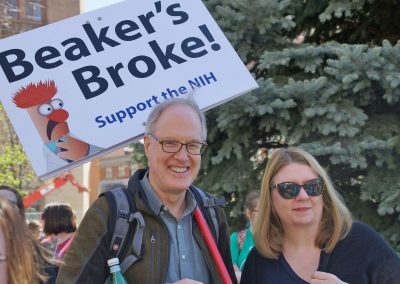 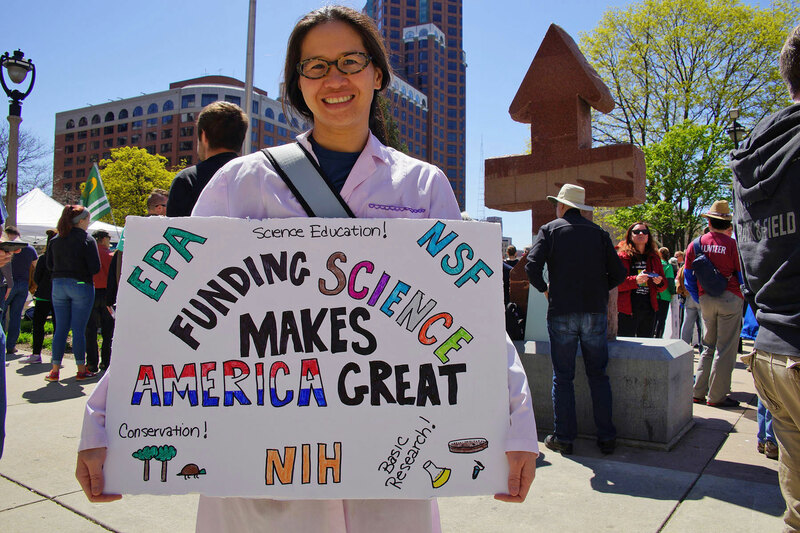 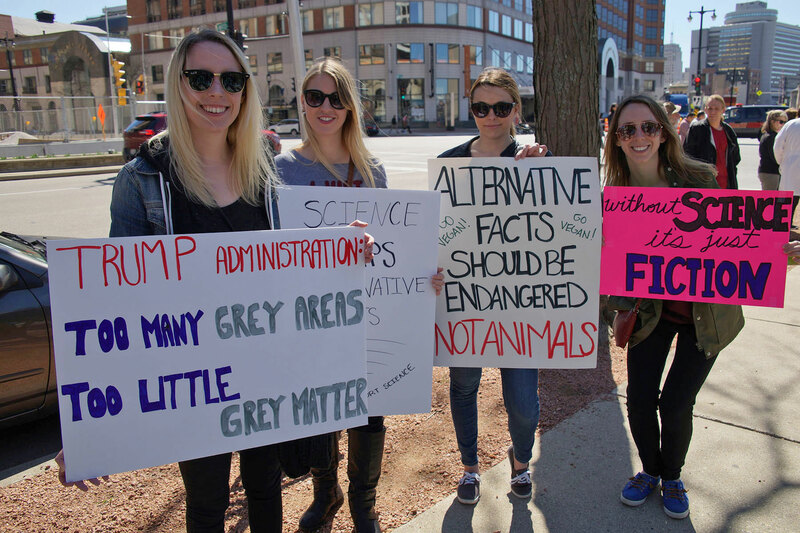 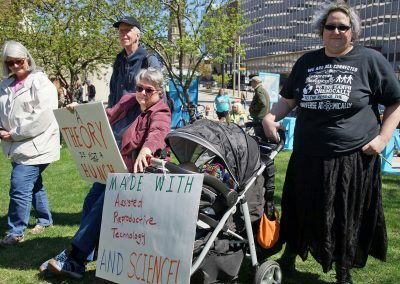 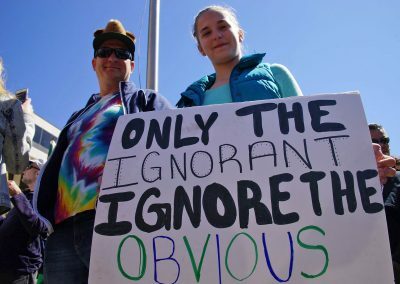 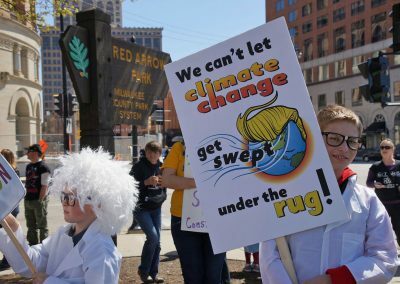 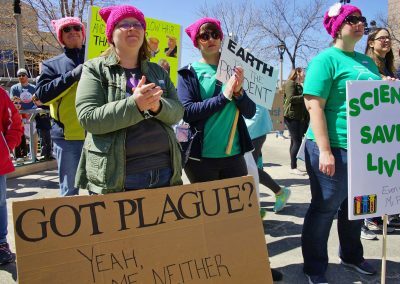 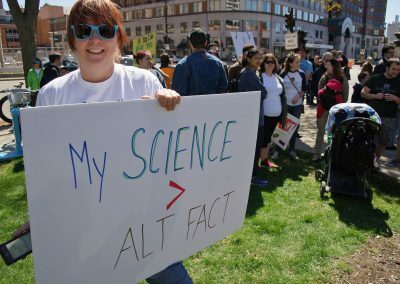 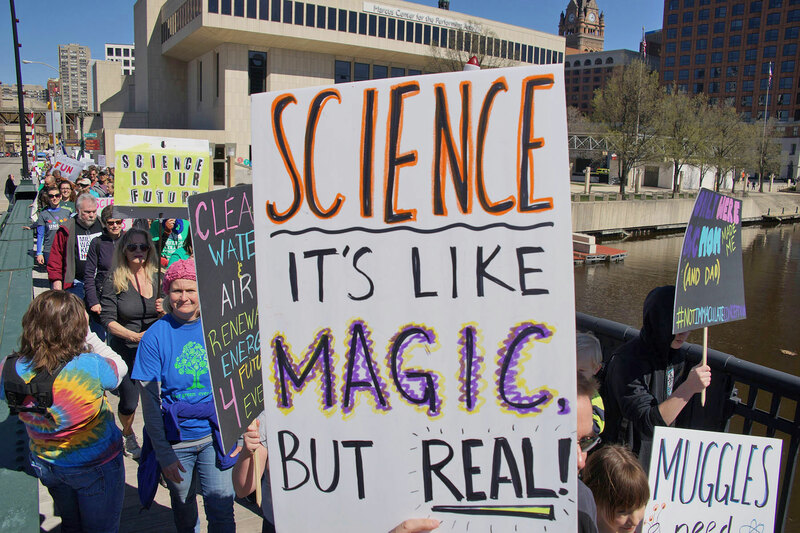 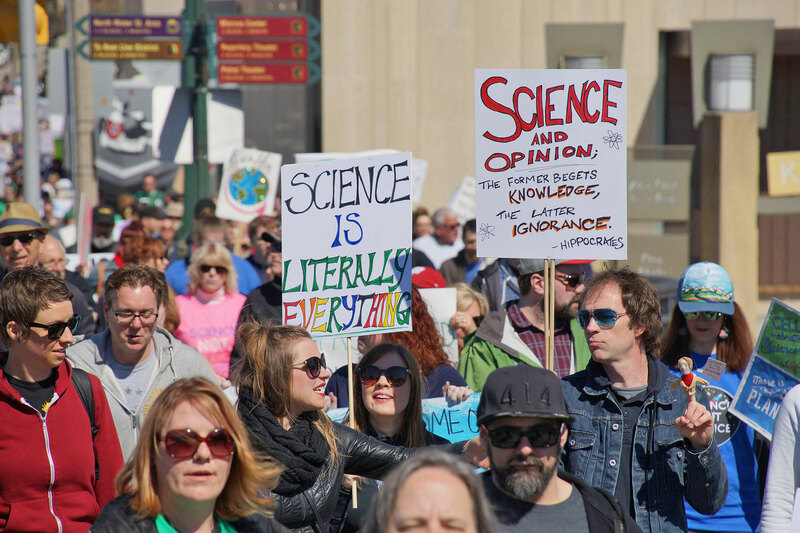 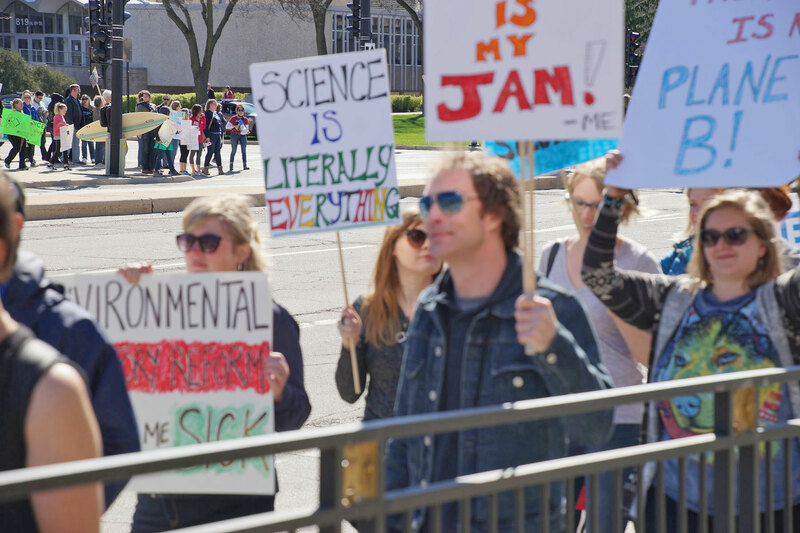 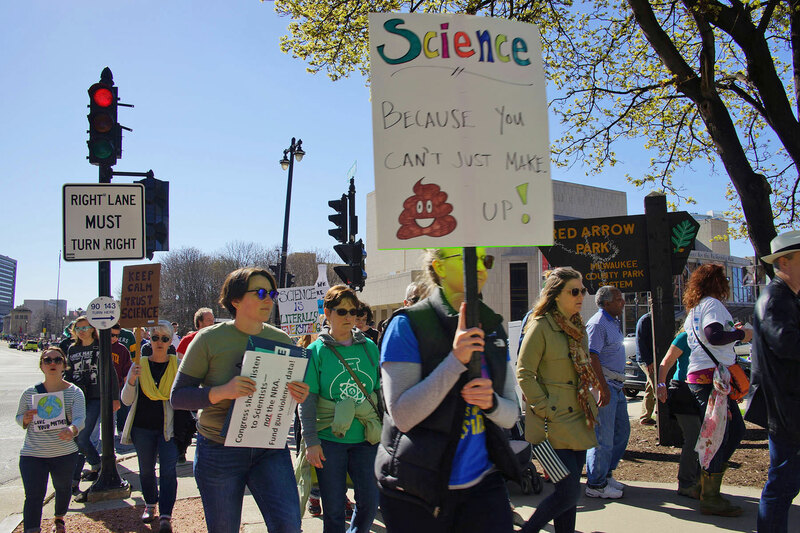 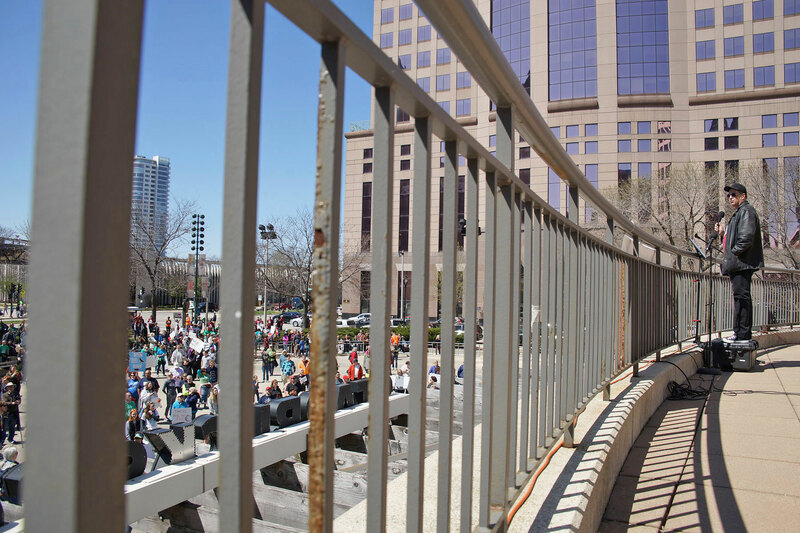 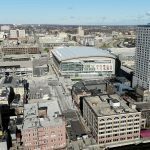 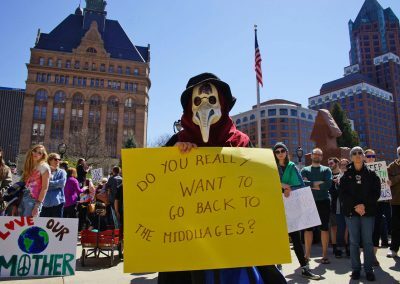 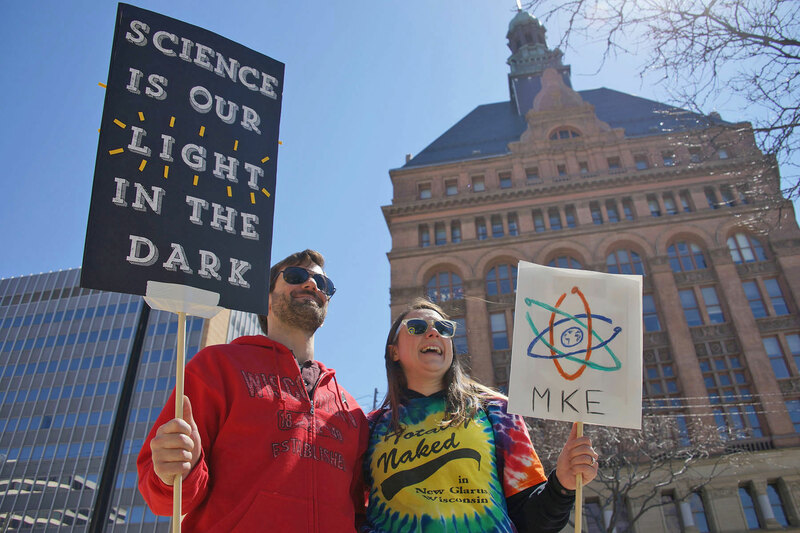 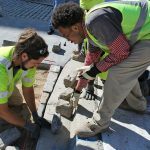 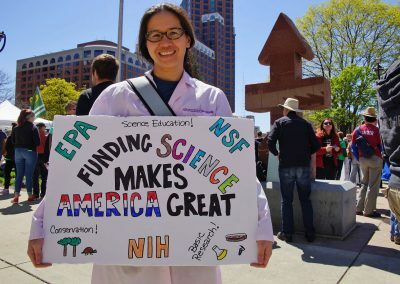 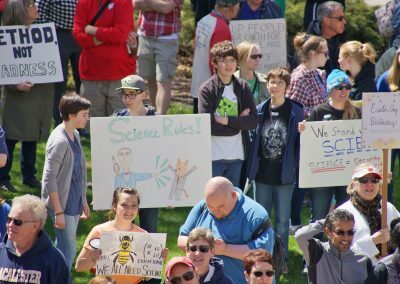 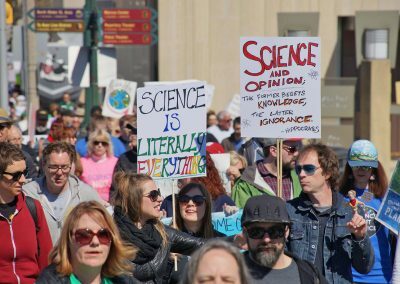 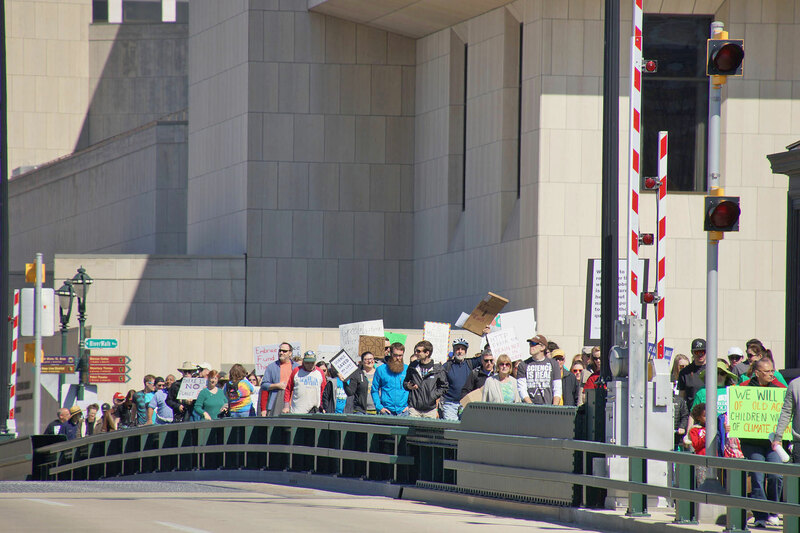 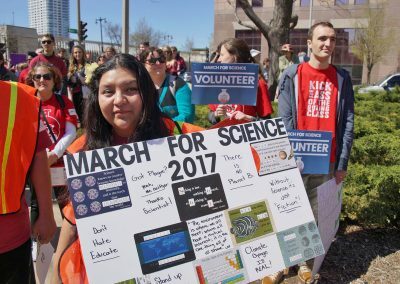 These images feature an extensive collection of signs from the pre-march rally, and sights along the March for Science route through downtown as Milwaukee residents showed their support for knowledge.